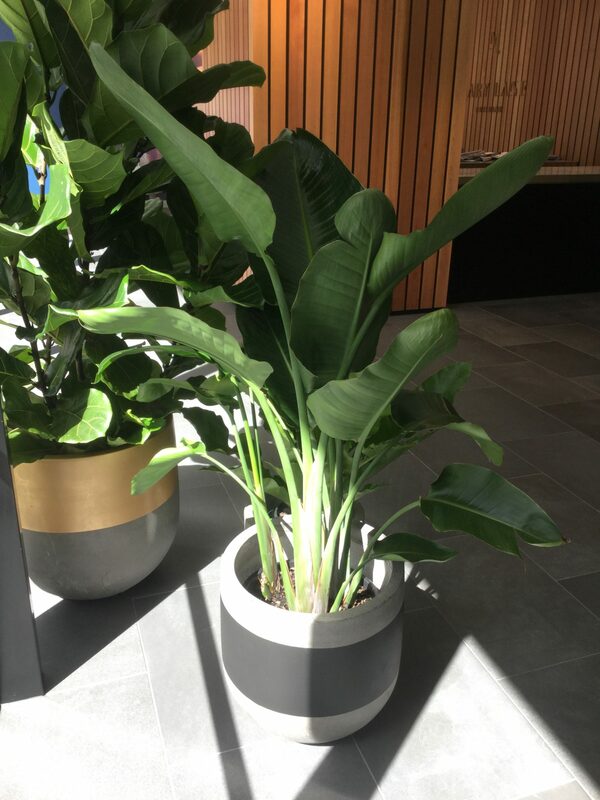 Commonly named “bird of Paradise” because of the resemblance of its flowers to exotic birds themselves, this native plant to South Africa has large paddle shaped leaves that emerge from a central frond and fan out with dark evergreen foliage that resembles small banana leaves. 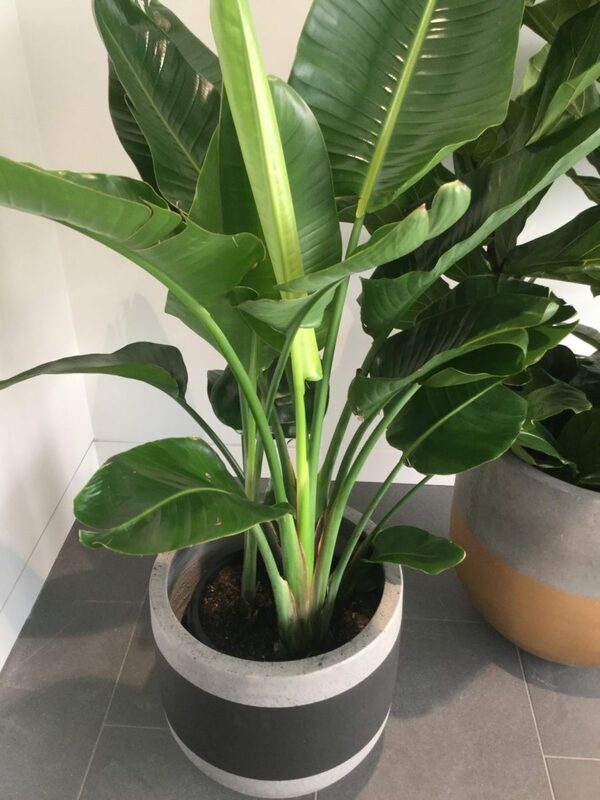 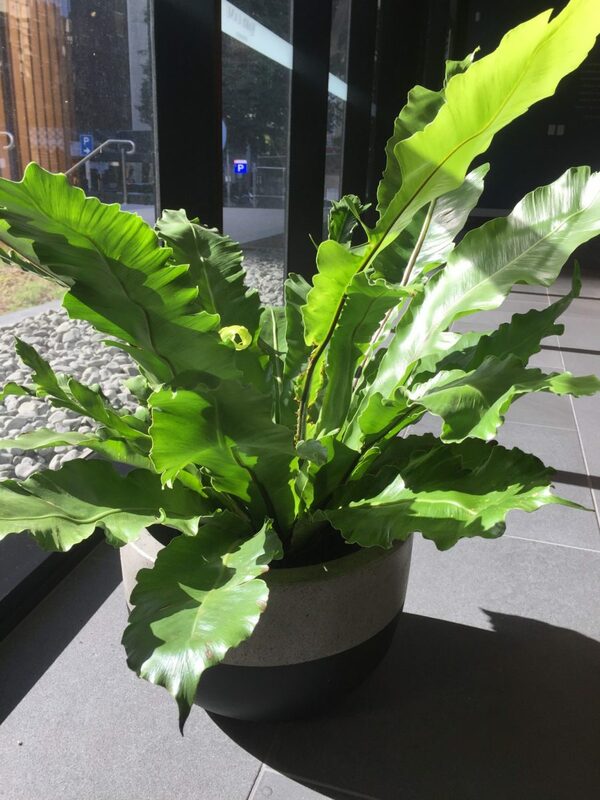 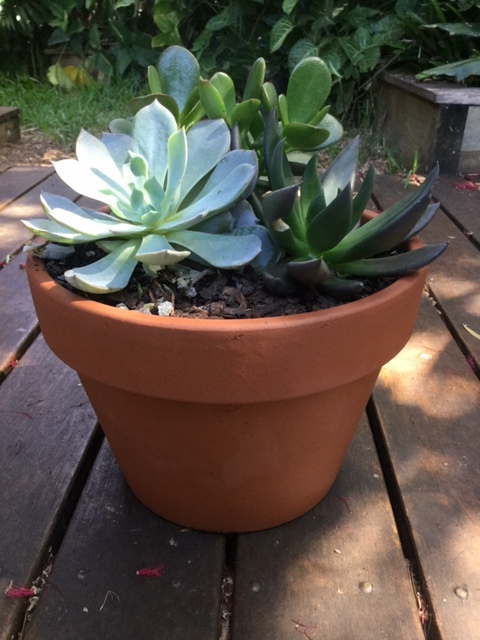 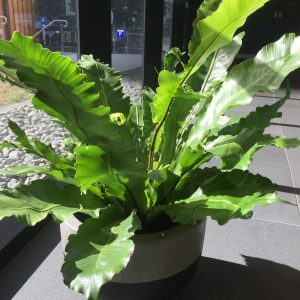 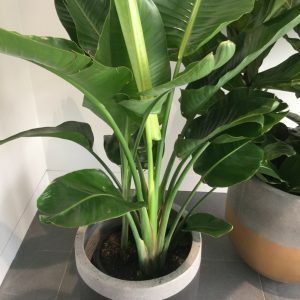 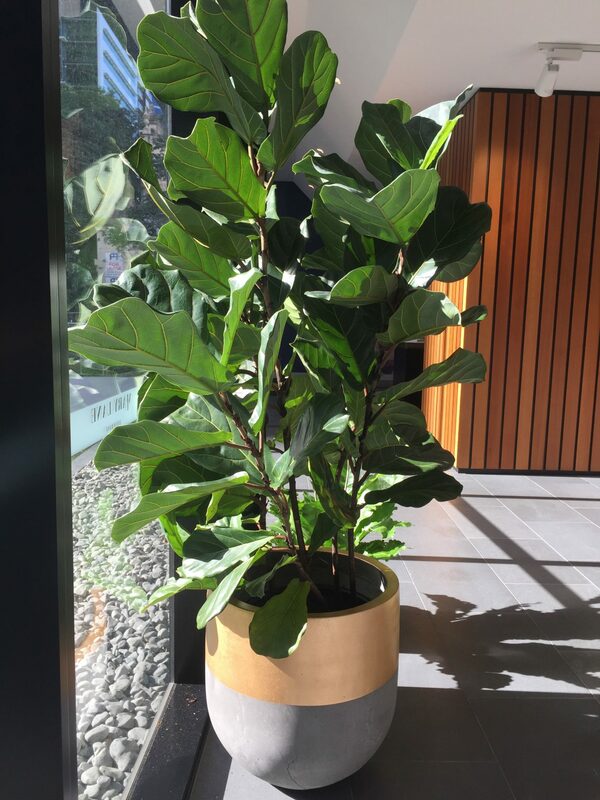 Used as an indoor plant for its unique form, the thick, leathery leaves are highly attractive but only in high light levels may flowering in an internal situation occur. 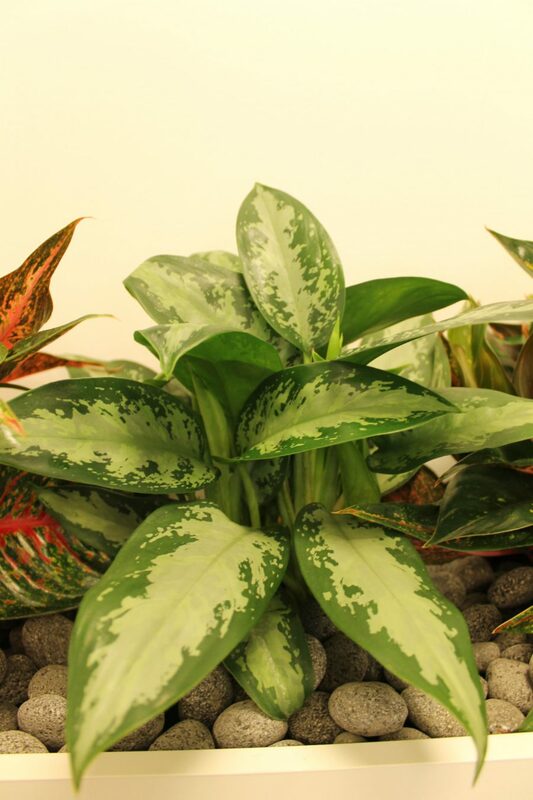 These interesting and beautiful foliage plants come from the tropical America’s and grow in a natural rosette form with strappy leaves around a central “cup”. 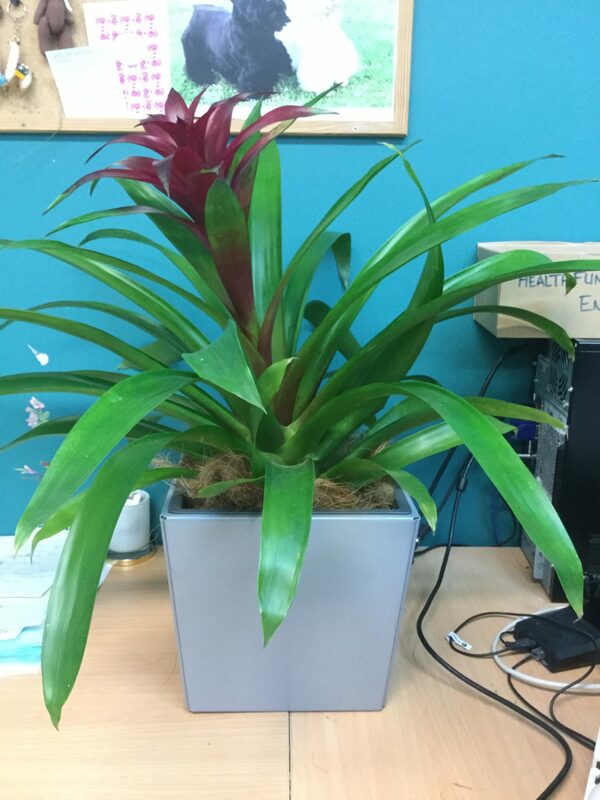 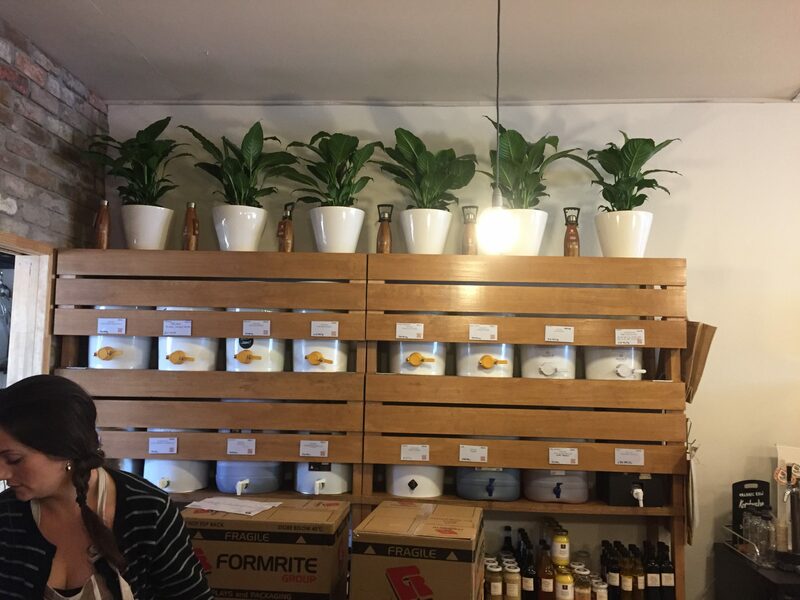 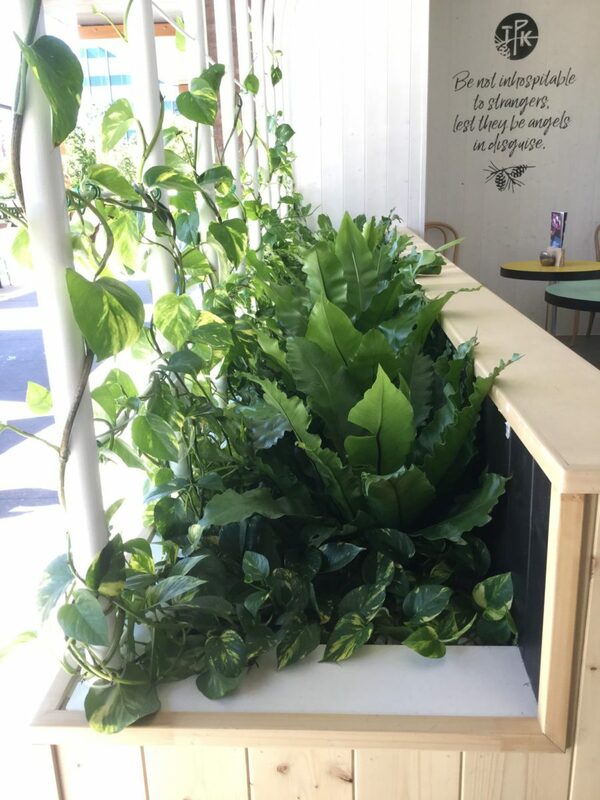 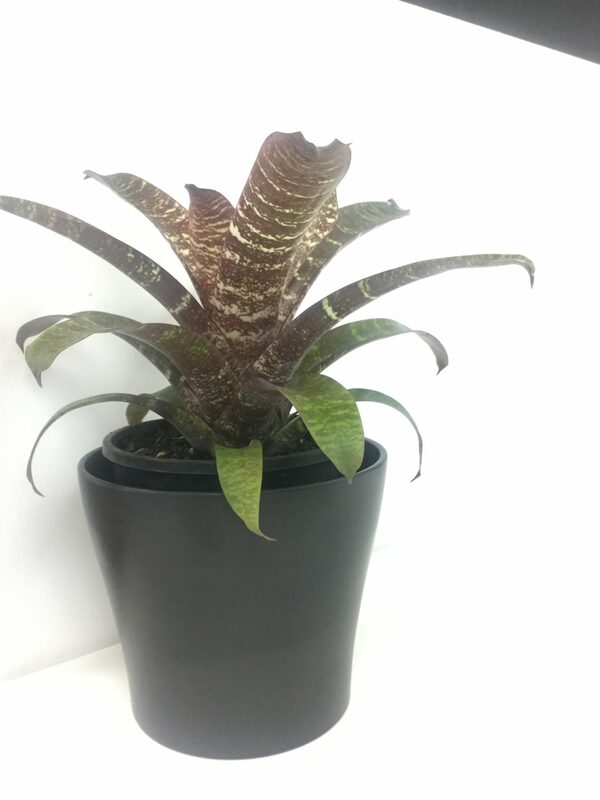 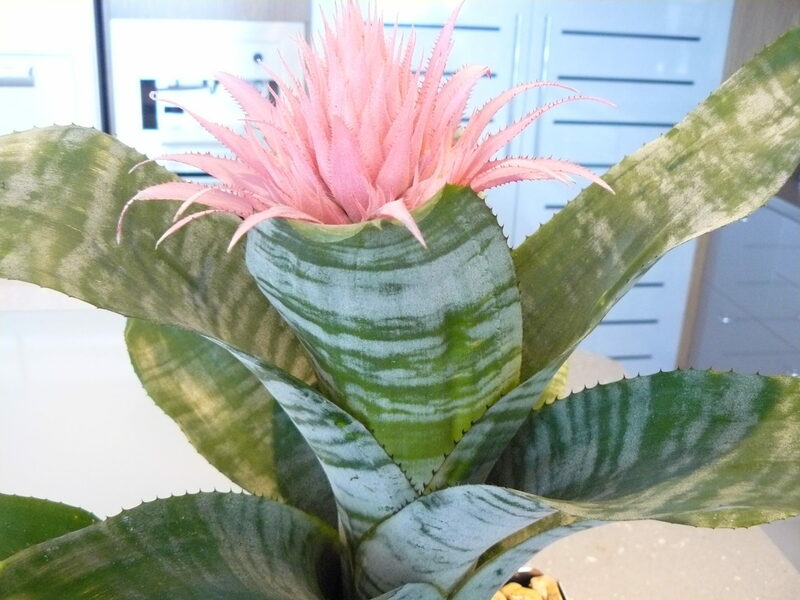 Bromeliad species can vary dramatically and come in many different leaf shapes (most commonly wide leaves are used indoors) and can have long lasting showy flower displays that provide an exotic touch to any indoor environment. 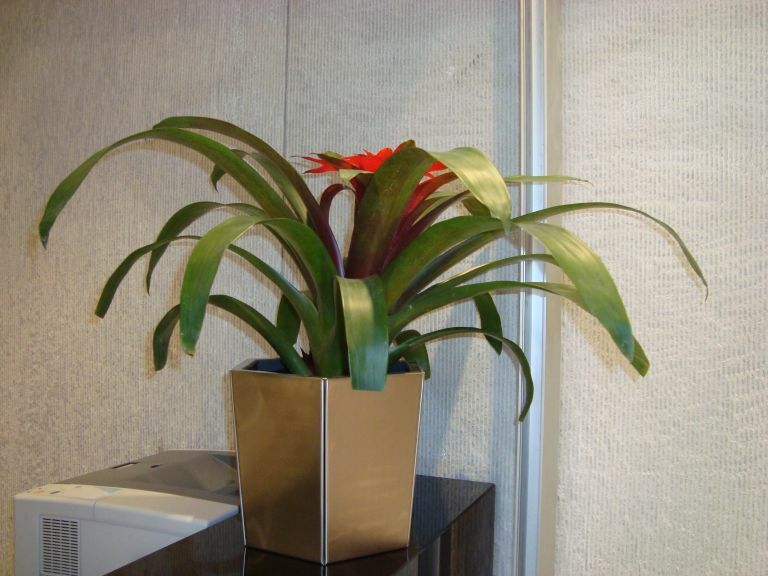 The flower colour and form will vary widely amongst each variety. 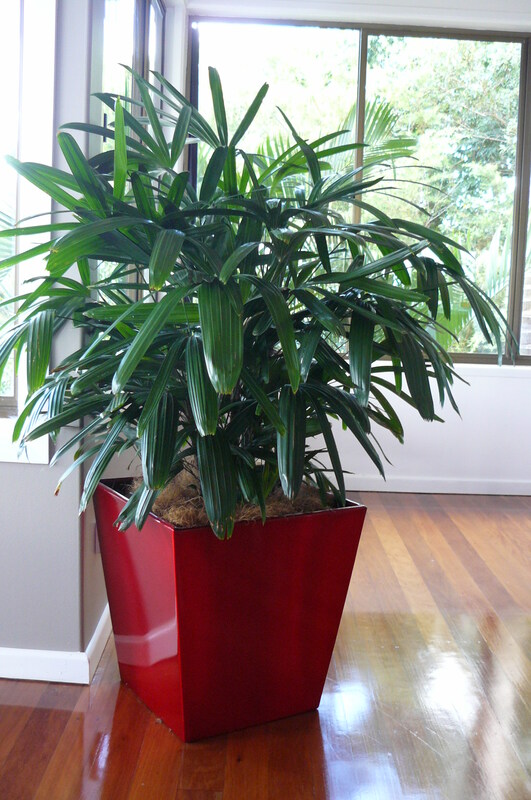 The attractive fronds on this species coil tightly in the centre prior to opening, resembling a nest. 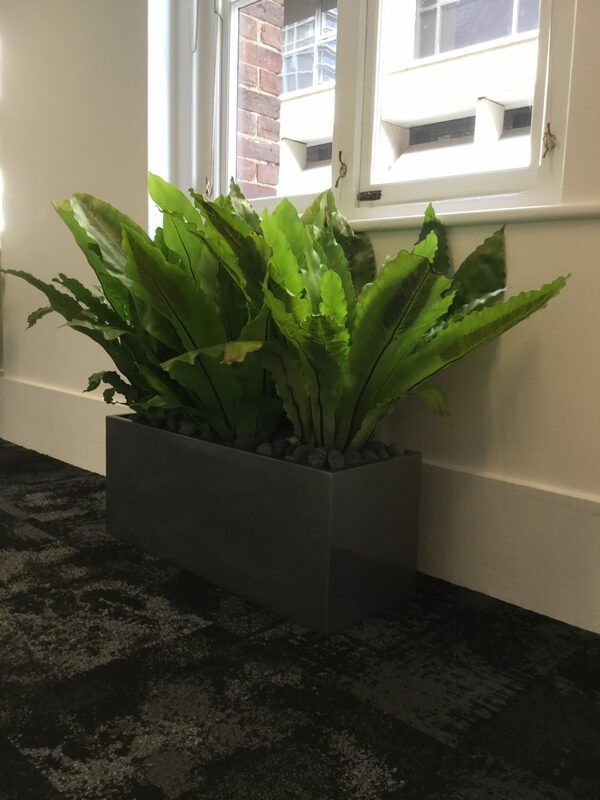 The fronds are spear like in shape and are often quite shiny with a wavy outer and brown mid rib running through the centre of the frond. 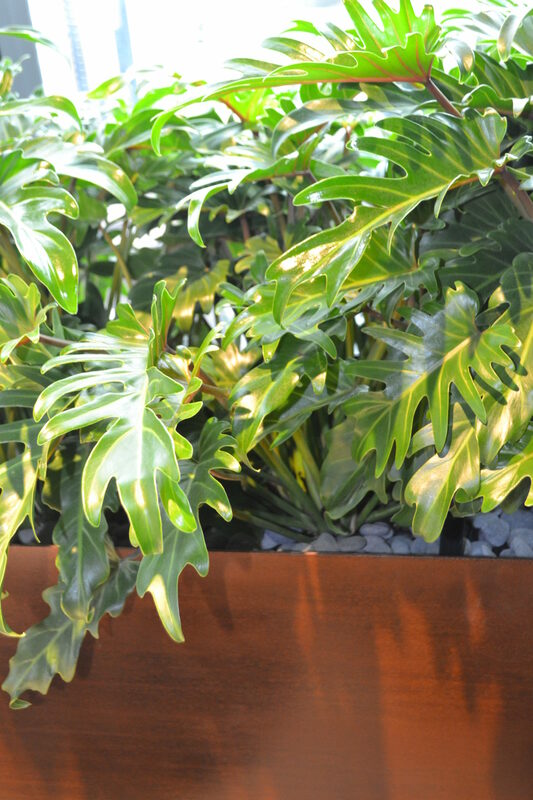 The many arching fronds of this fern make it ideal for hanging baskets. 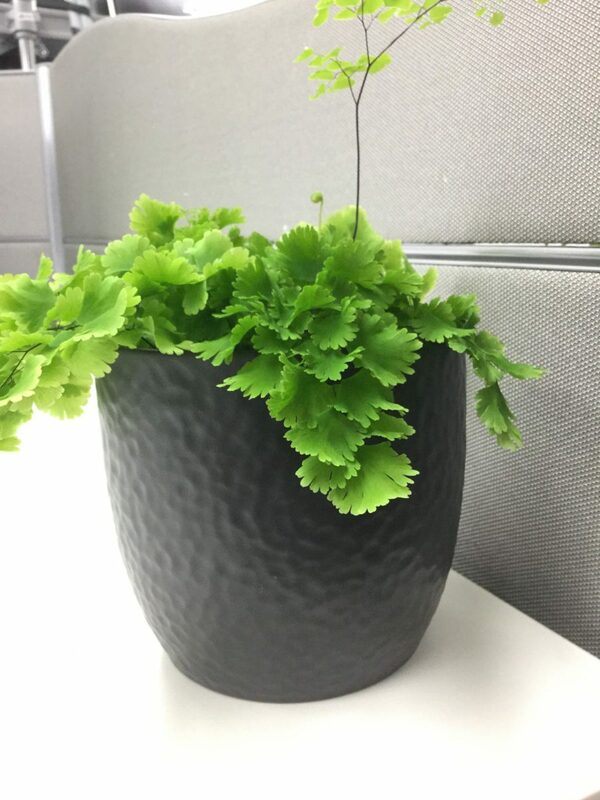 It has a feathery appearance with small leaves covering a tough leaf stalk. 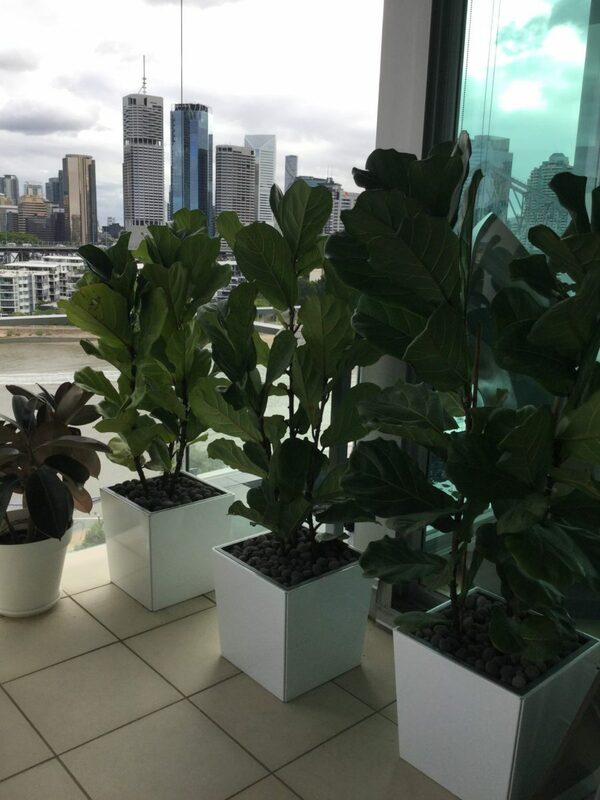 Collectively known as fig trees or figs, these plants are native throughout the tropics, including Australia, Asia, America and Africa. 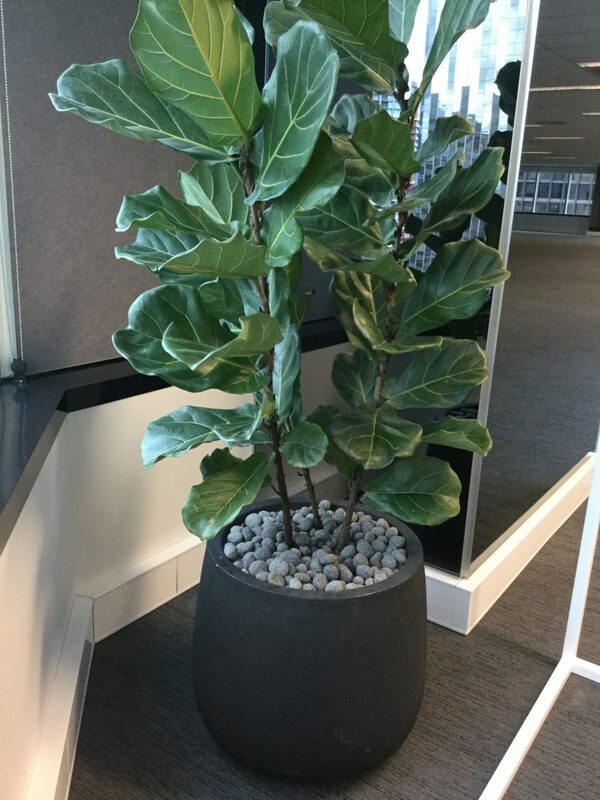 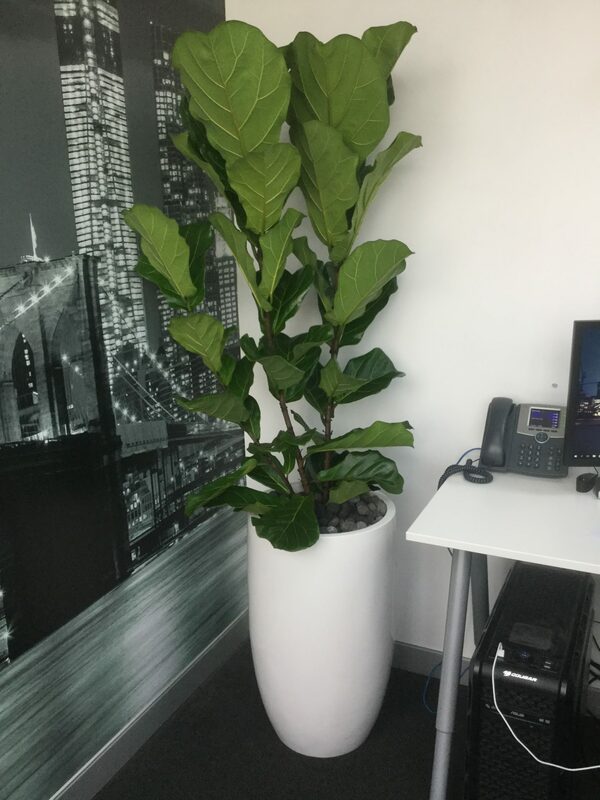 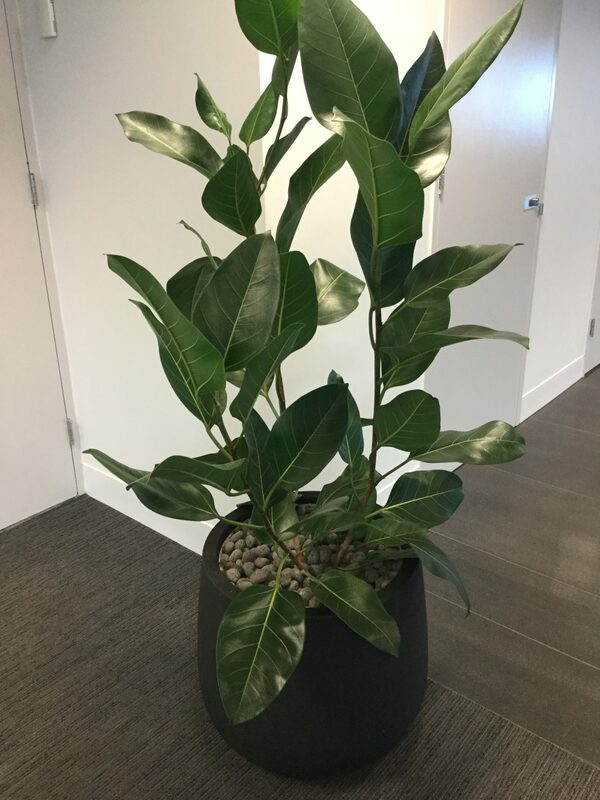 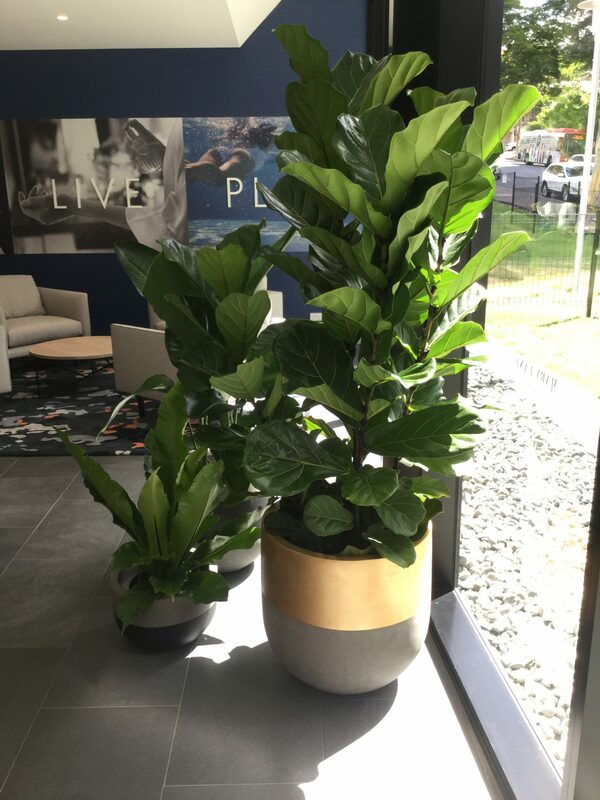 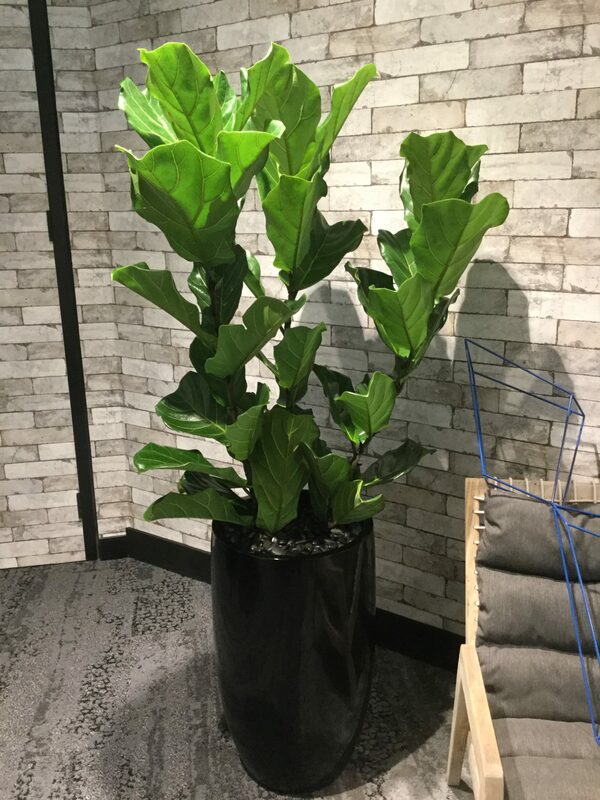 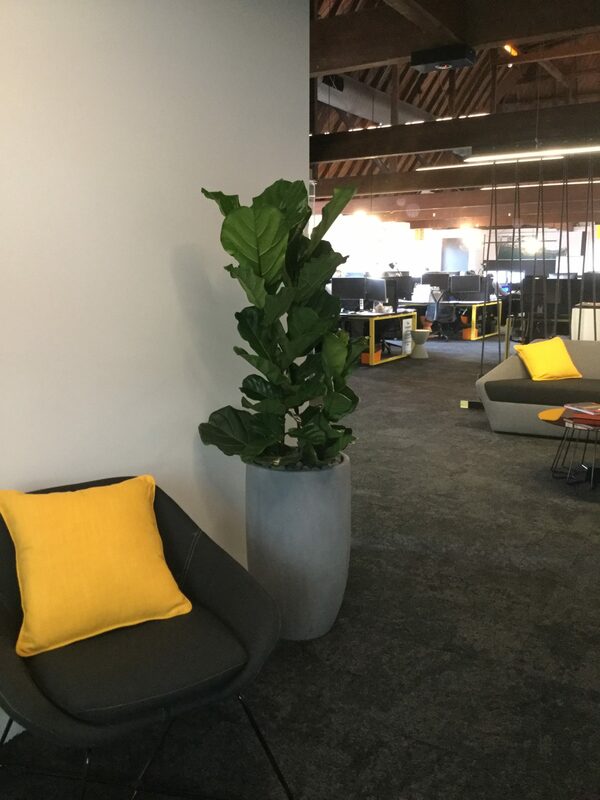 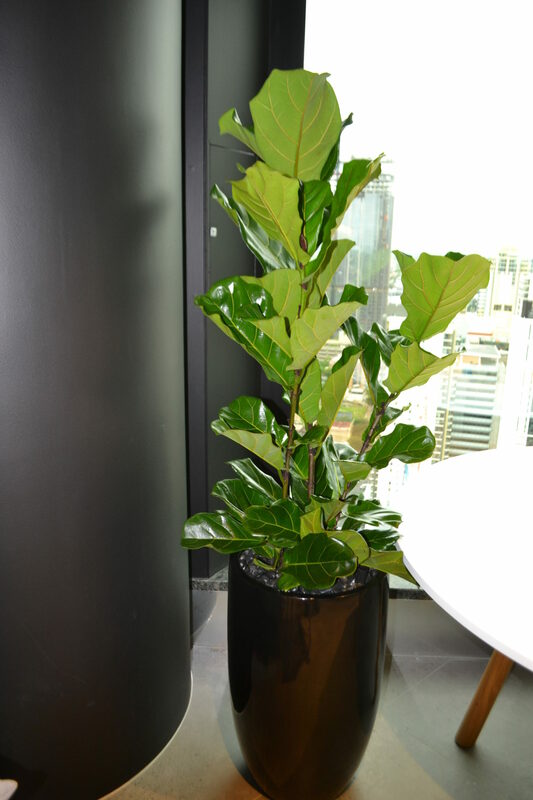 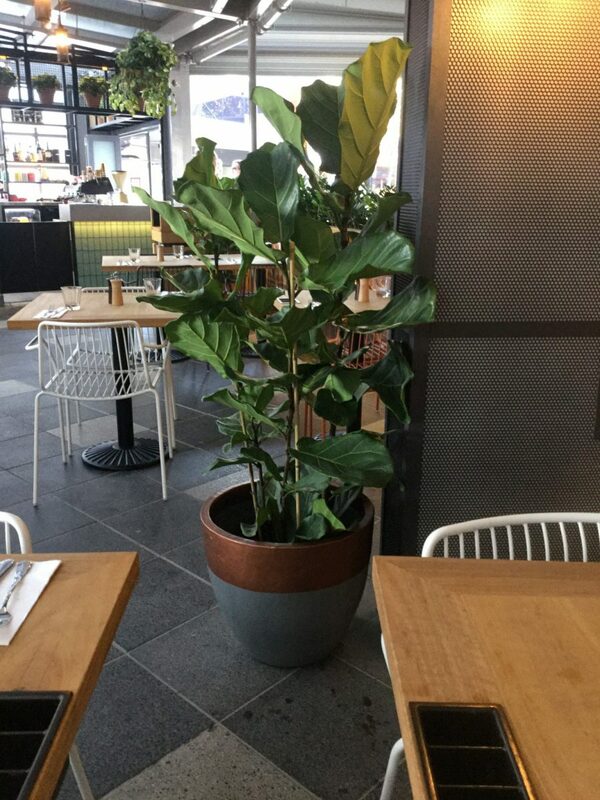 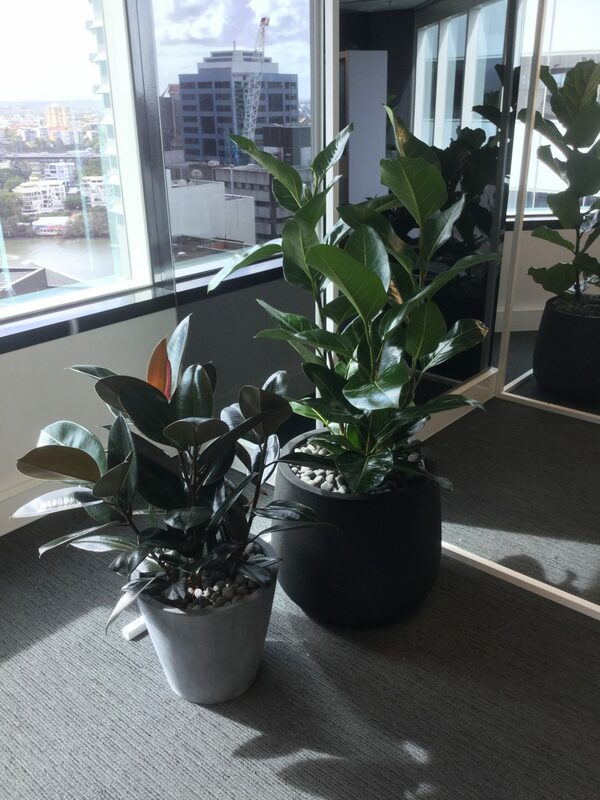 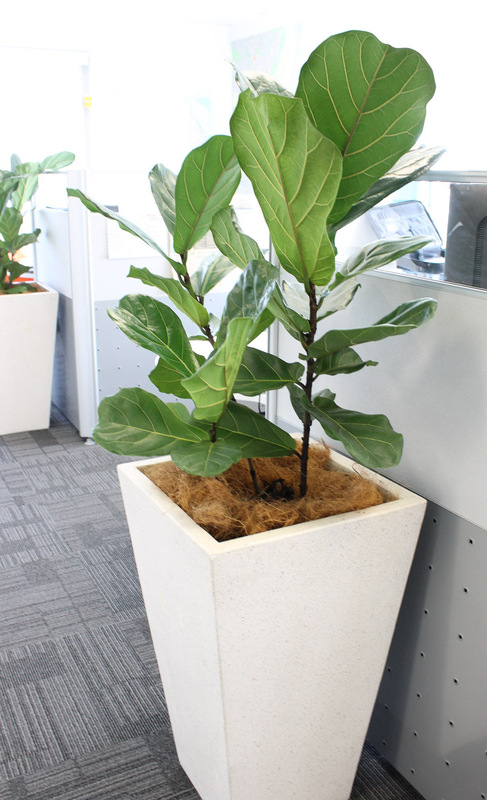 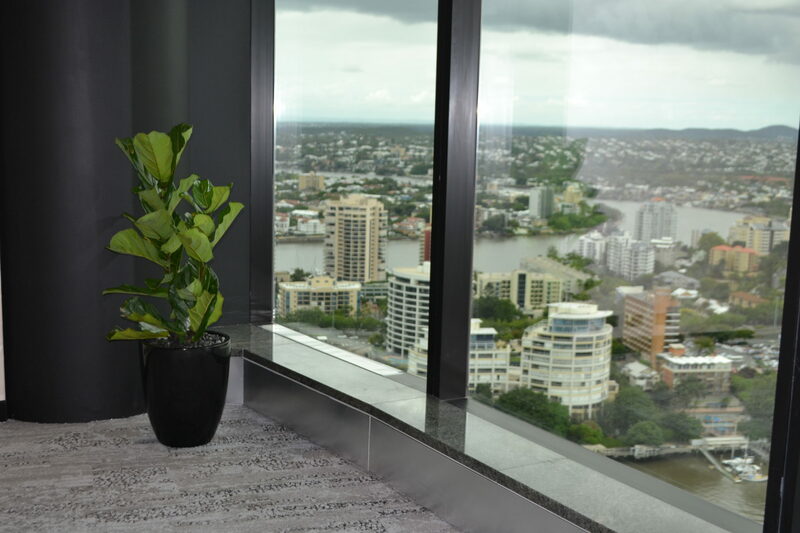 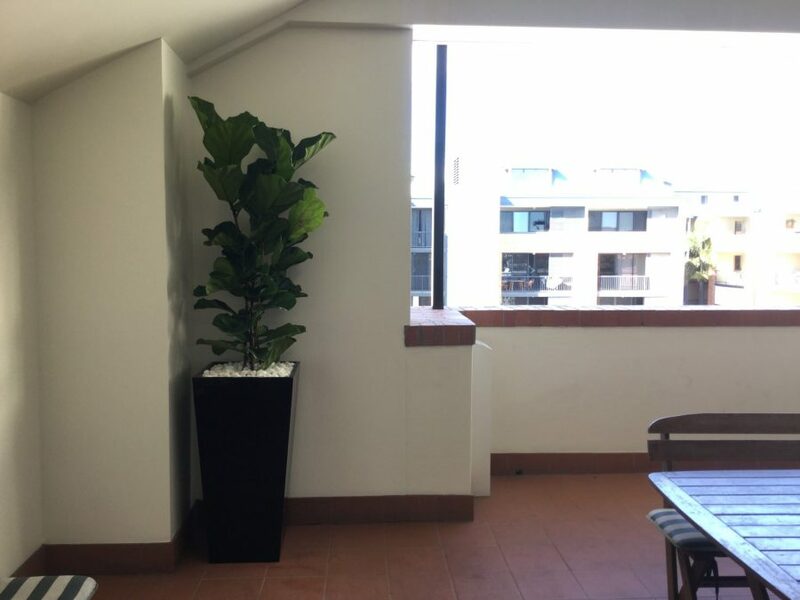 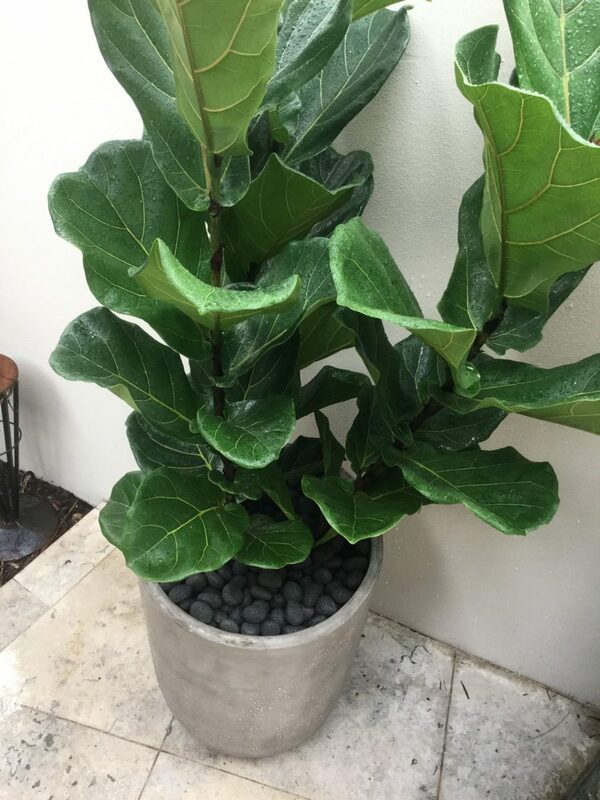 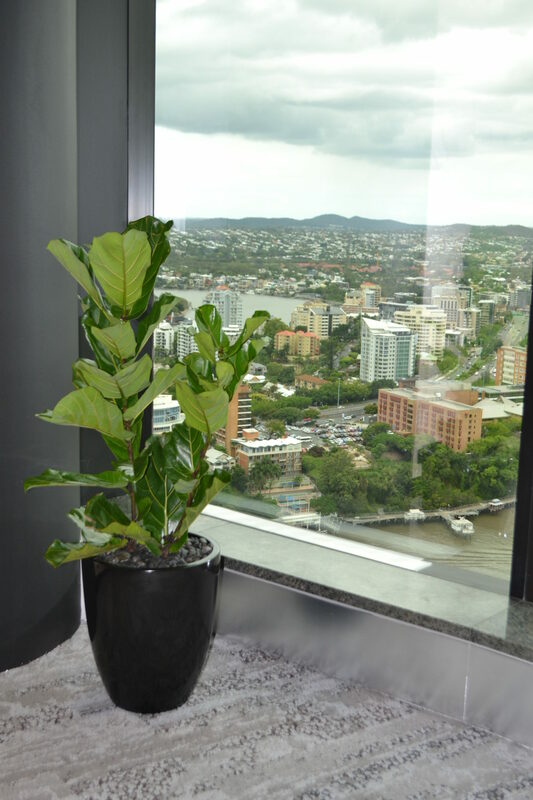 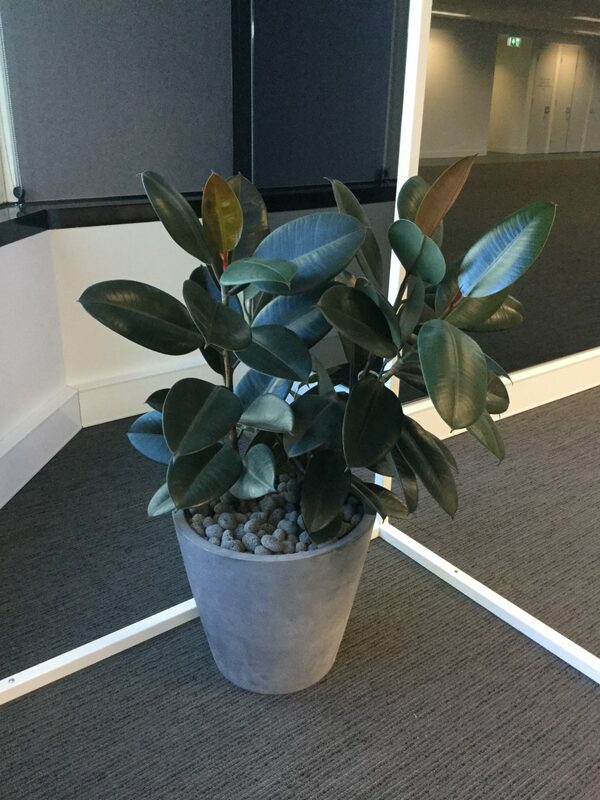 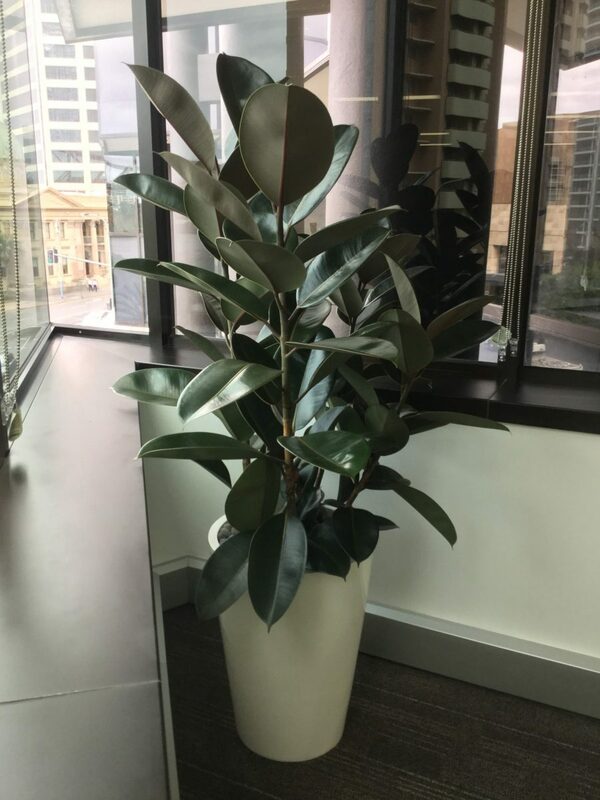 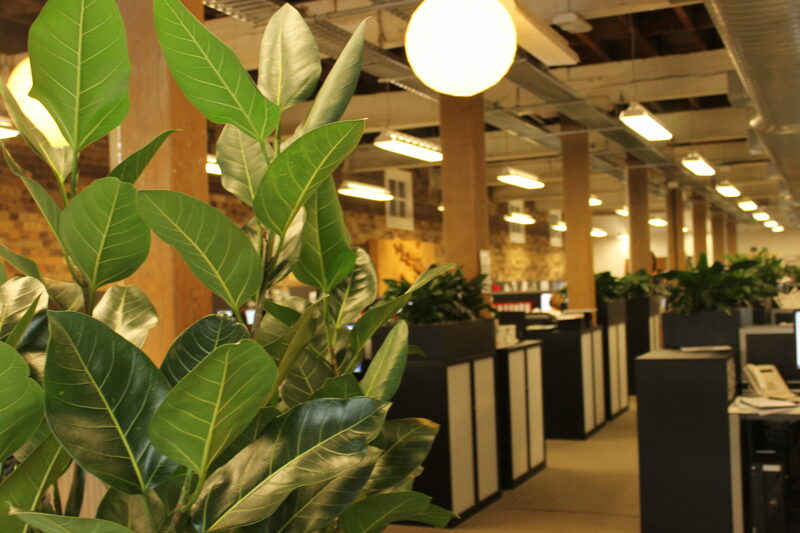 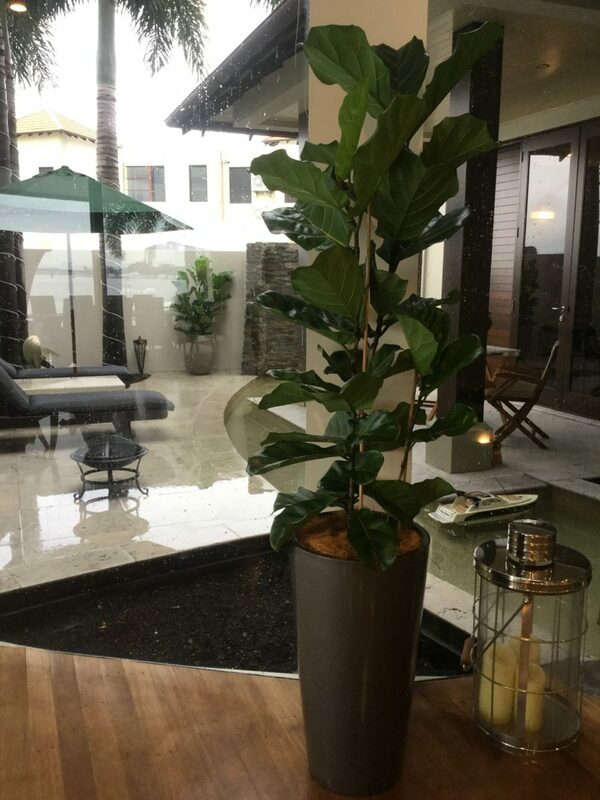 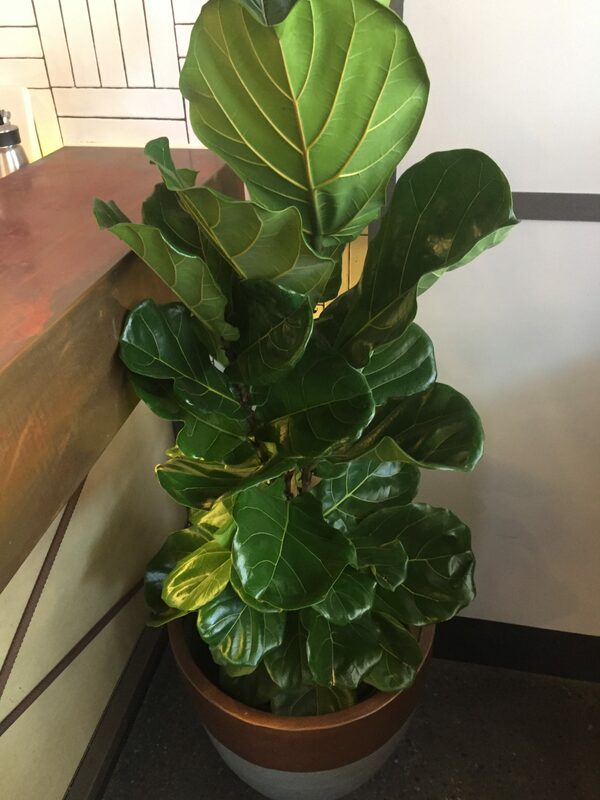 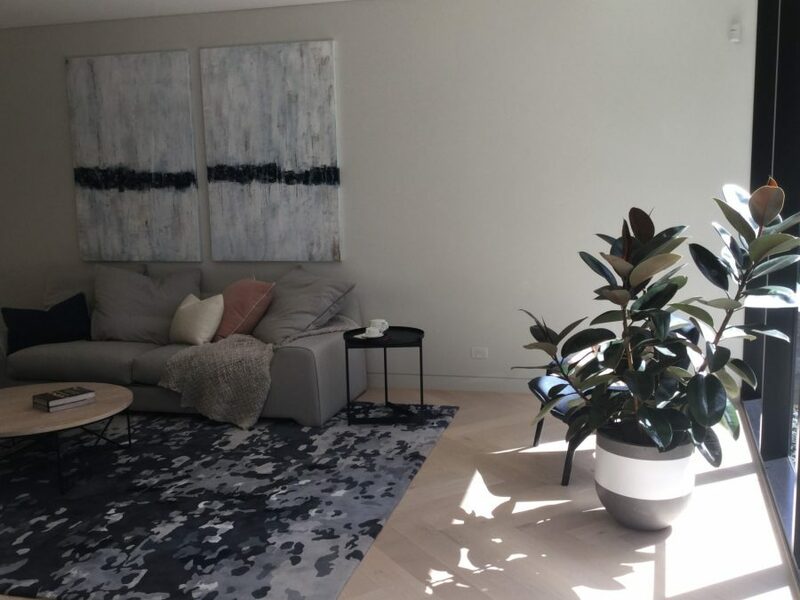 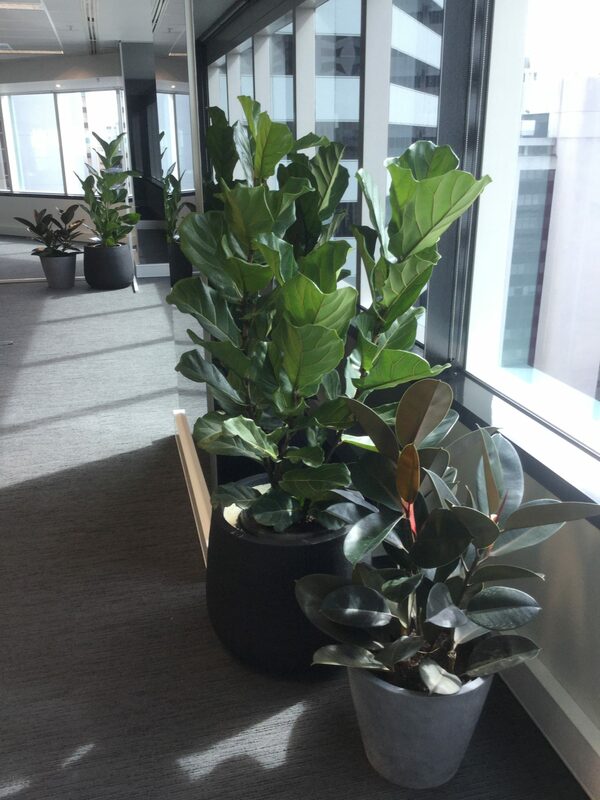 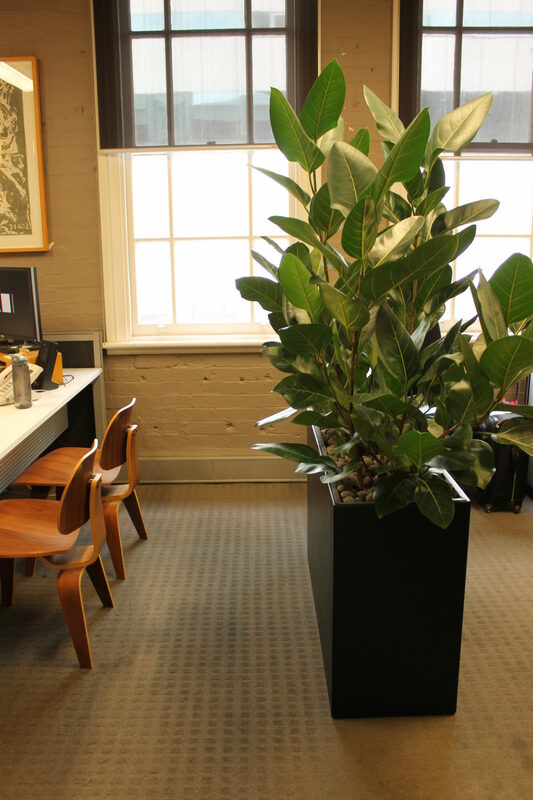 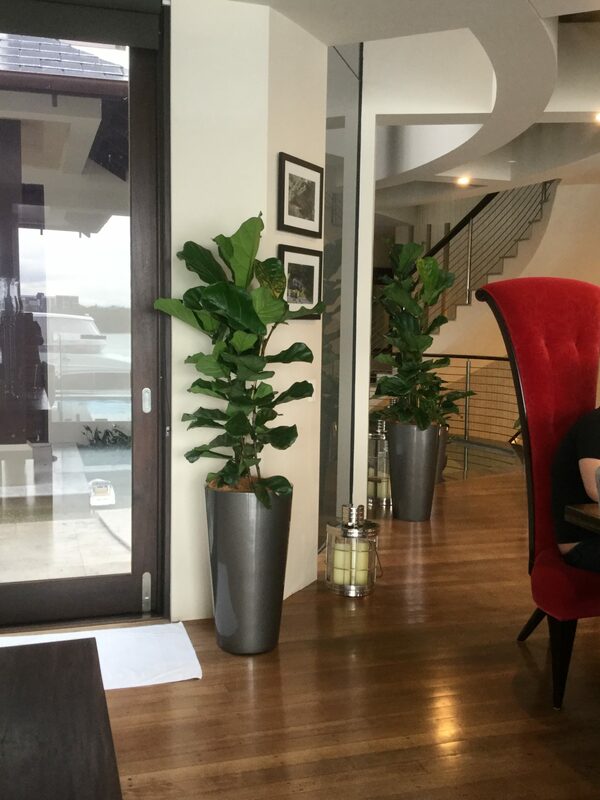 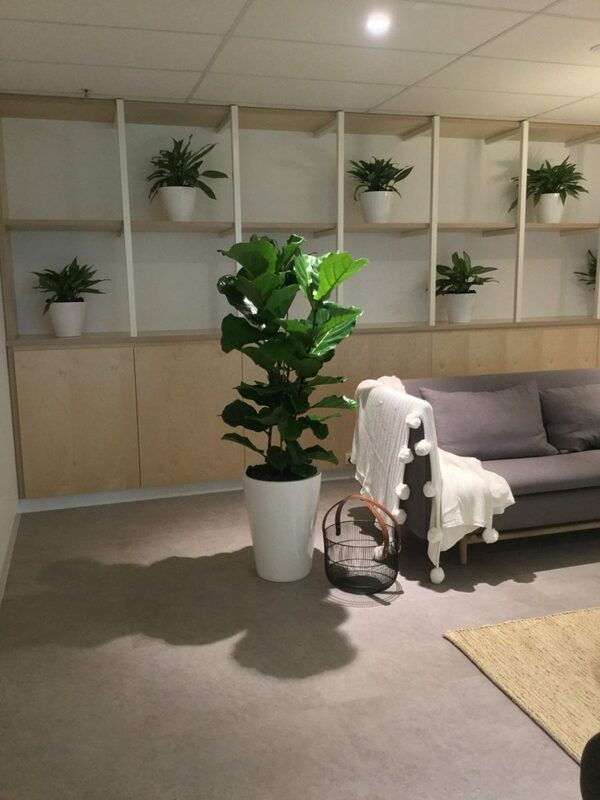 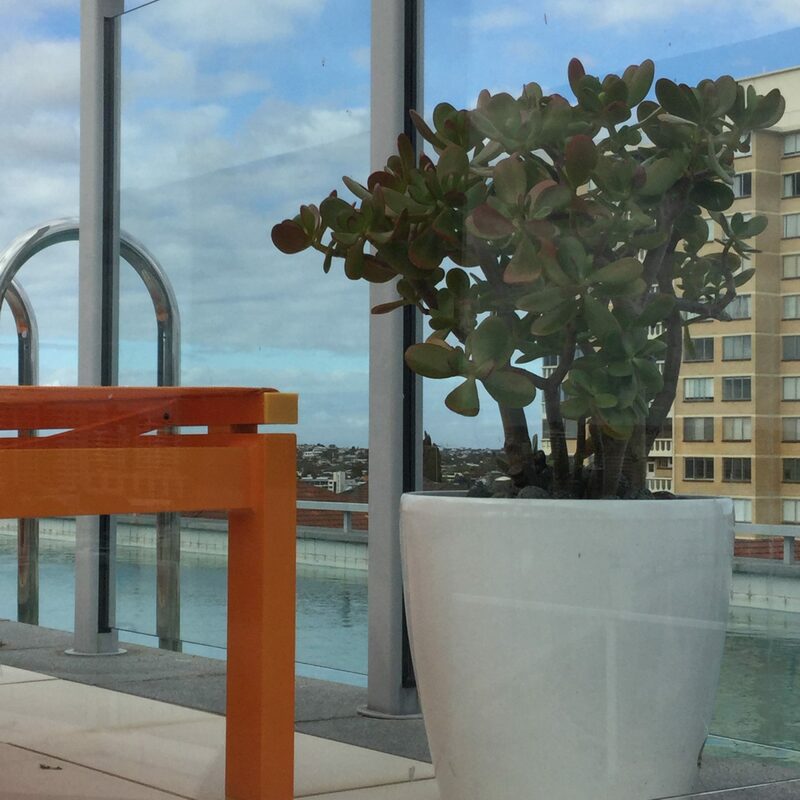 Ficus (or Fig trees) are a popular indoor plant species due to their ability to maintain their tree-like shape, regardless of their size and environment. 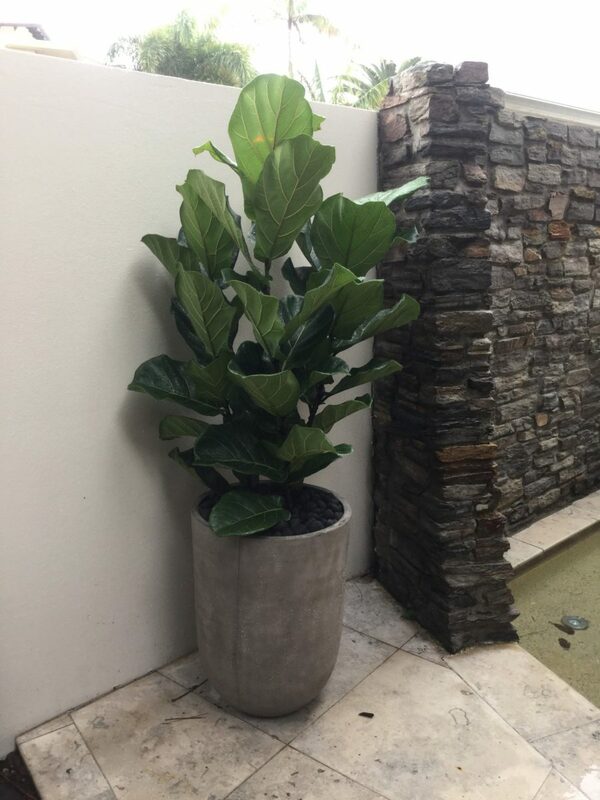 Figs can be trained and pruned into desirable shapes and can offer an array of lush, richly-coloured or variegated foliage. 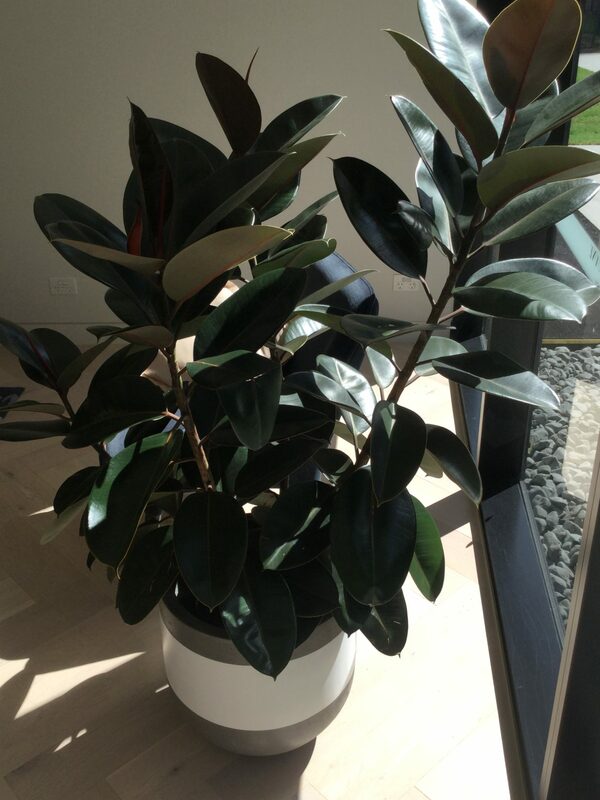 The most popular medium to large tree with lush, deep veined, sculptural violin-shaped leaves. 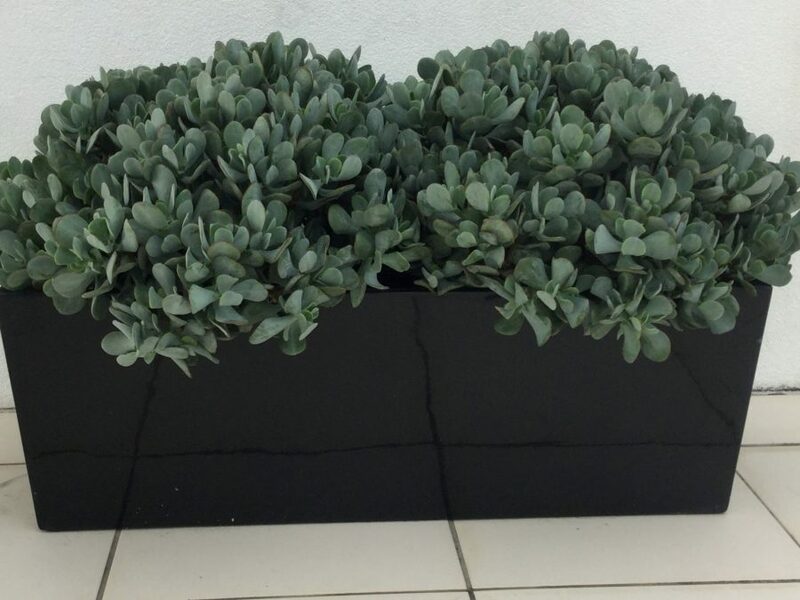 The stiff, waxy leaves can show a grey-green colour underneath and are grown on single or multi-stemmed trunks. 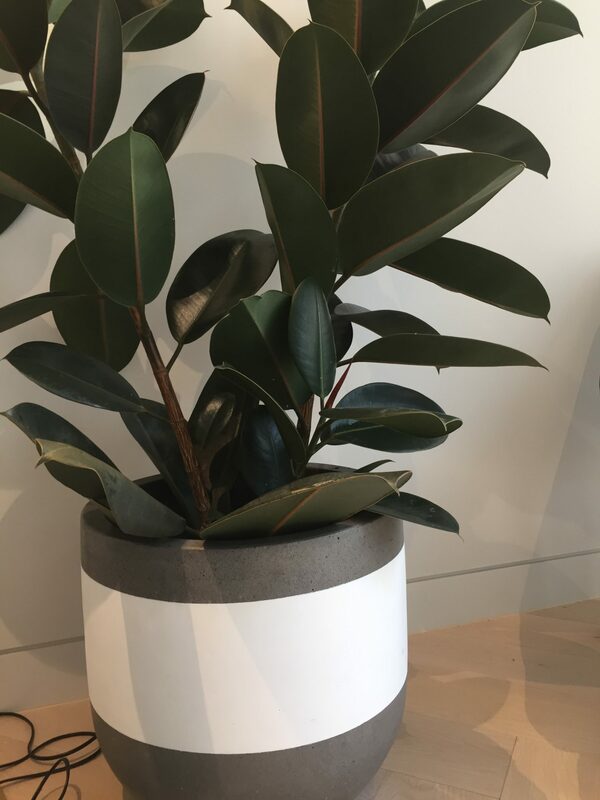 Also called rubber plant, this plant has broad, stiff, shiny, leather type leaves and is grown it as a multi-stem shrub or a branched tree. 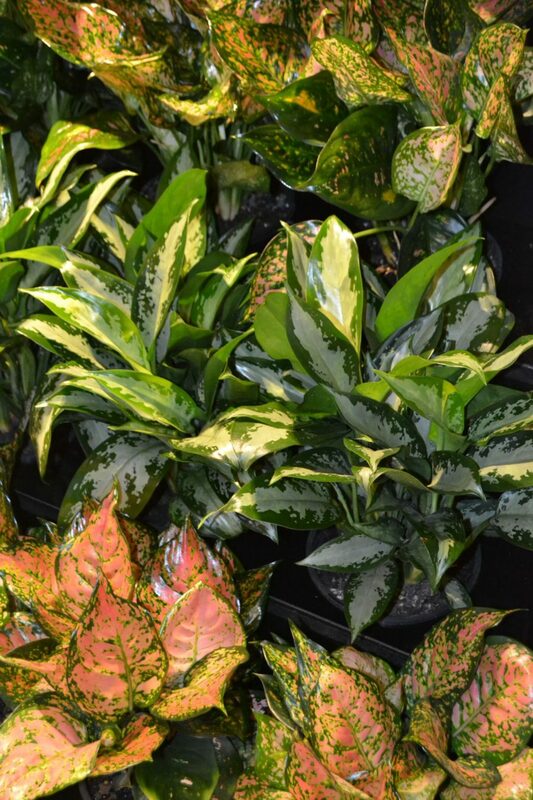 Also available in burgundy (has near black reddish leaves) and a selection of variegated types. 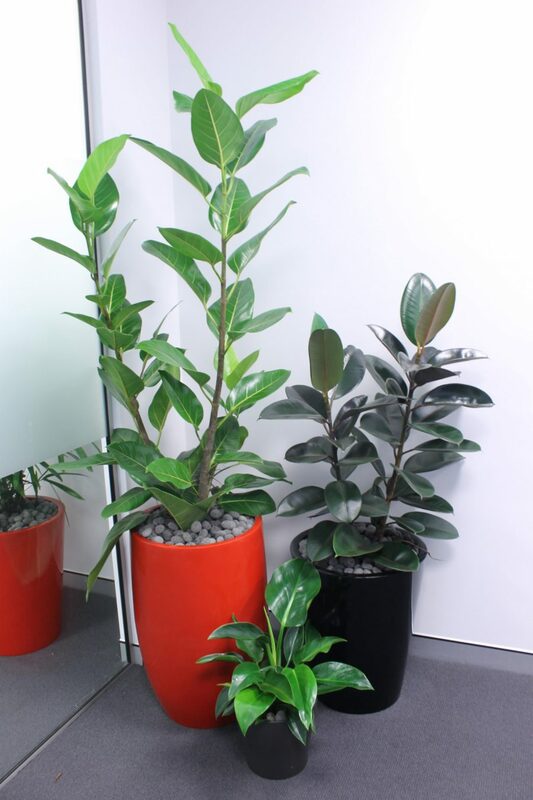 The weeping Fig is the most widely grown ficus due to its typical “tree” like appearance. 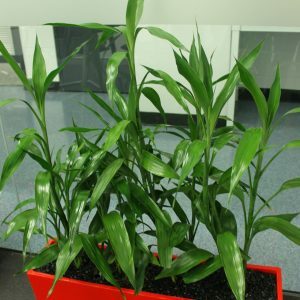 It has larger arching branches and long pointed dark green glossy leaves. 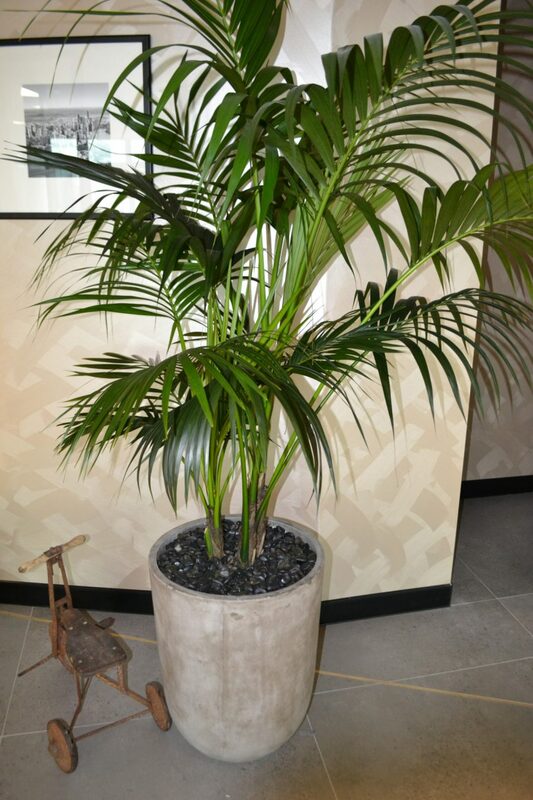 This clumping palm has numerous golden/green narrow stems that emerge from the base close together. 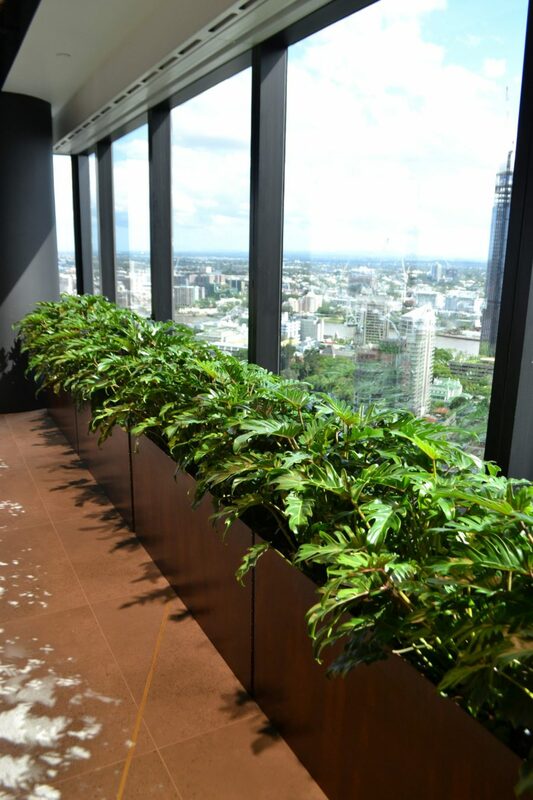 The full-sized fronds arch gracefully out and downward. 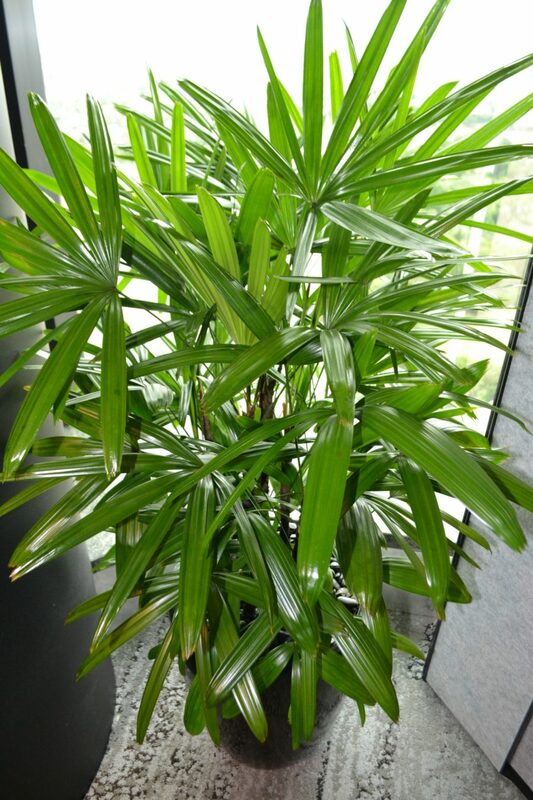 Palms can hold more of a greener colour (rather than golden) when grown inside. 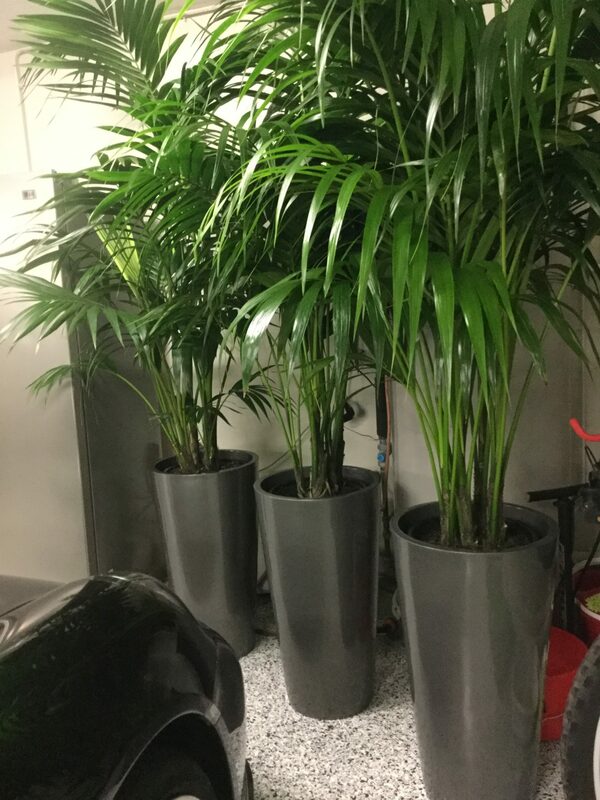 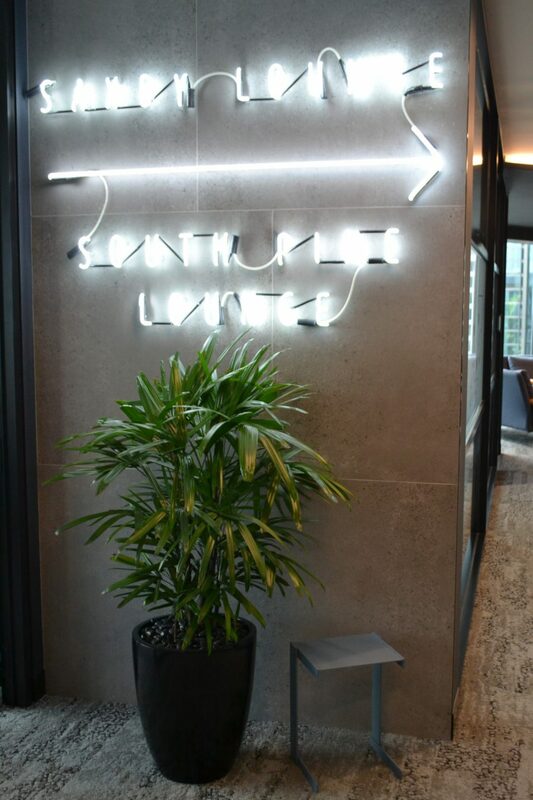 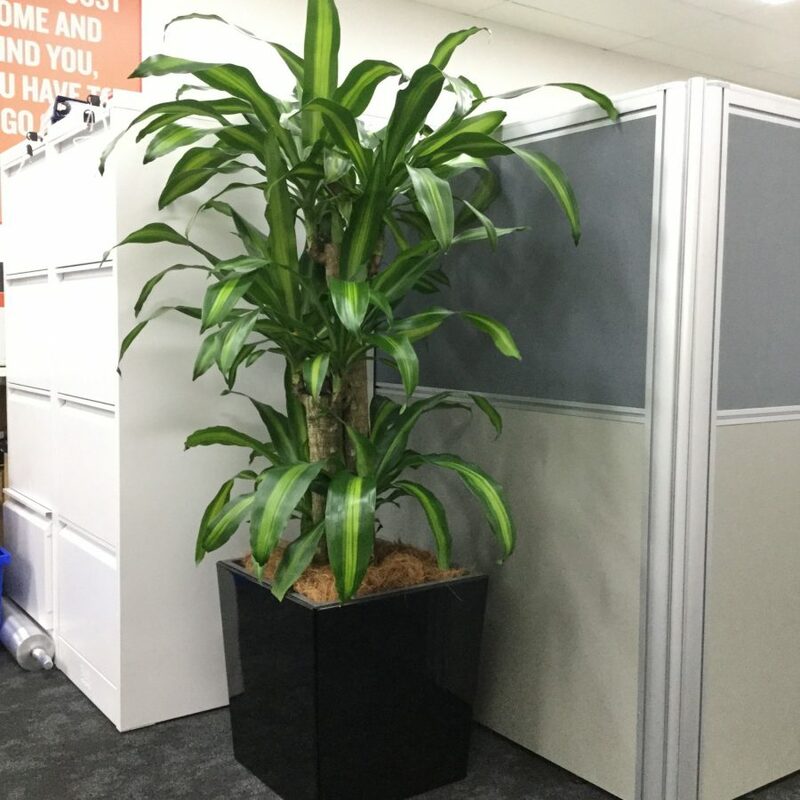 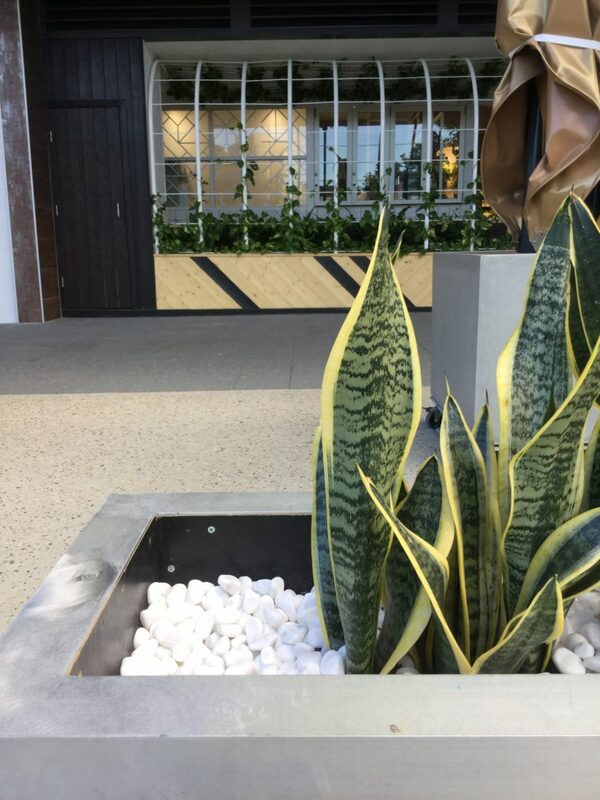 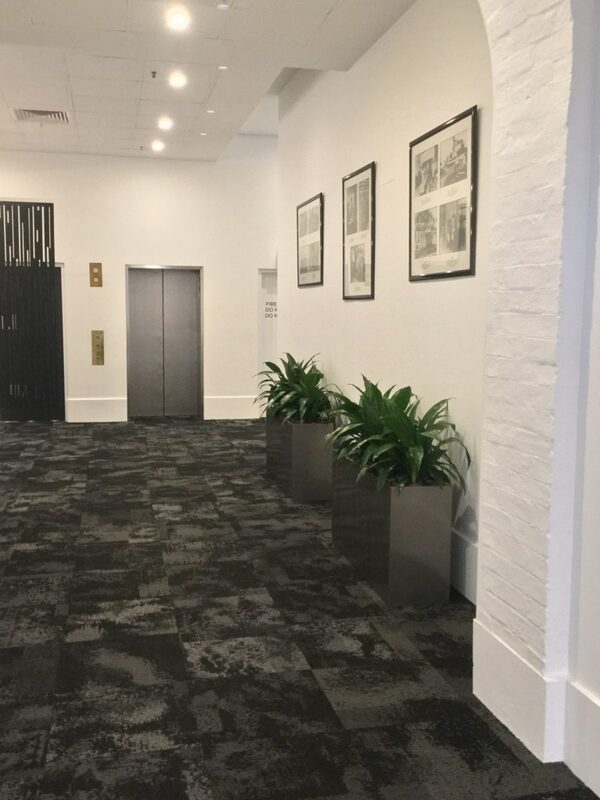 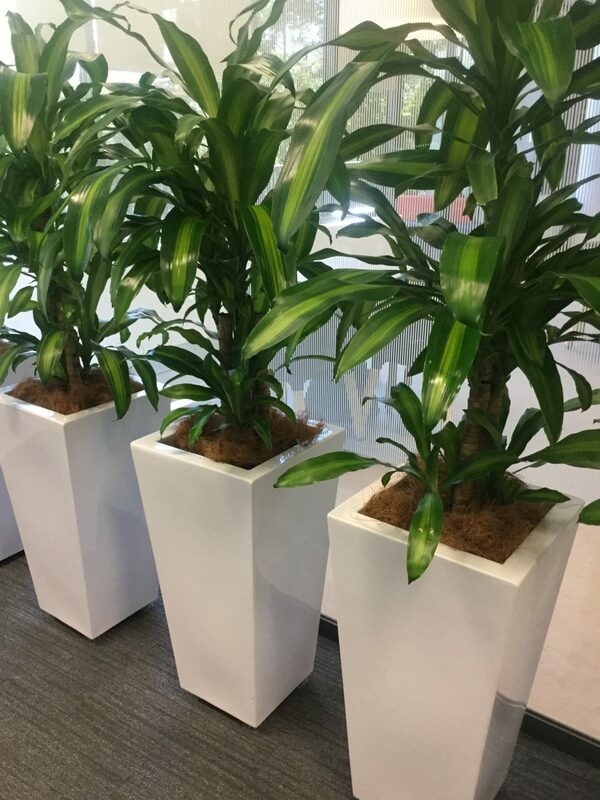 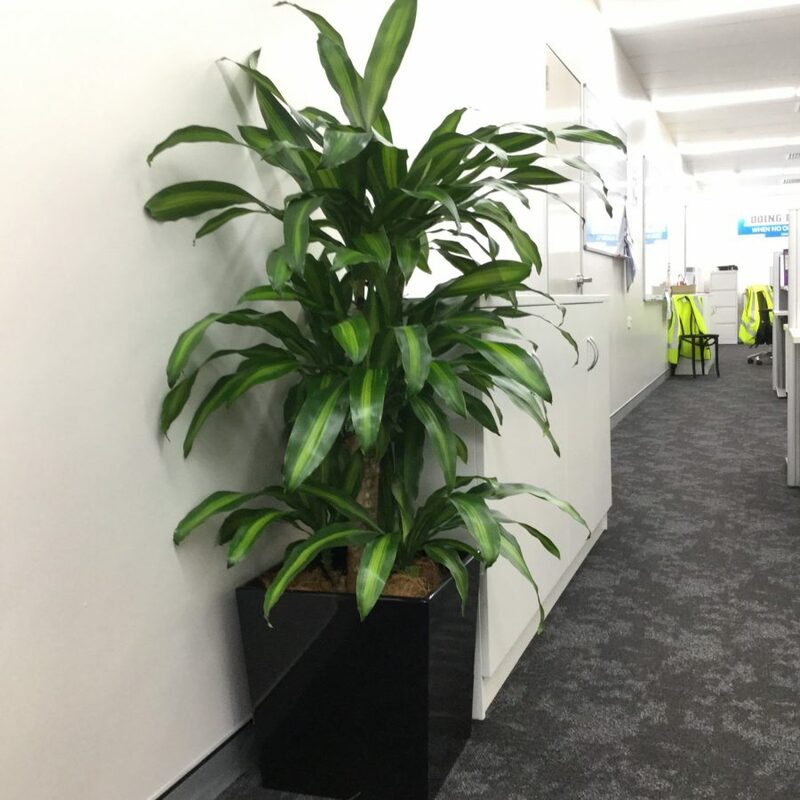 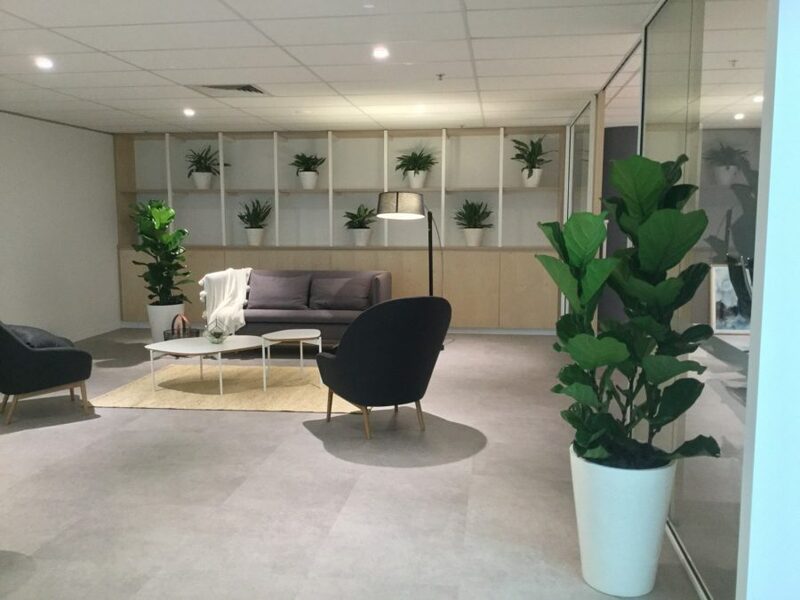 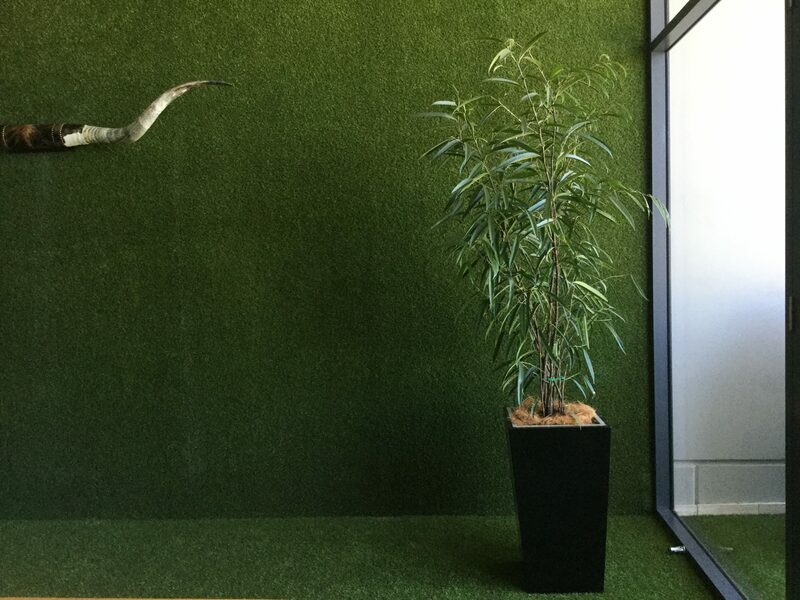 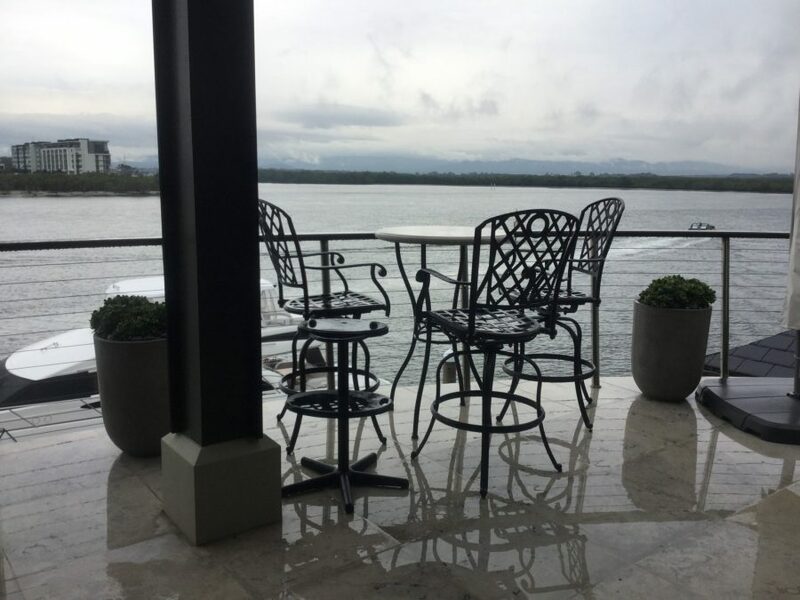 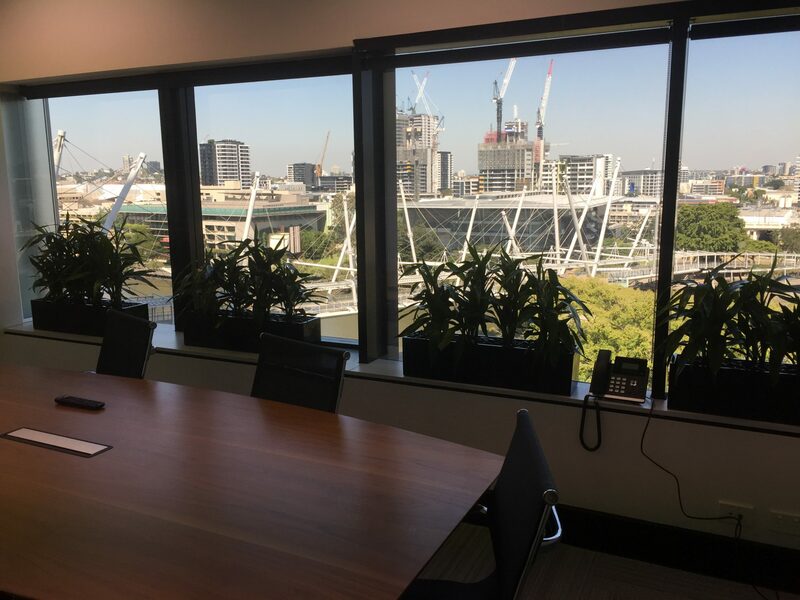 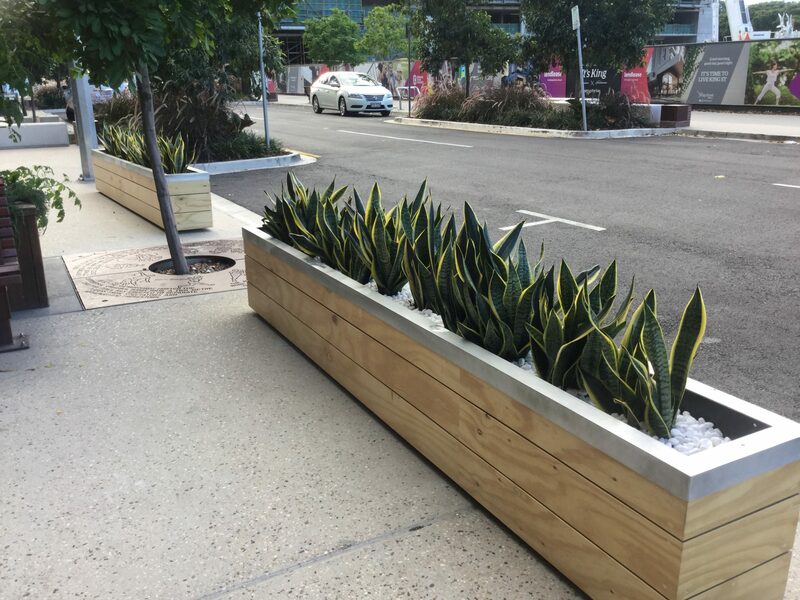 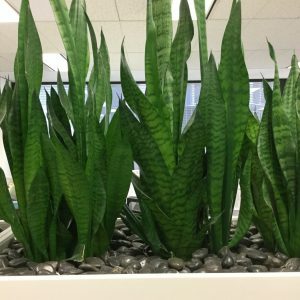 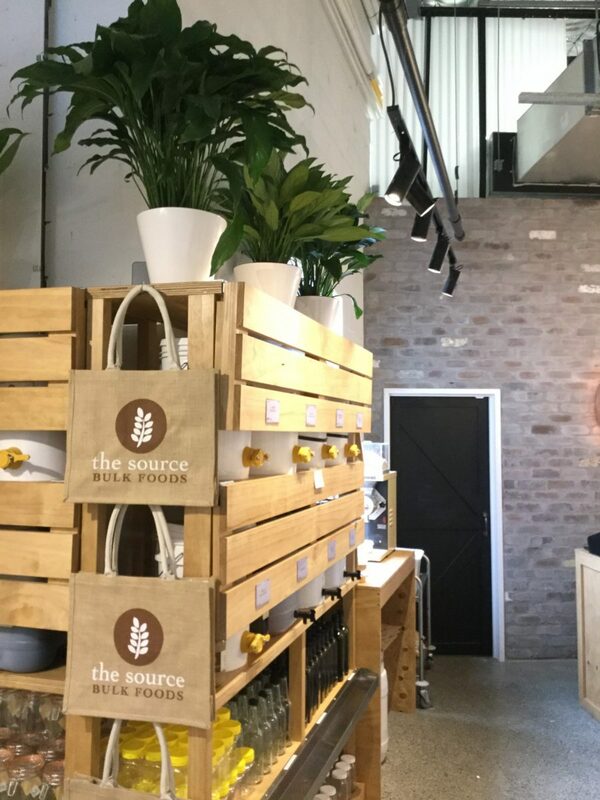 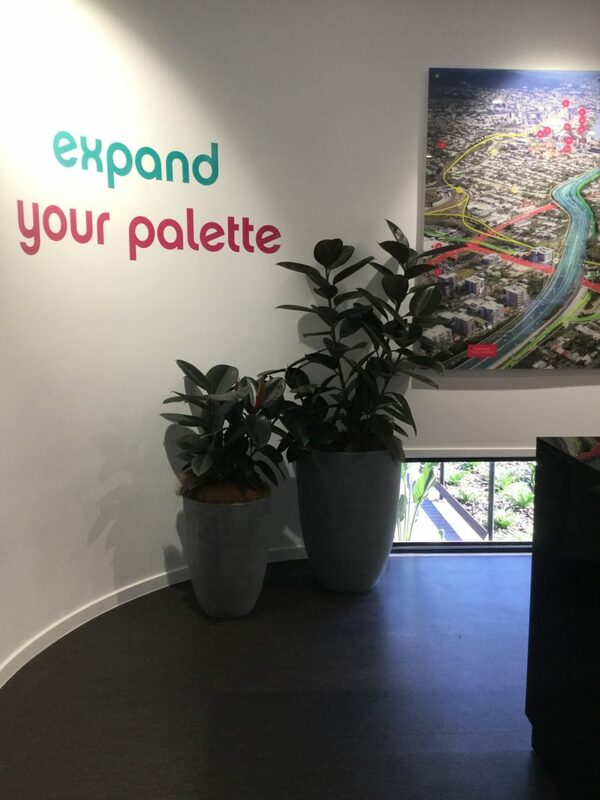 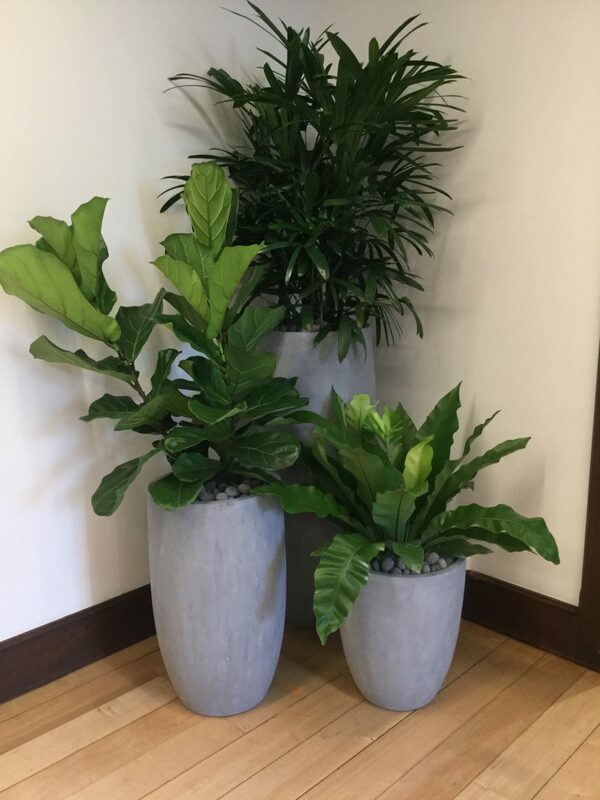 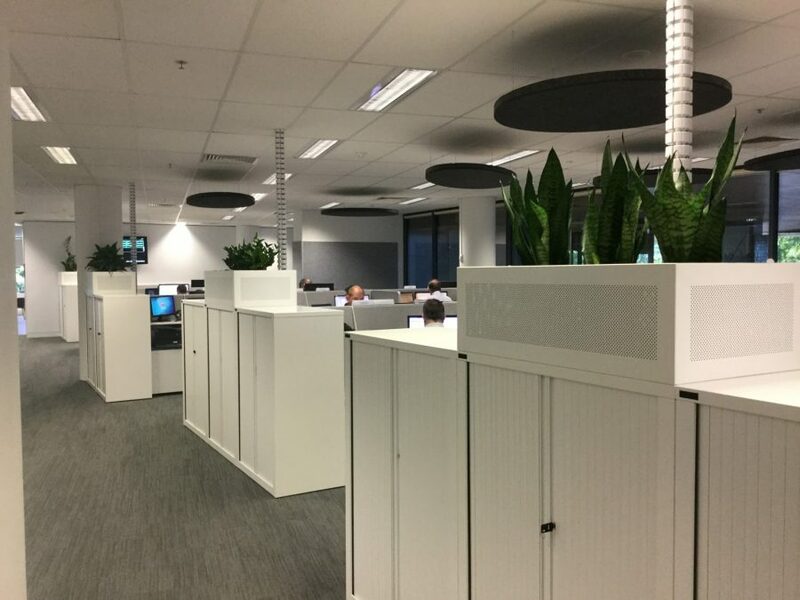 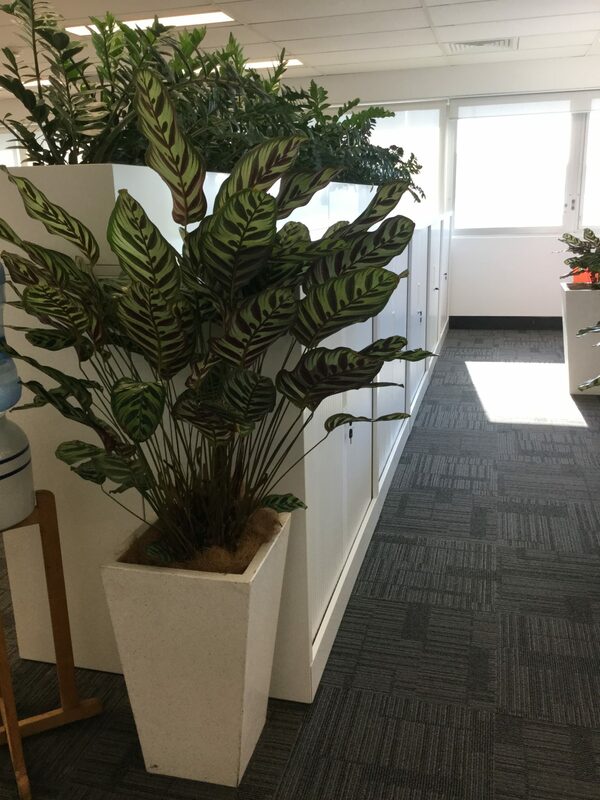 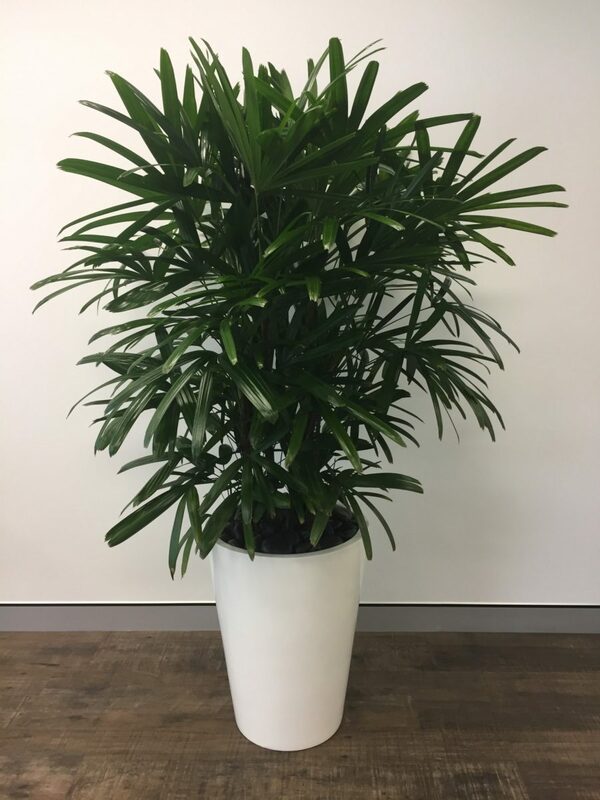 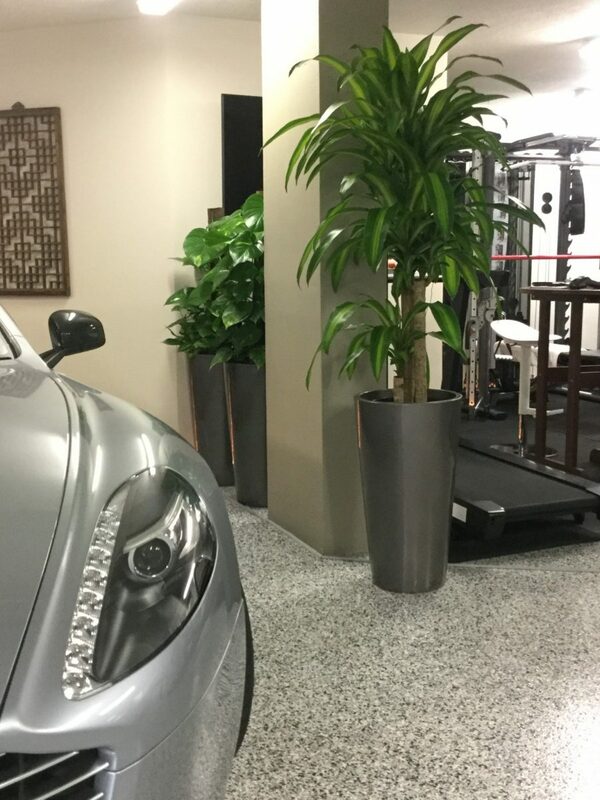 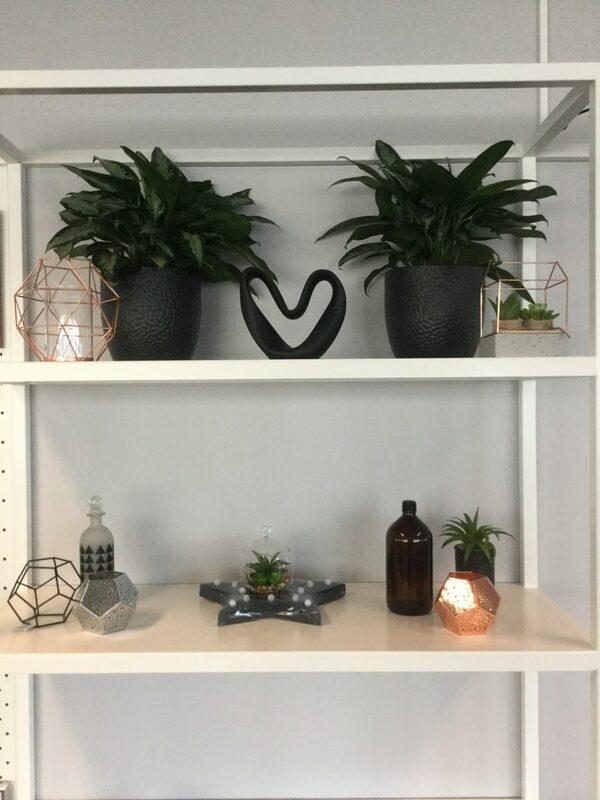 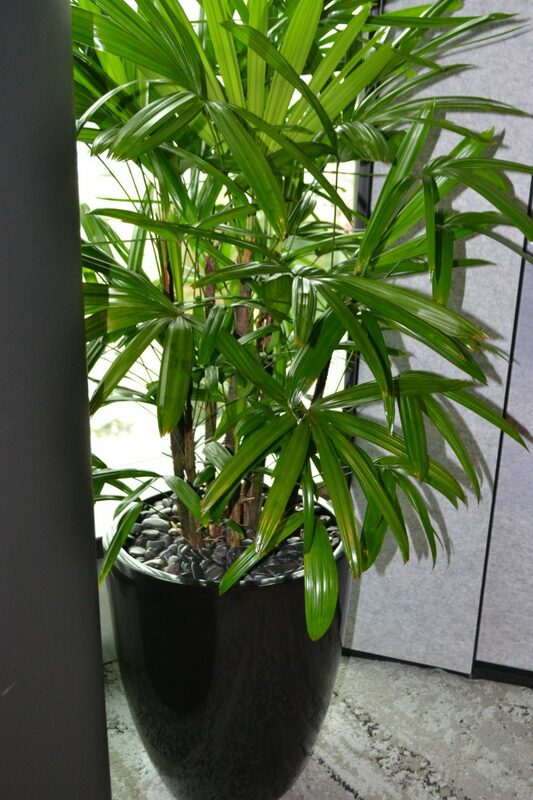 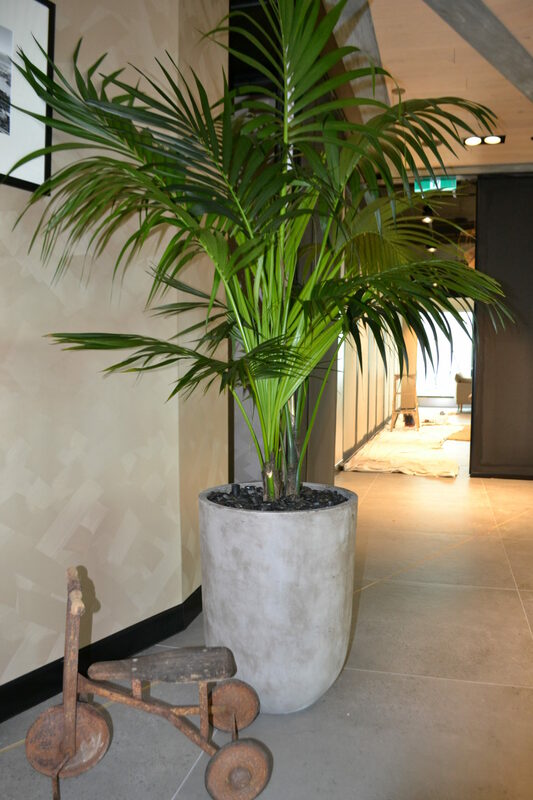 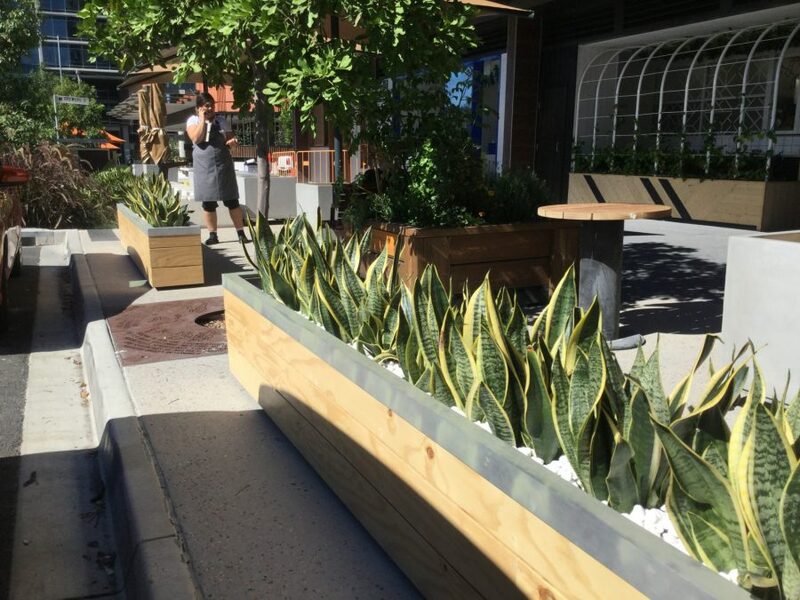 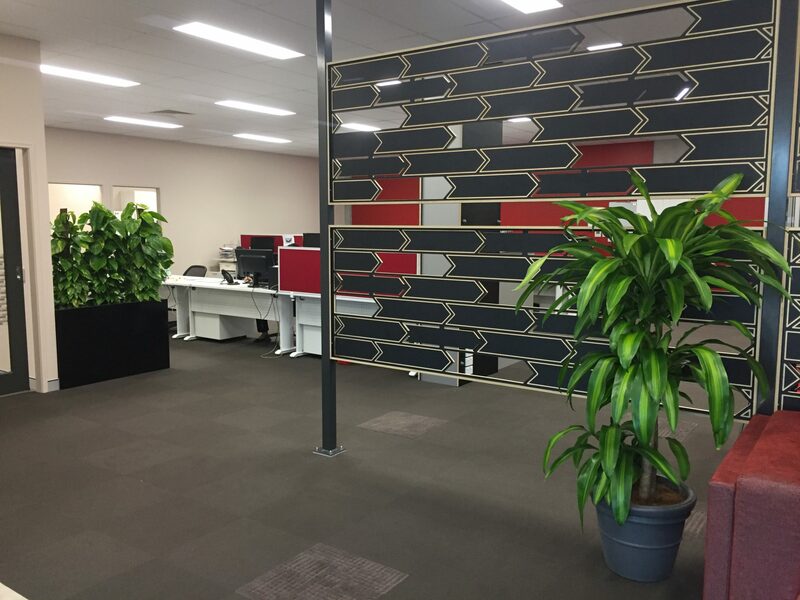 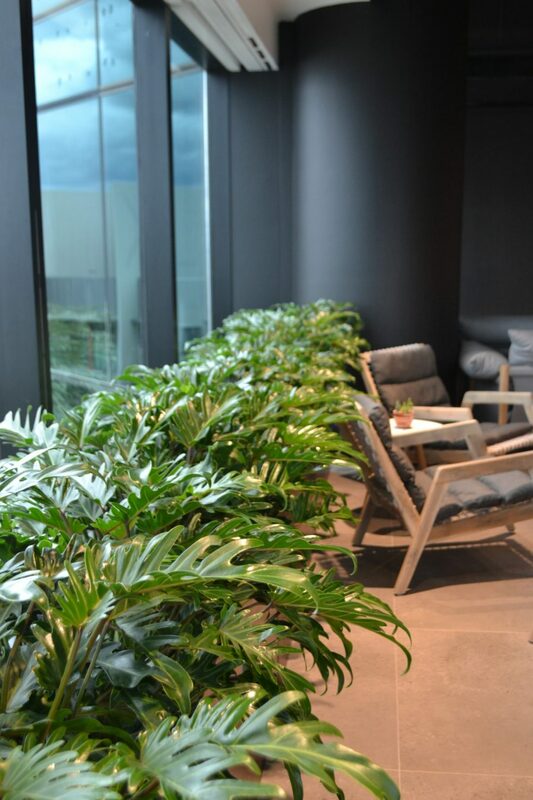 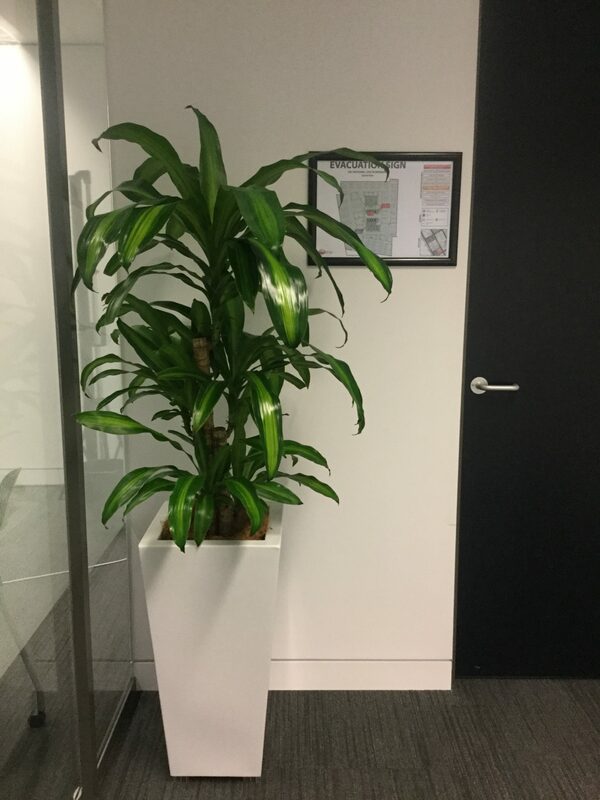 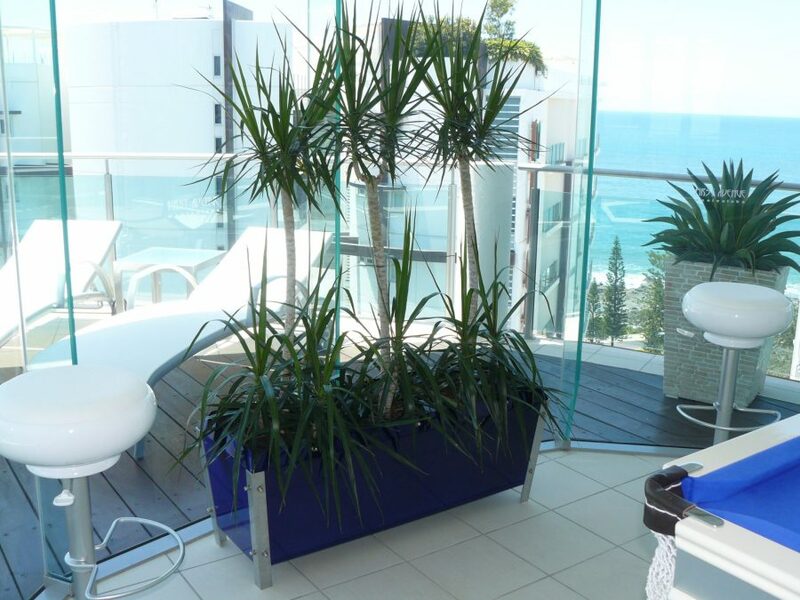 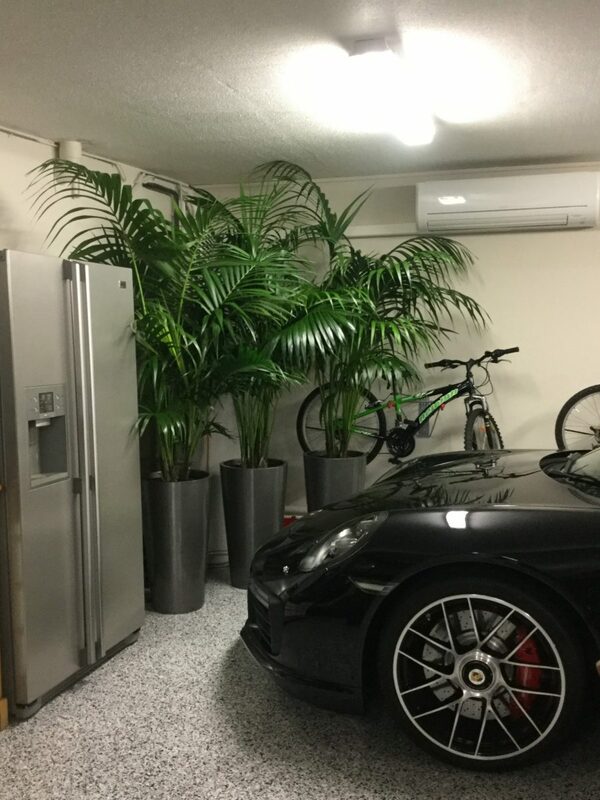 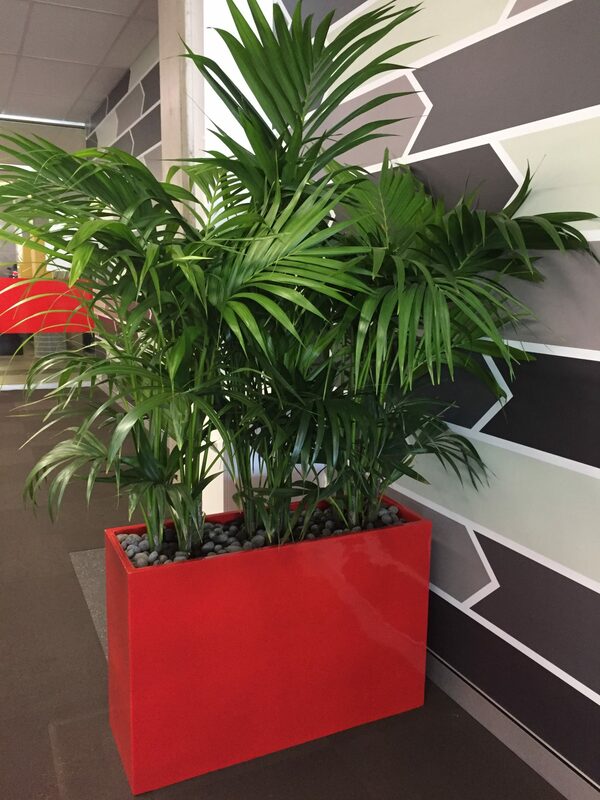 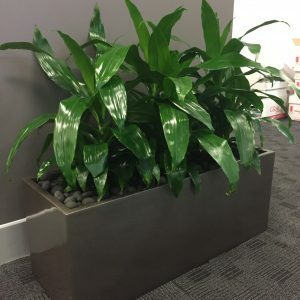 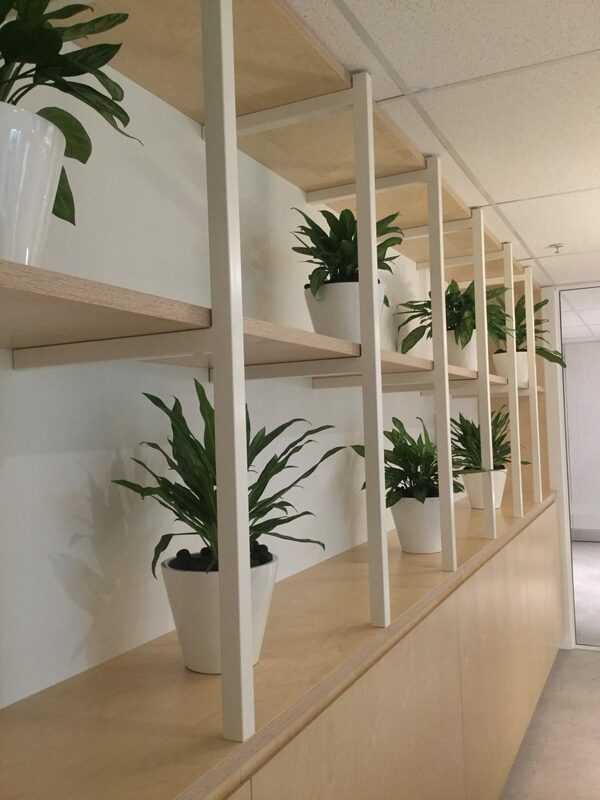 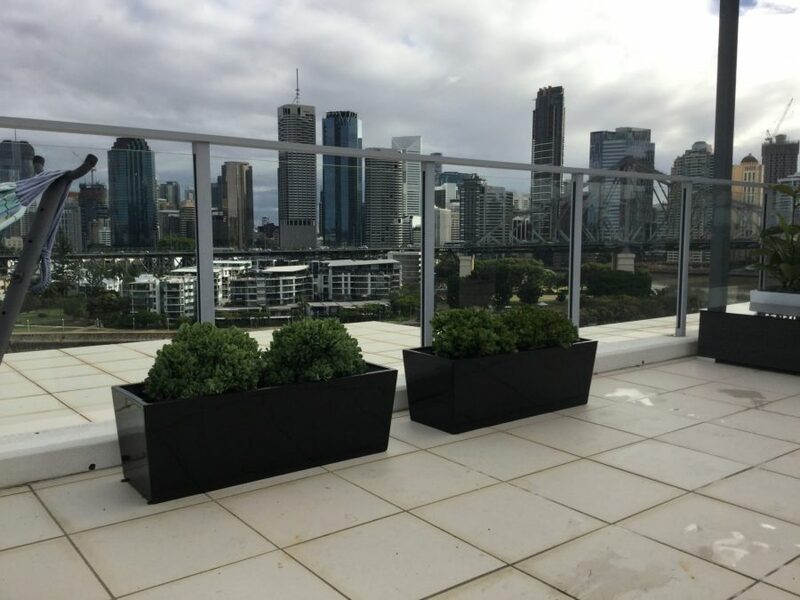 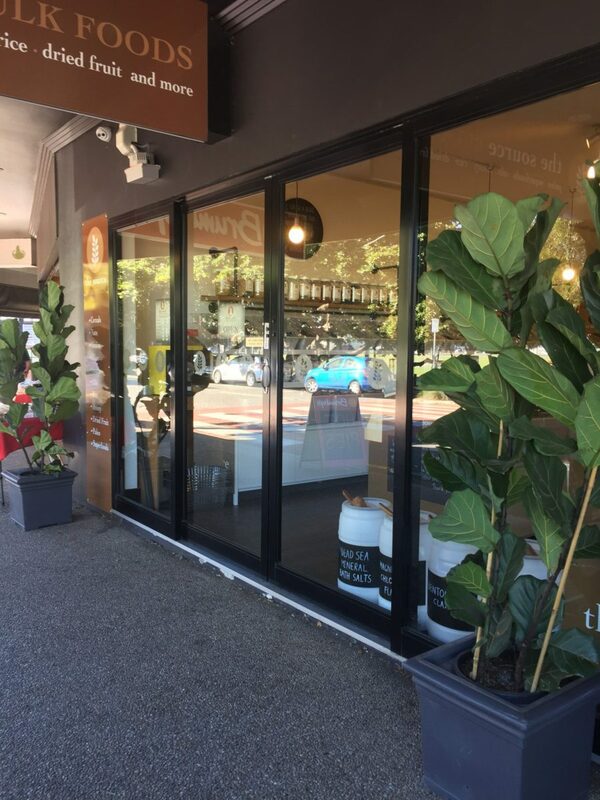 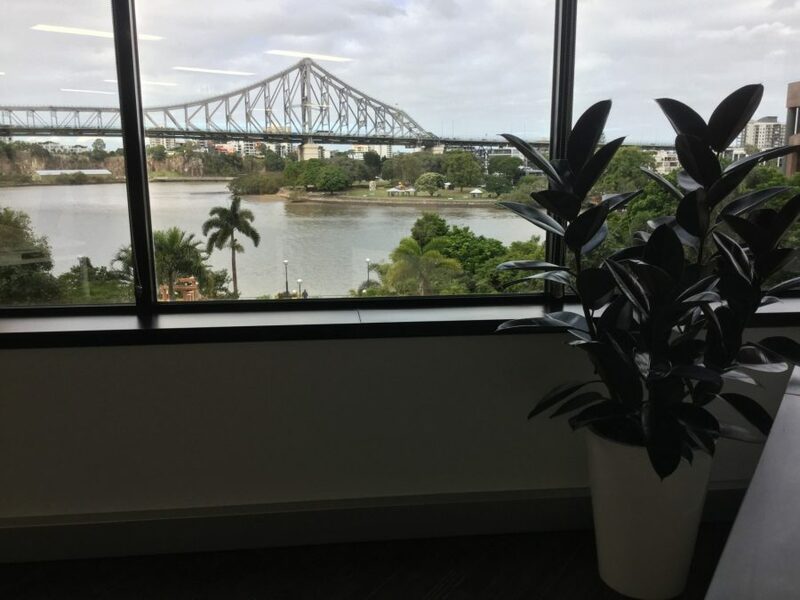 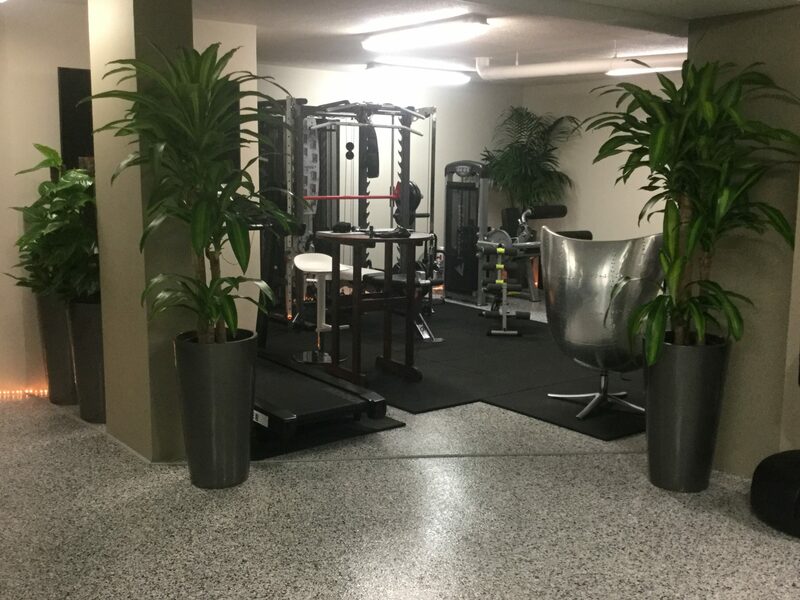 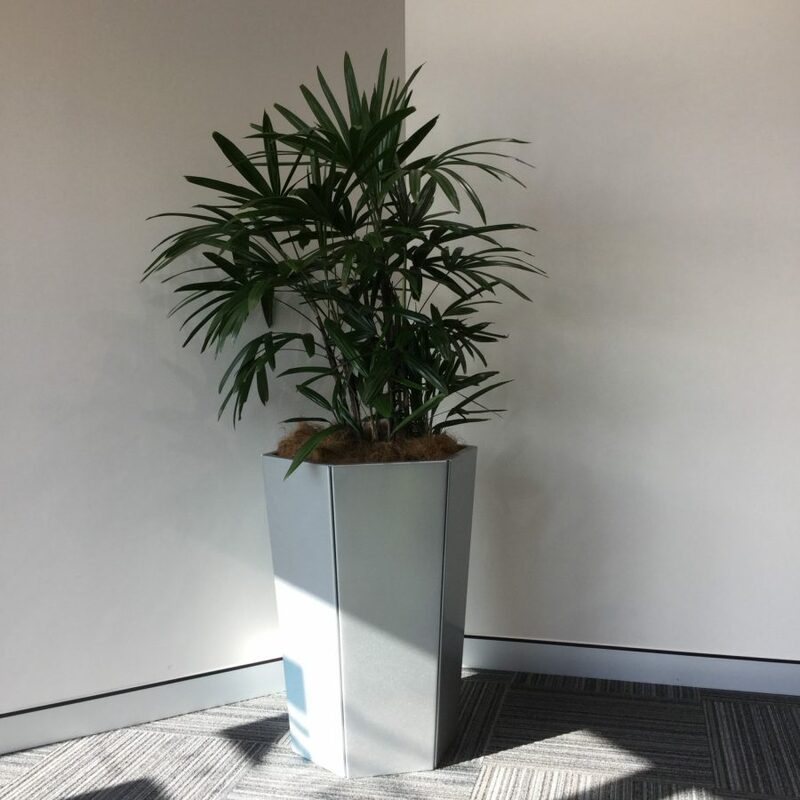 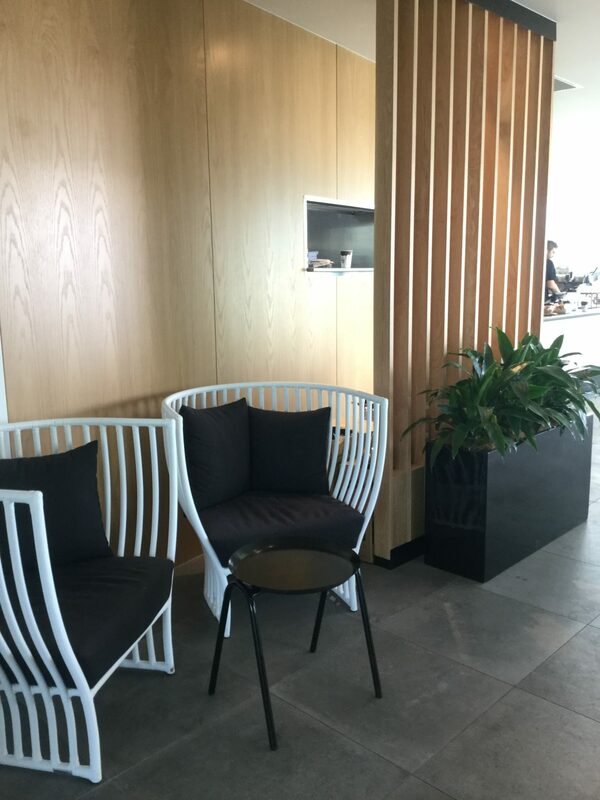 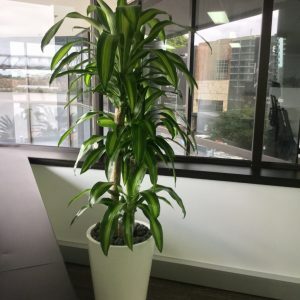 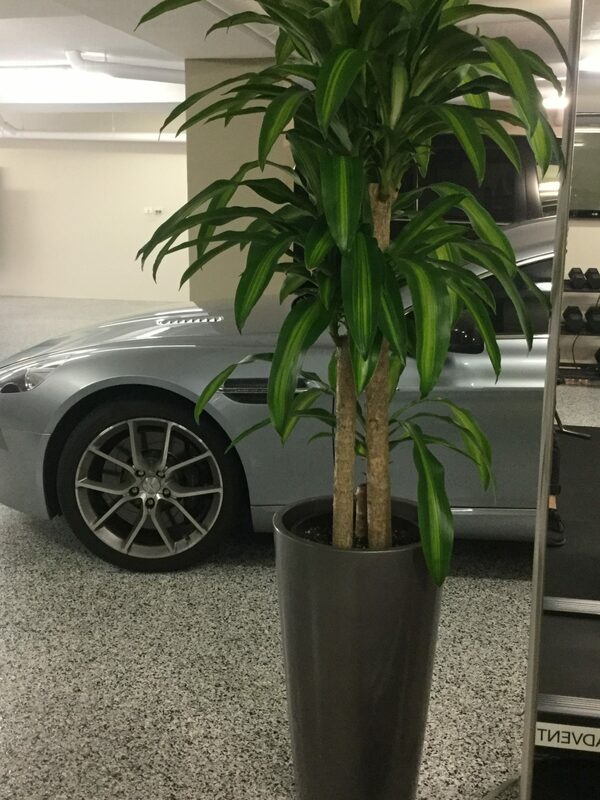 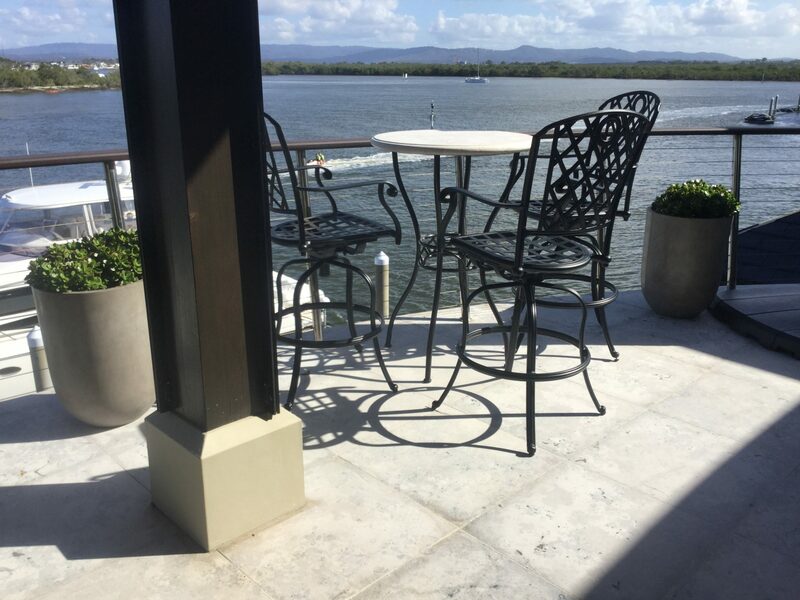 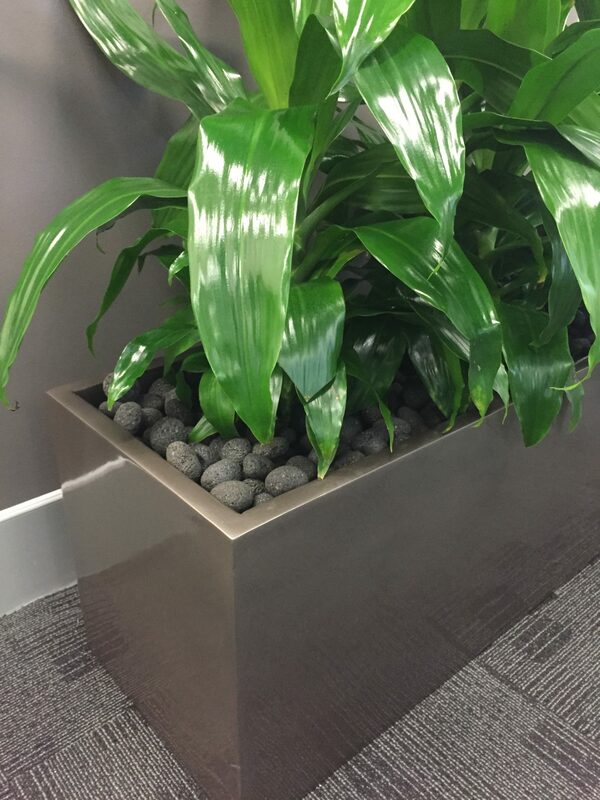 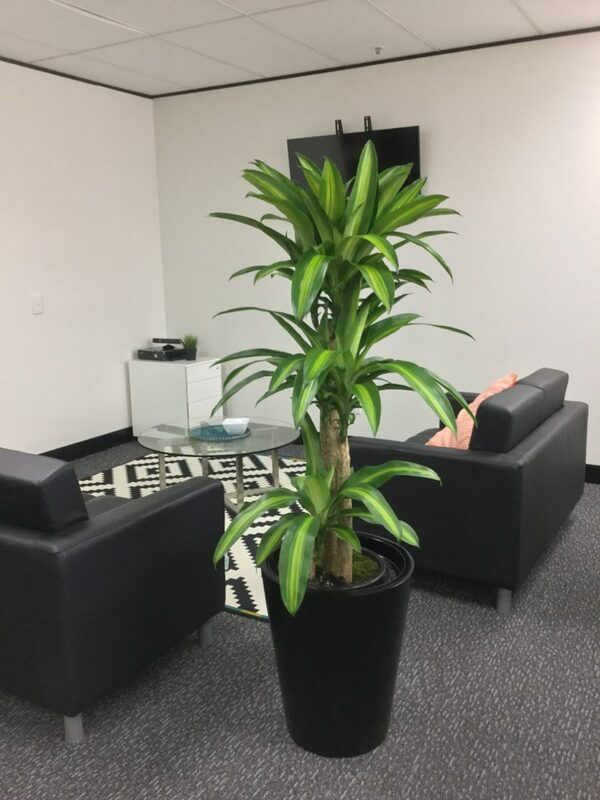 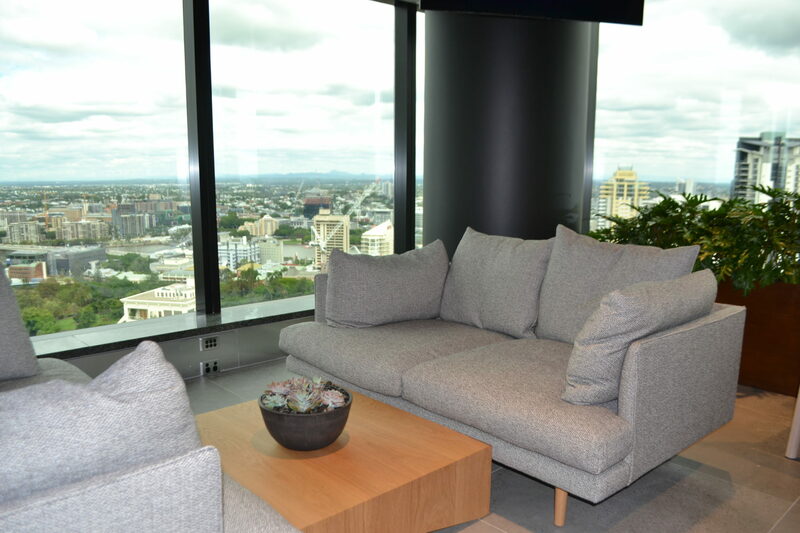 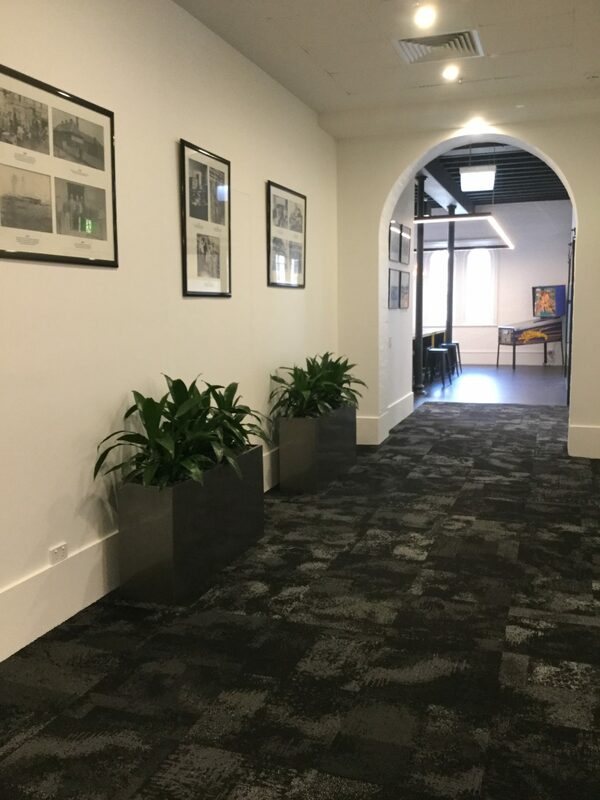 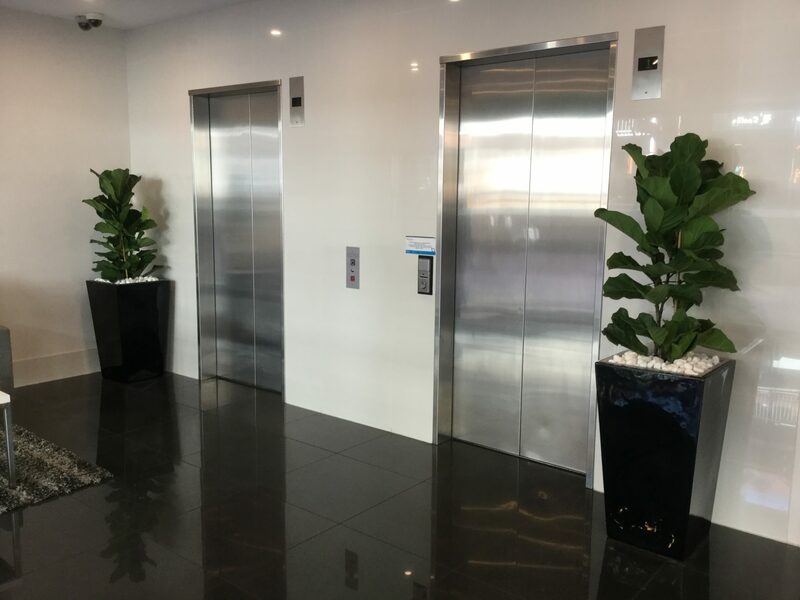 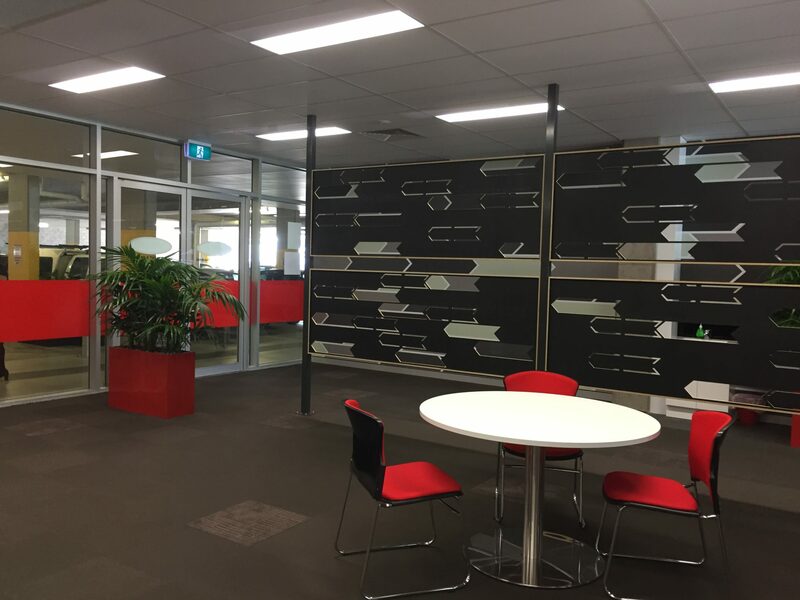 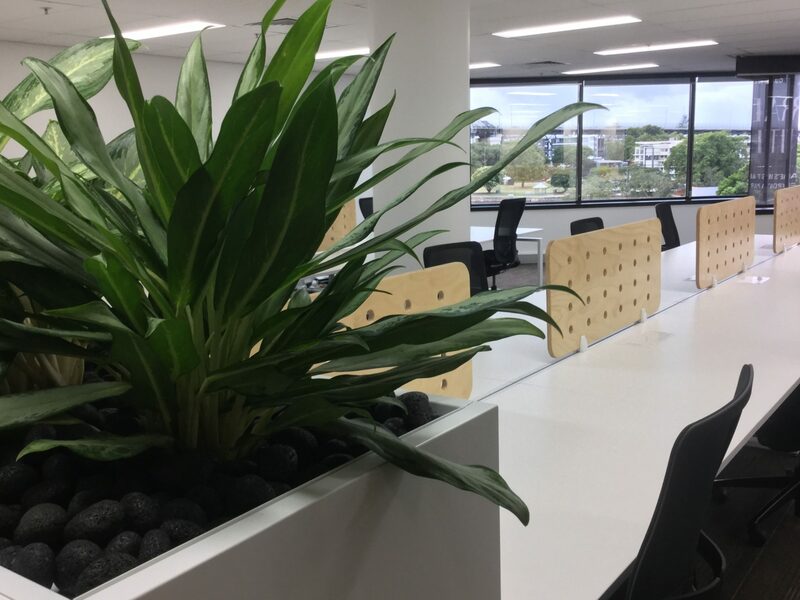 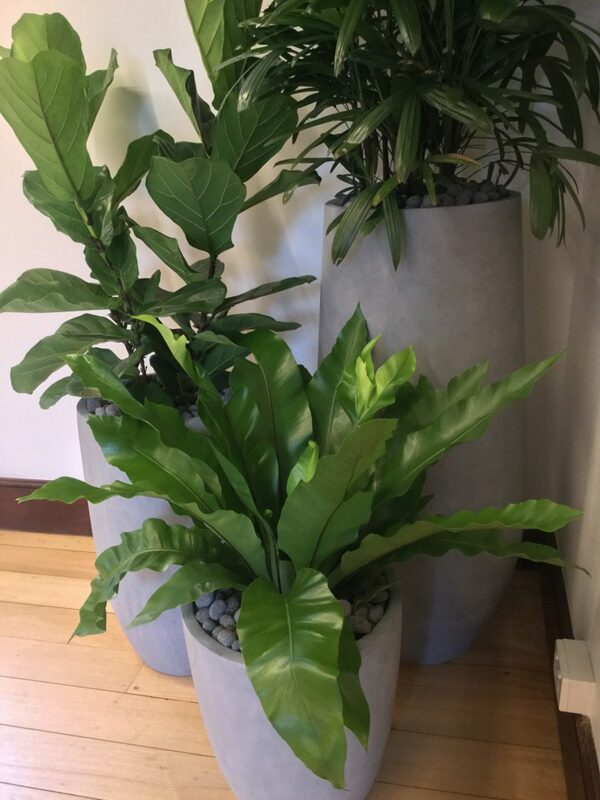 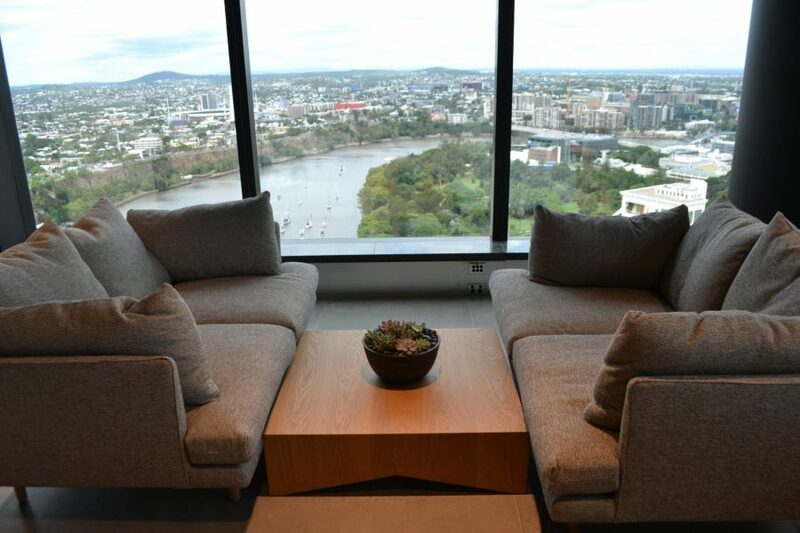 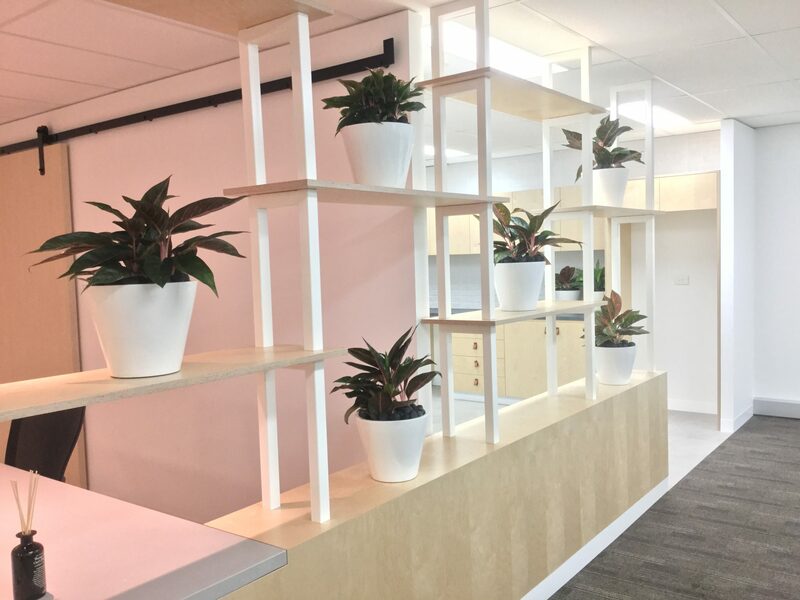 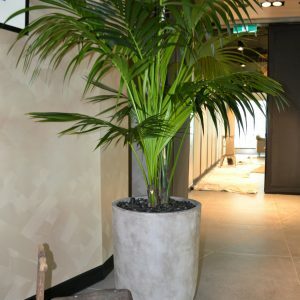 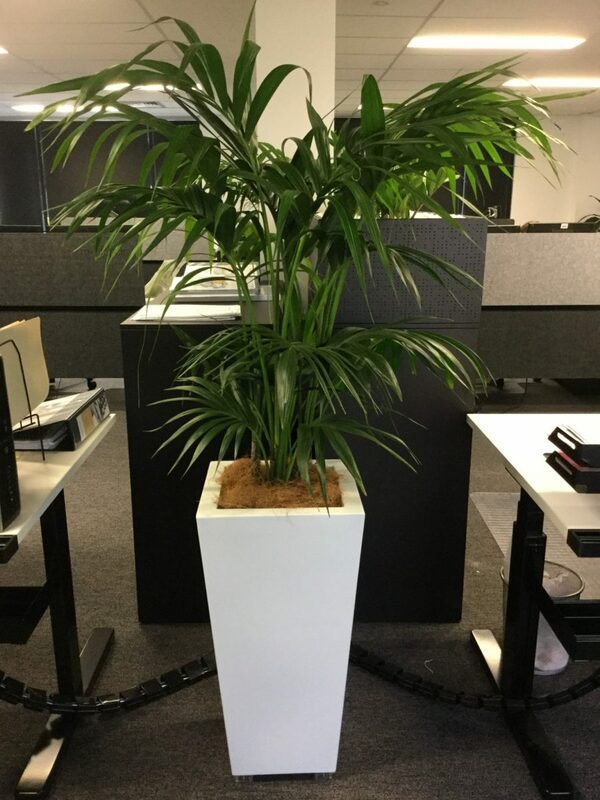 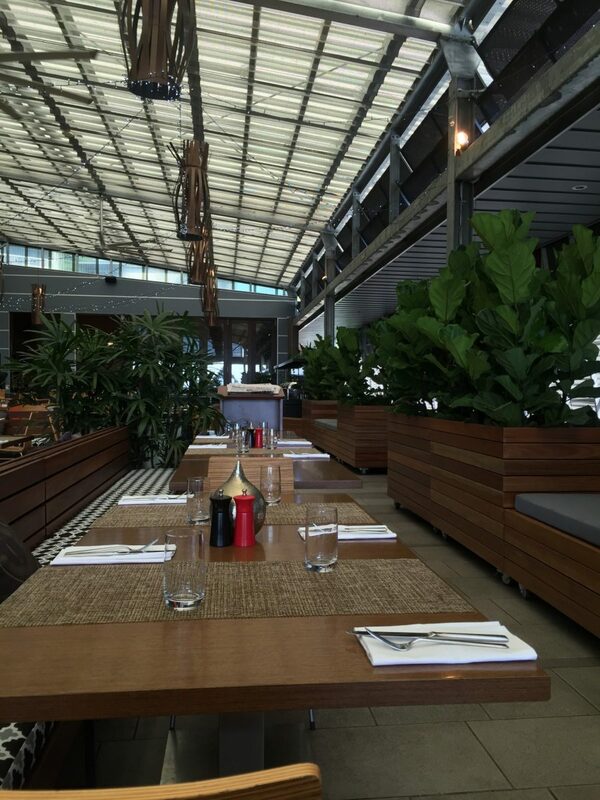 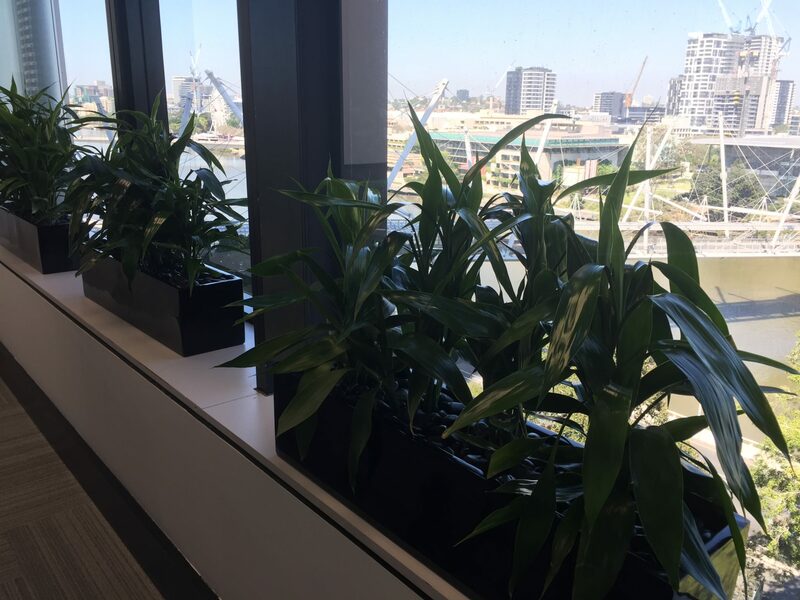 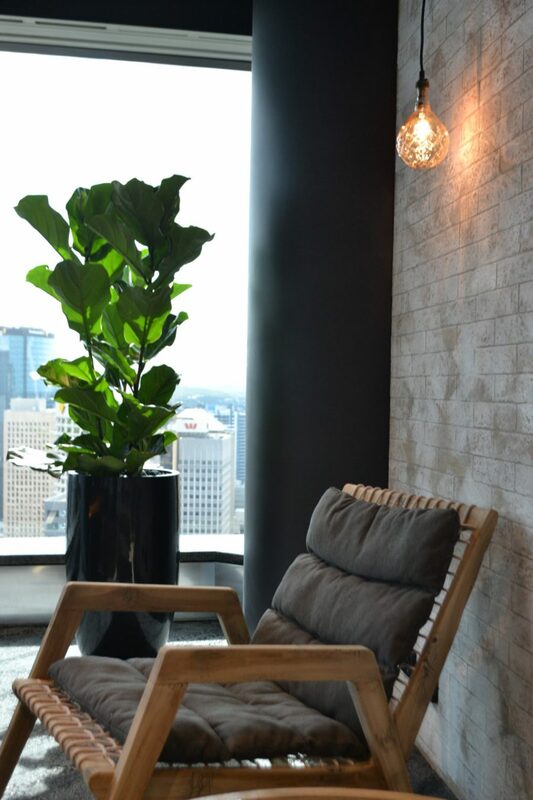 Palms are an extremely versatile group of plants, mostly originating throughout the tropical regions of the world, they can easily add a decorative or architectural element to an indoor space. 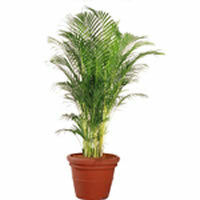 They can create a lush tropical look with their evergreen feathery foliage. 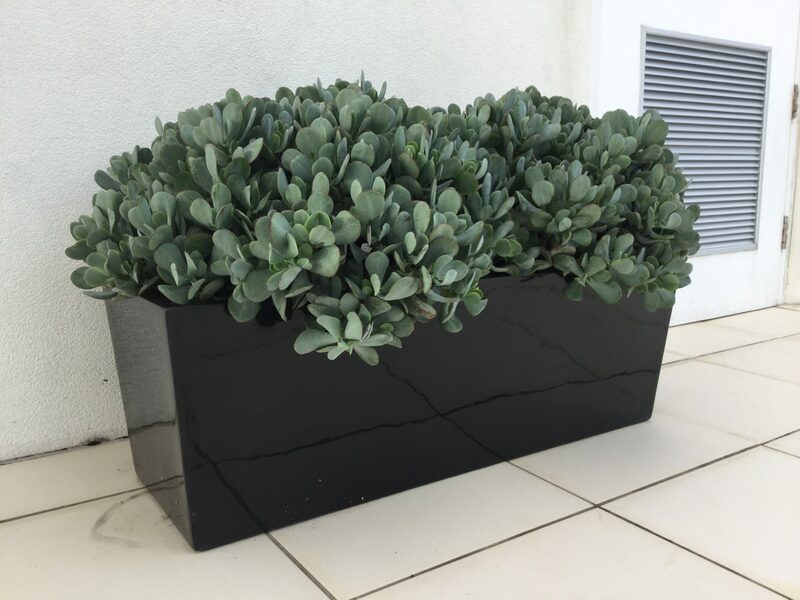 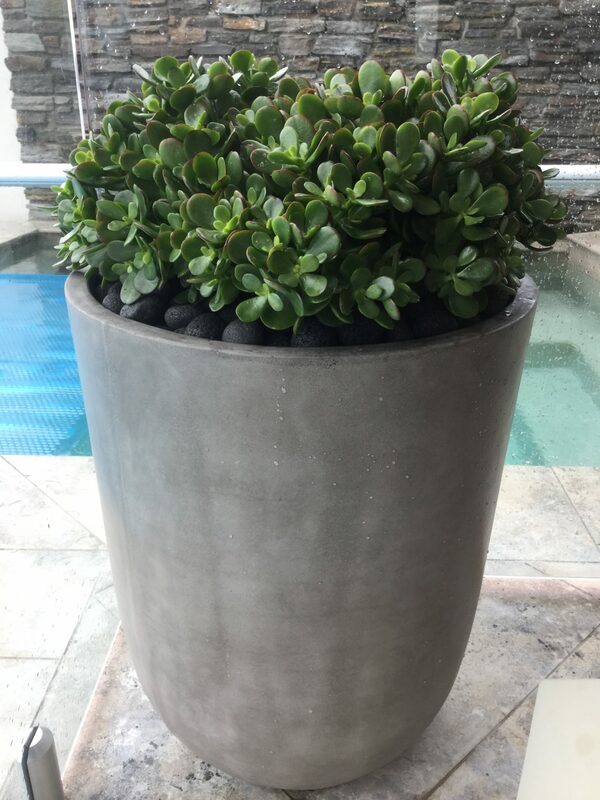 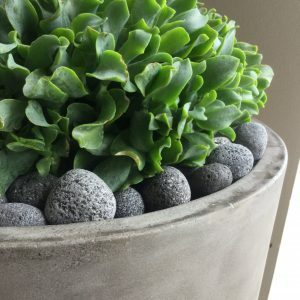 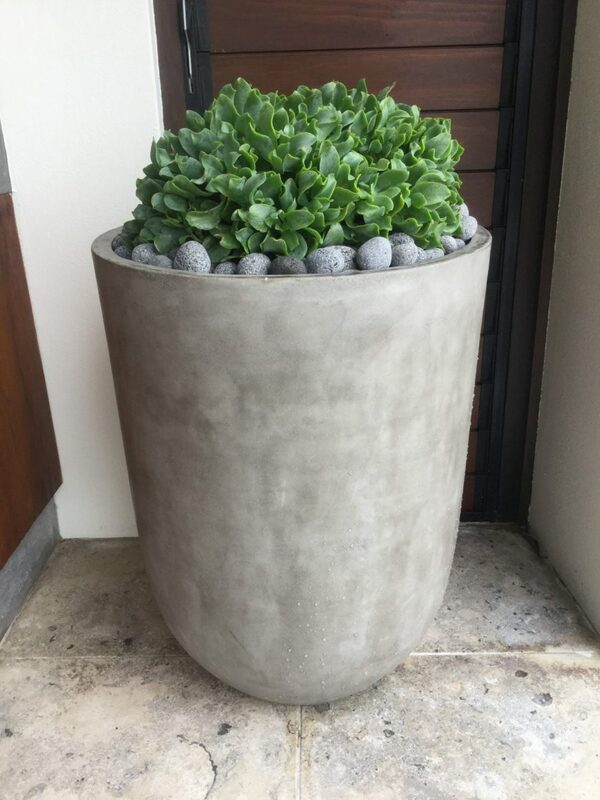 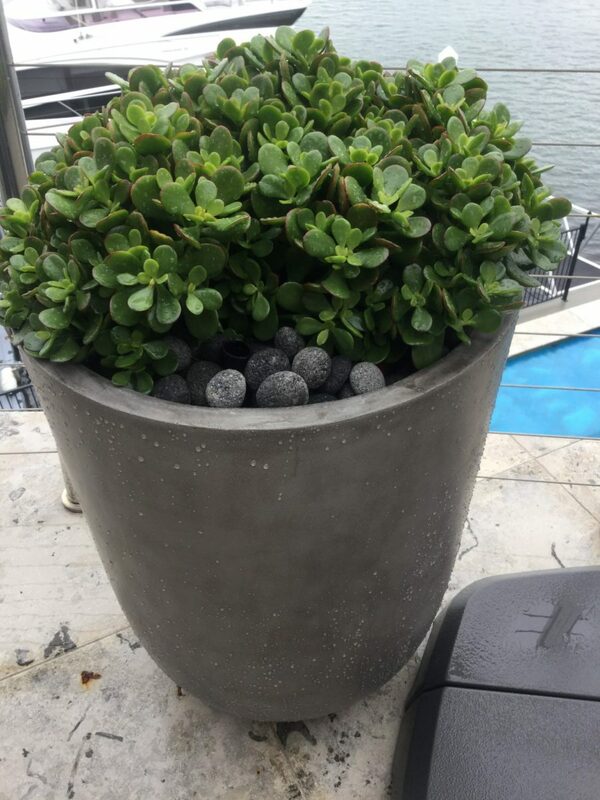 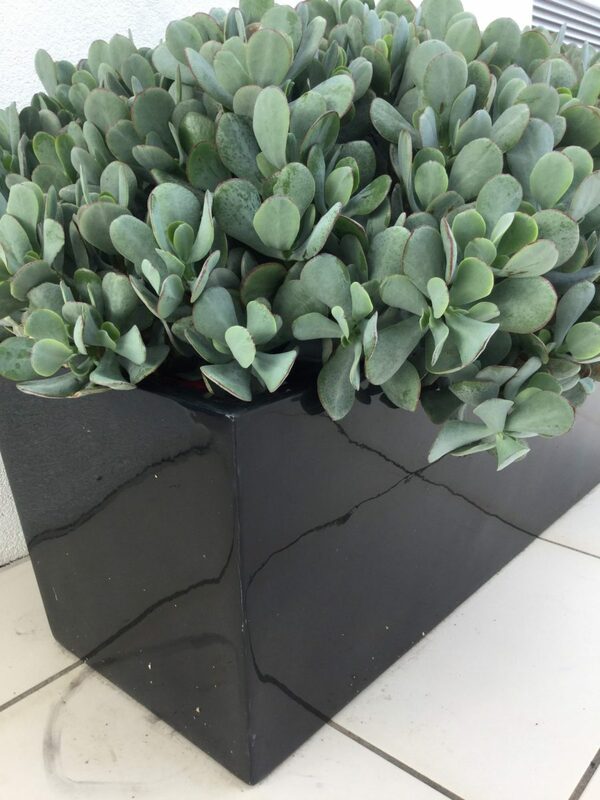 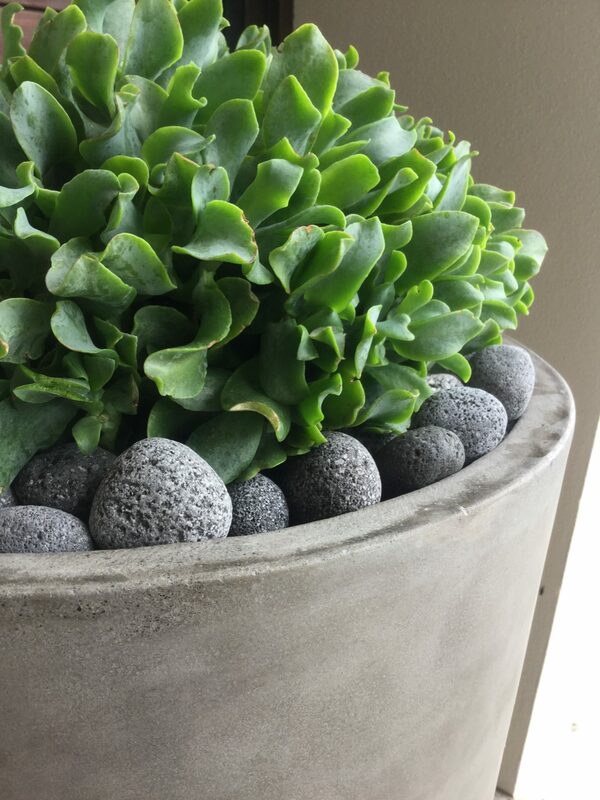 Crassulas are succulent type plants that vary greatly in size, shape and colour. 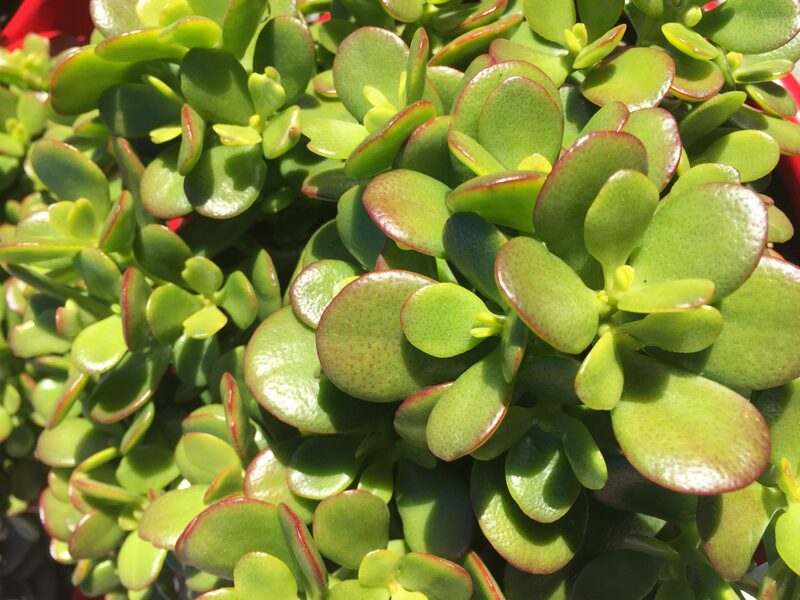 They are native to many parts of the globe, but common varieties we use in landscaping are native to South Africa. 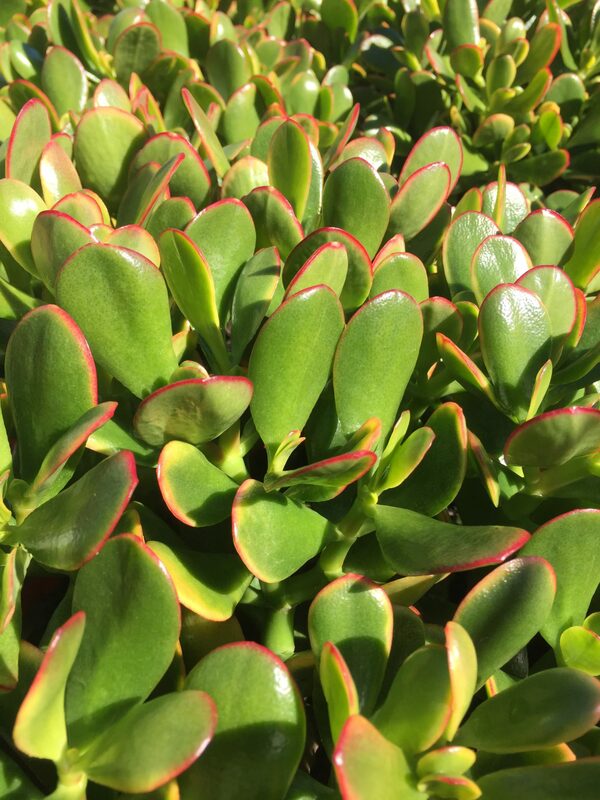 Crassulas have fleshy, shiny, plump, spoon shaped leaves (some varieties have twisted or curled leaves) that are usually short, stemless and are often closely spaced. 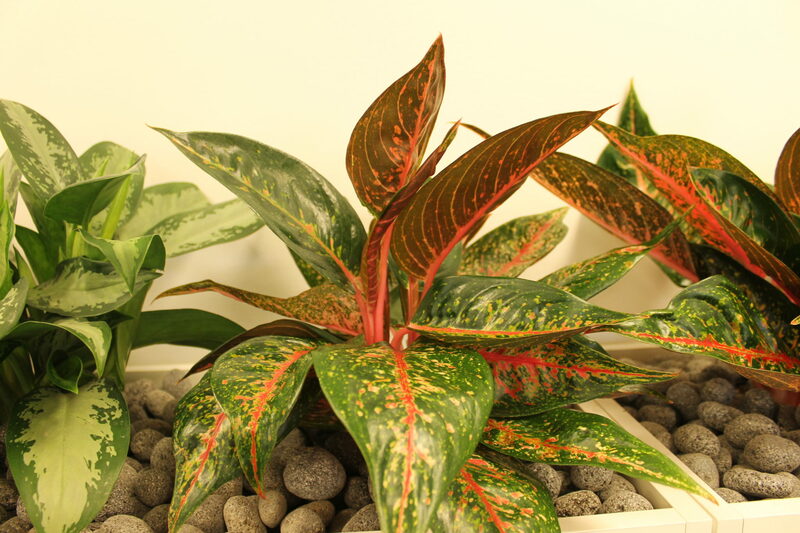 Some leaves are even tinged in crimson, reflecting different weather conditions. 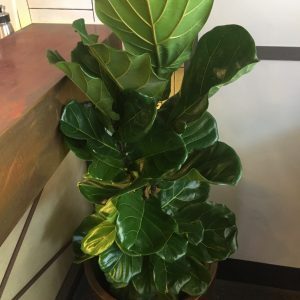 They have tree-like woody branches that are thick and fleshy to hold the heavy leaves. 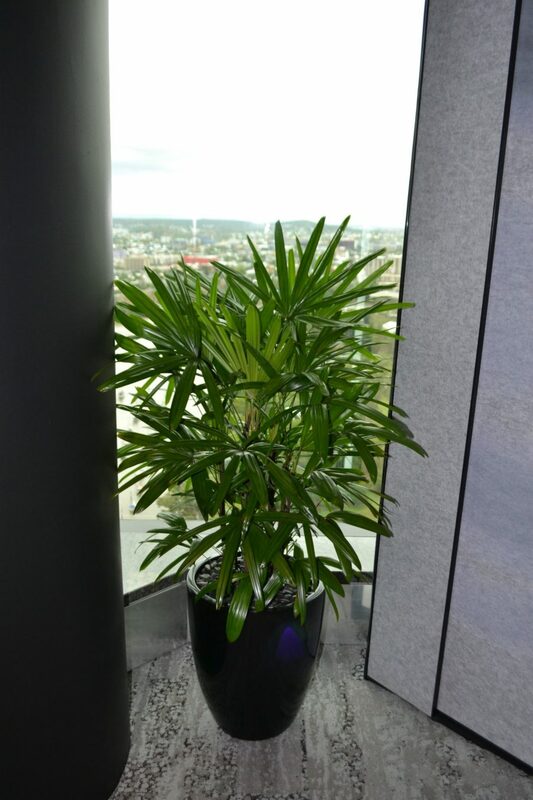 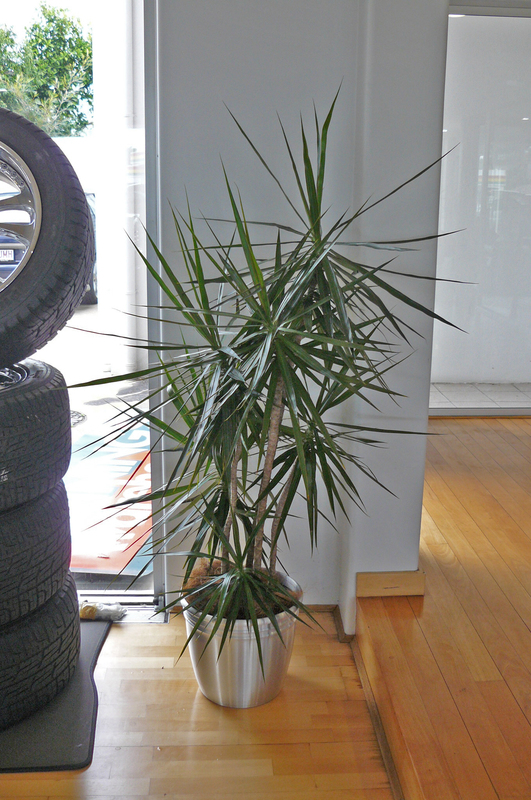 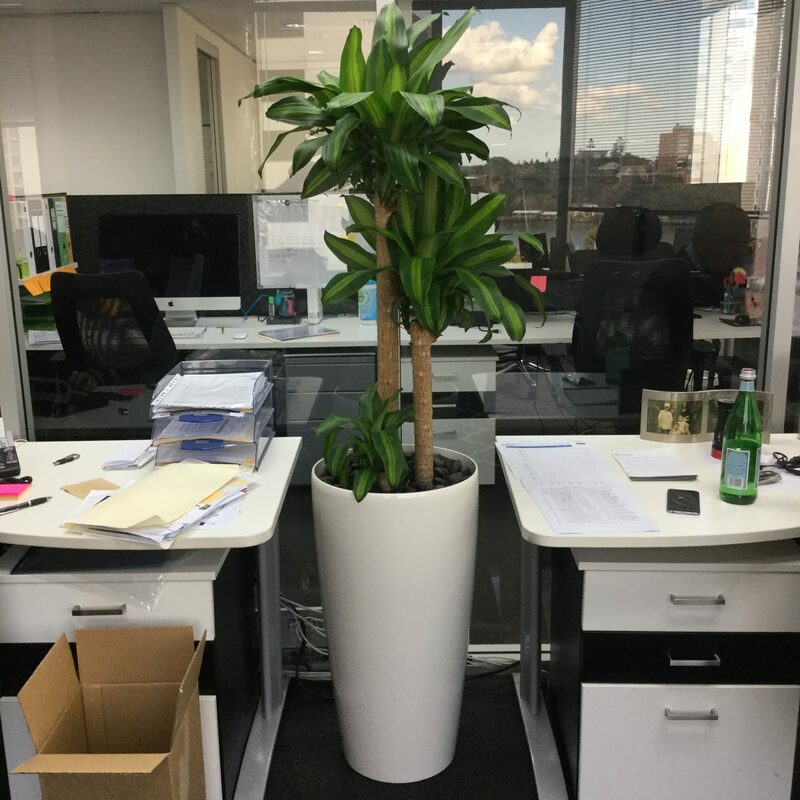 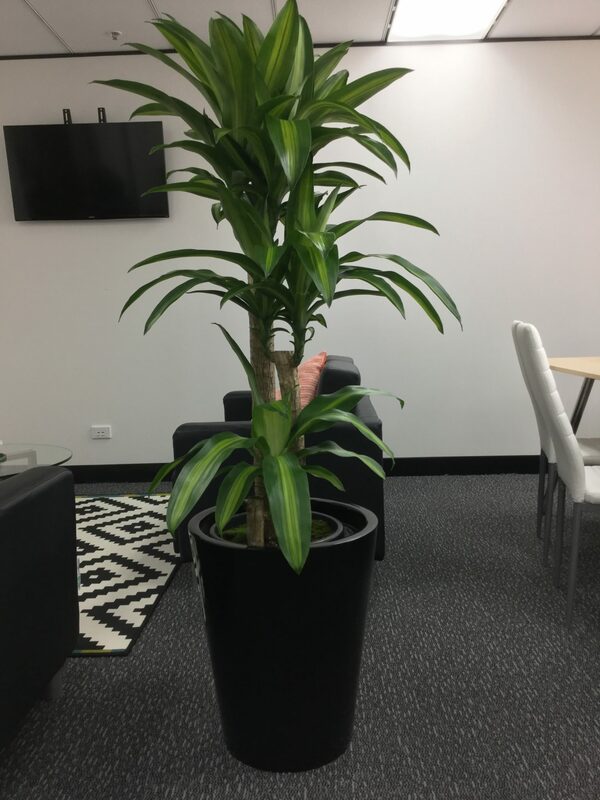 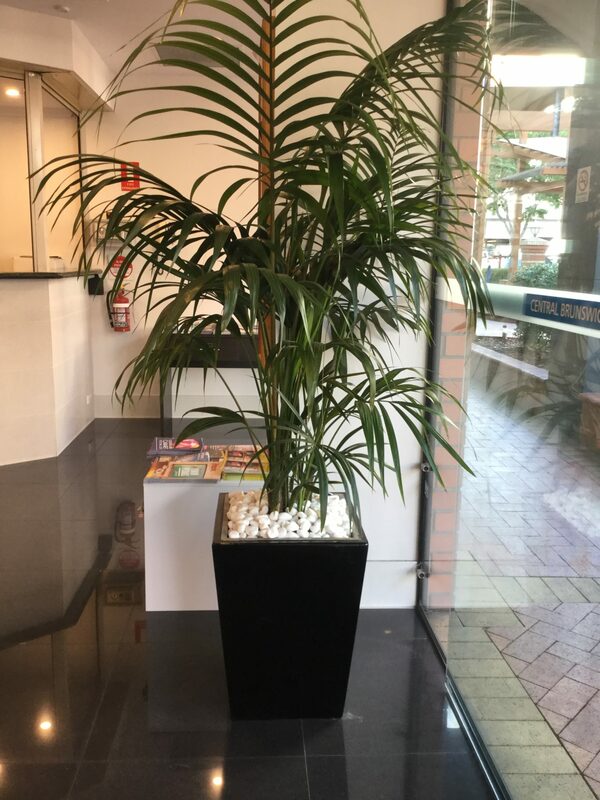 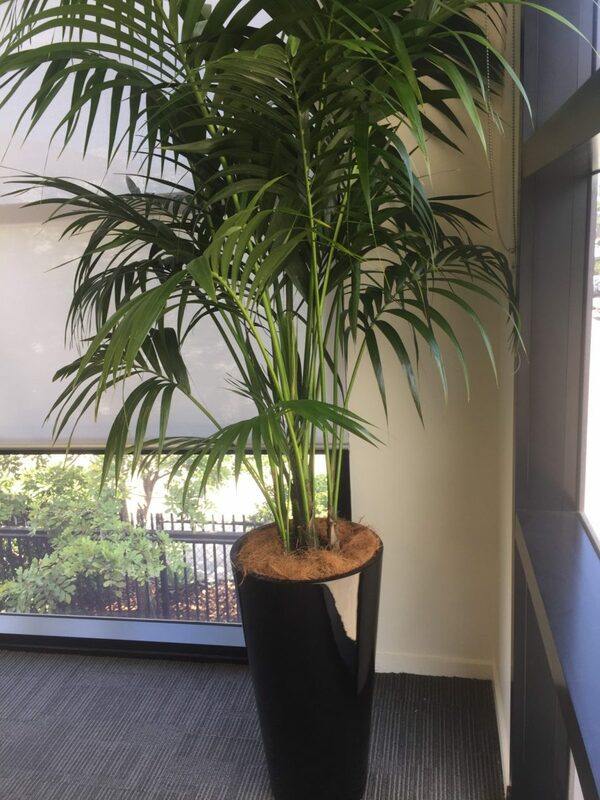 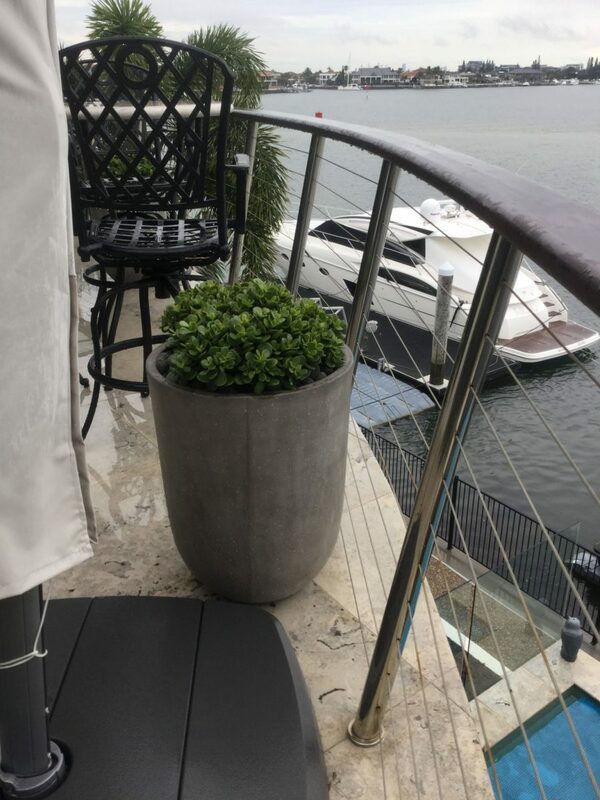 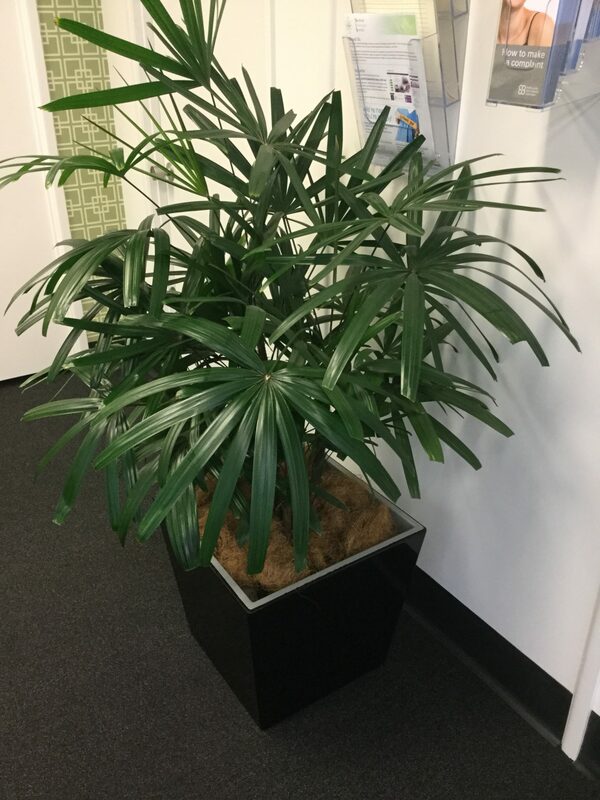 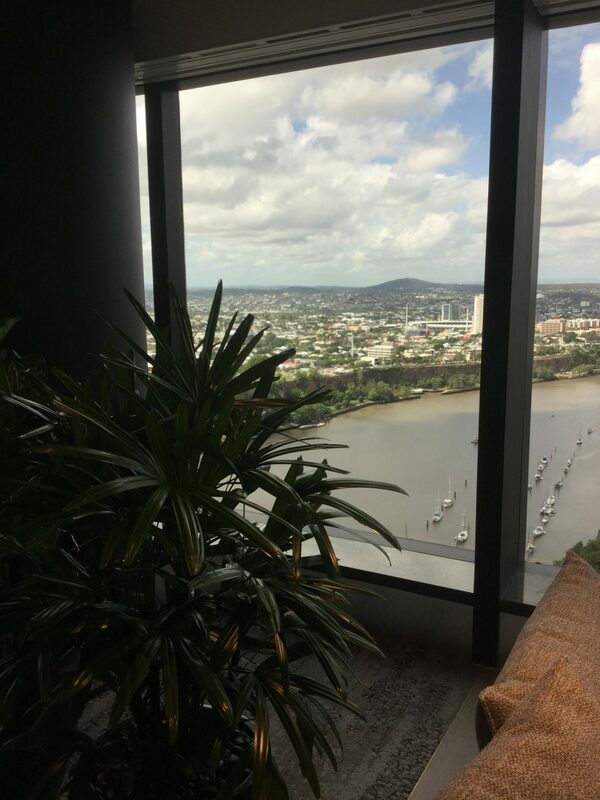 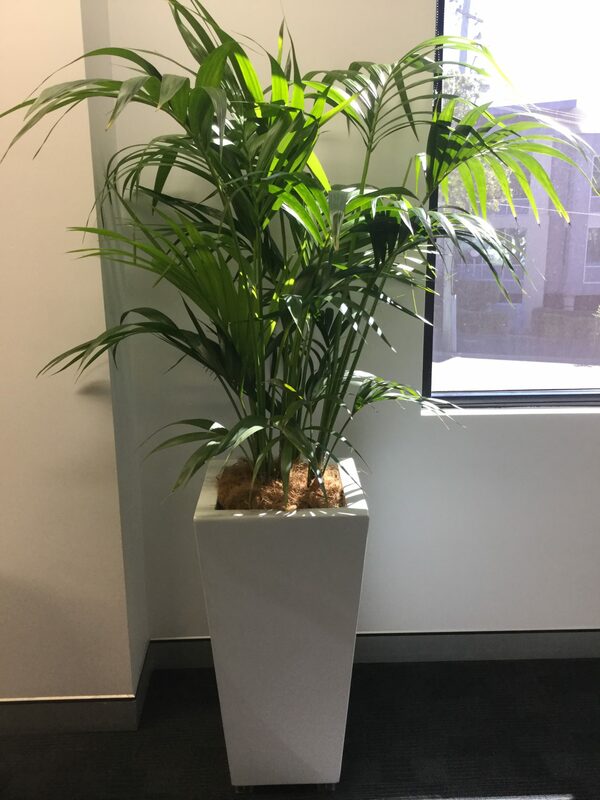 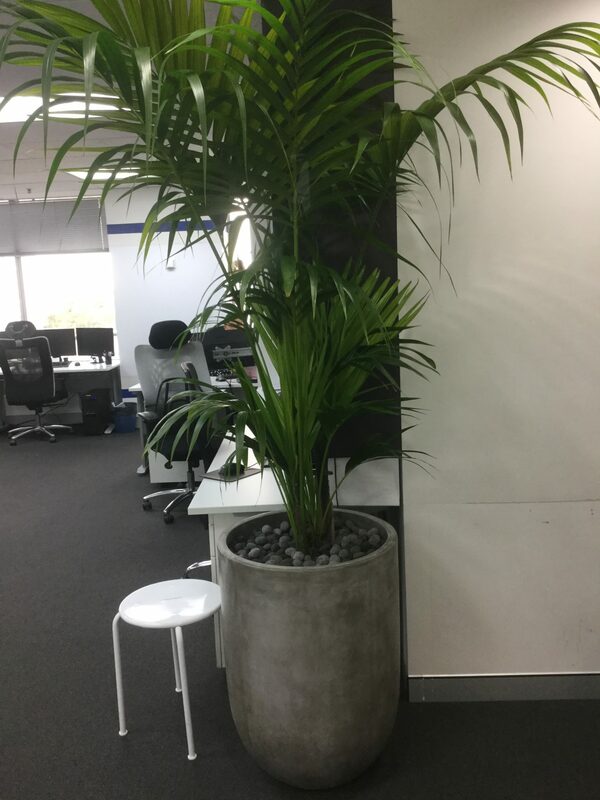 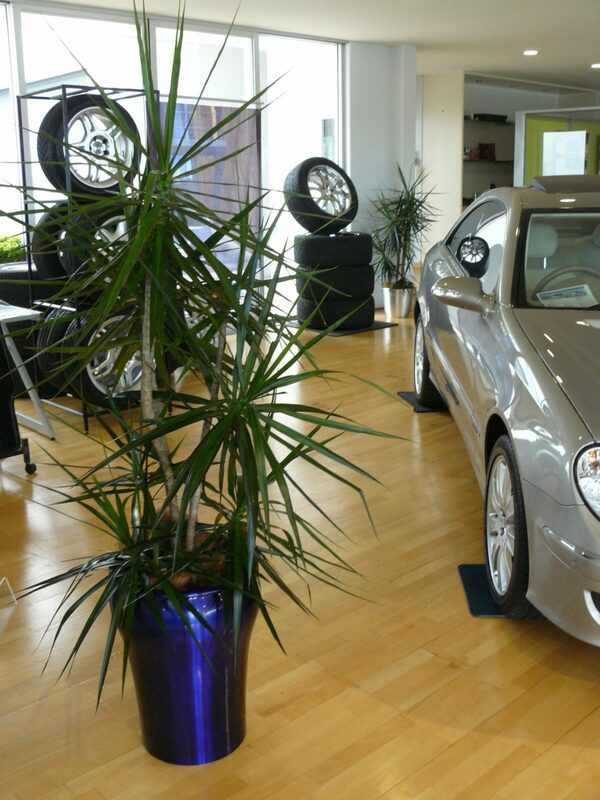 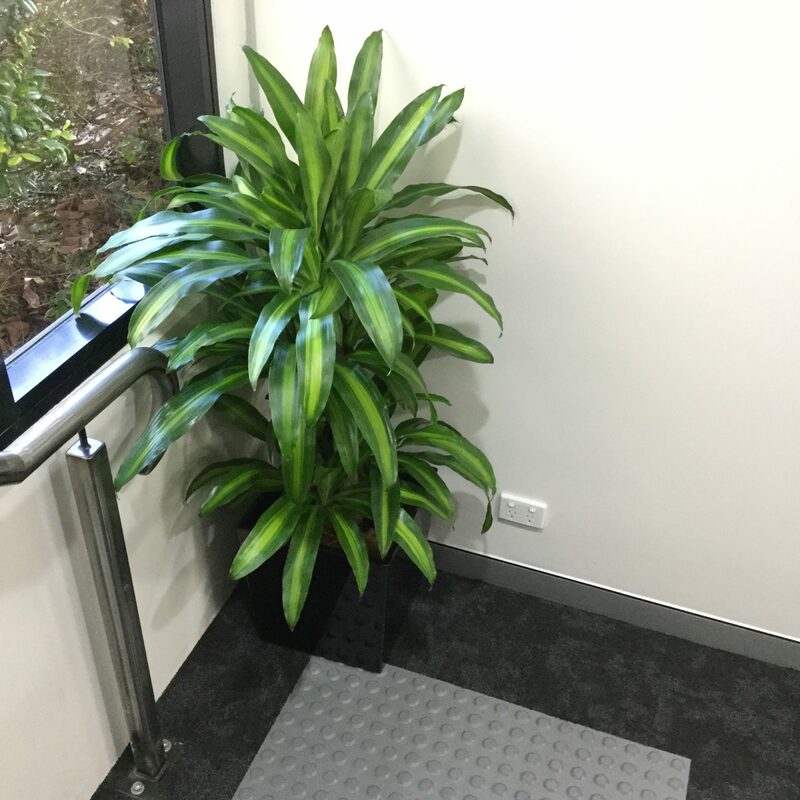 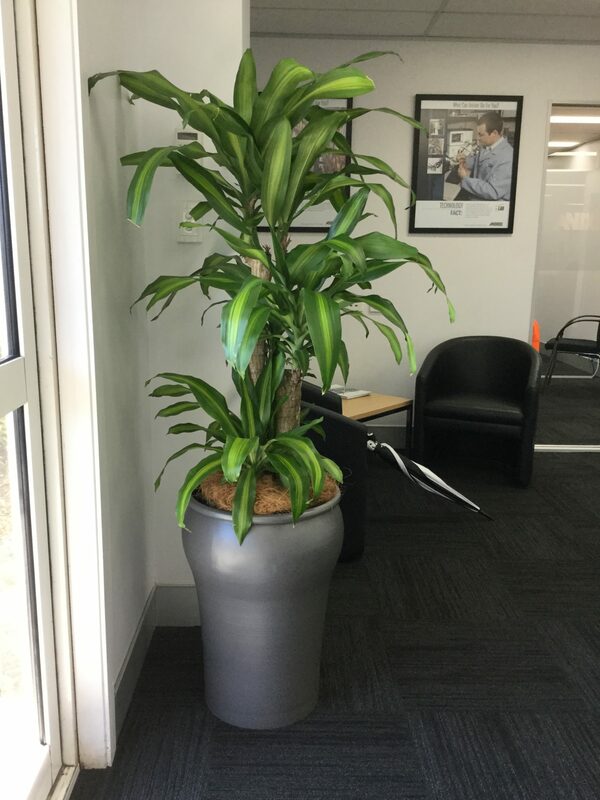 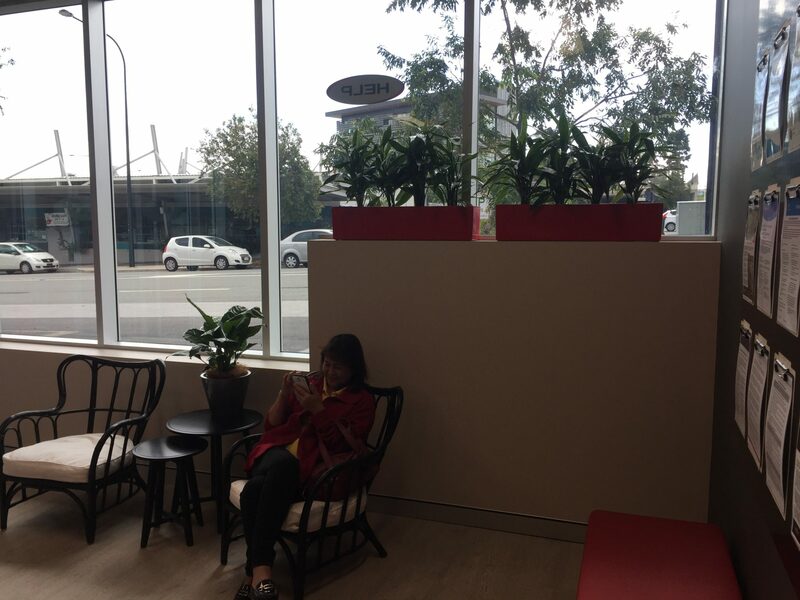 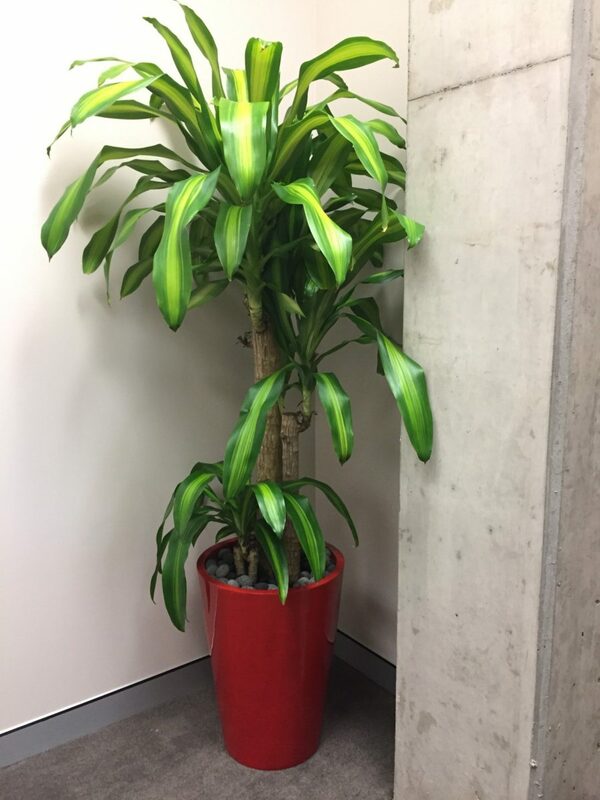 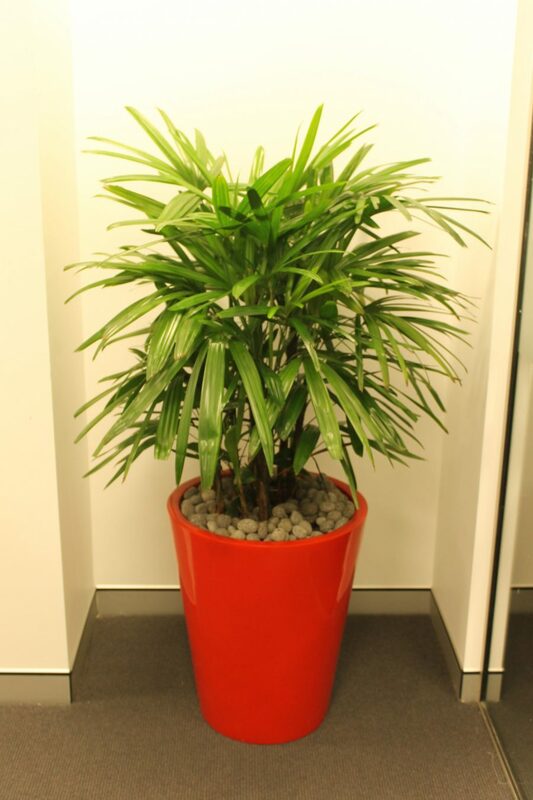 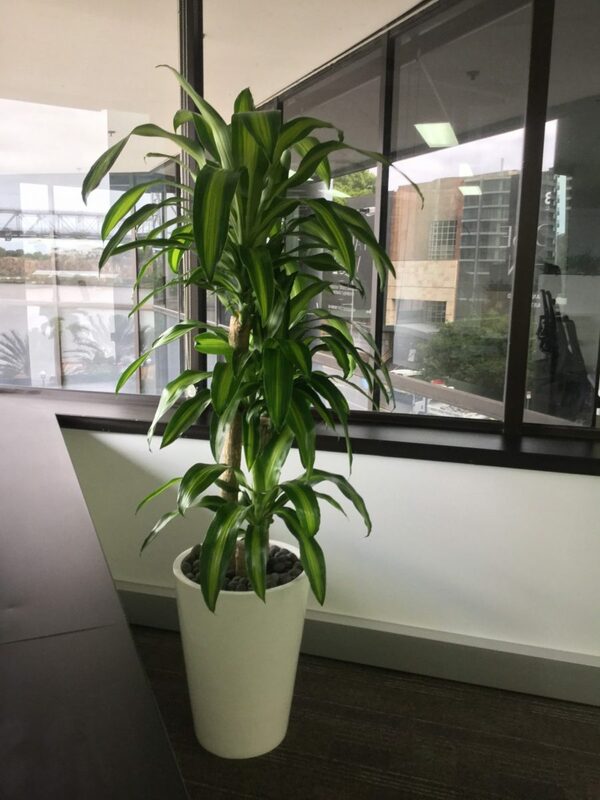 This is an Australian palm, very popular as an indoor plant throughout the world. 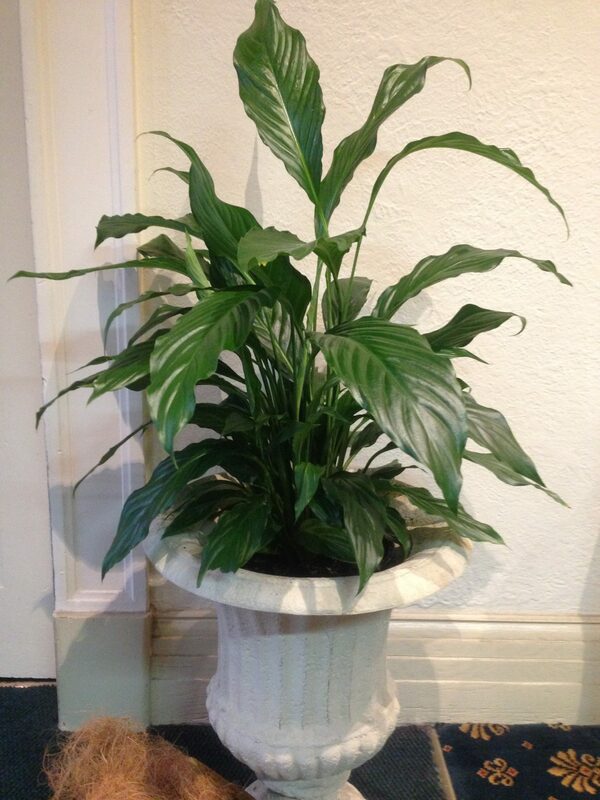 They are single trunked with elegant, arching feathered fronds that seem to almost spread into a fan. 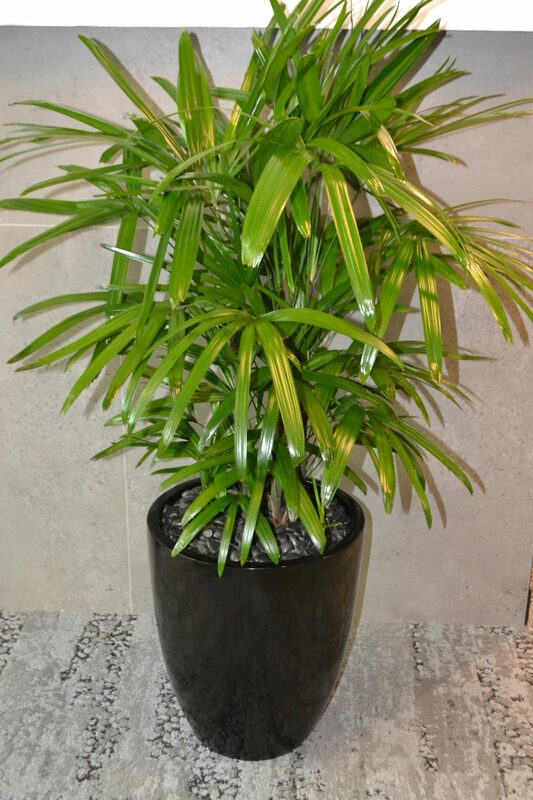 This is a lovely clumping palm which is also very popular around the world. 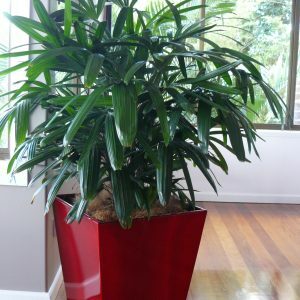 Large, thick, fan like leaves with blunt tips sit on top of thin trunks that form in a dense clump, giving the plant a nice thick appearance. 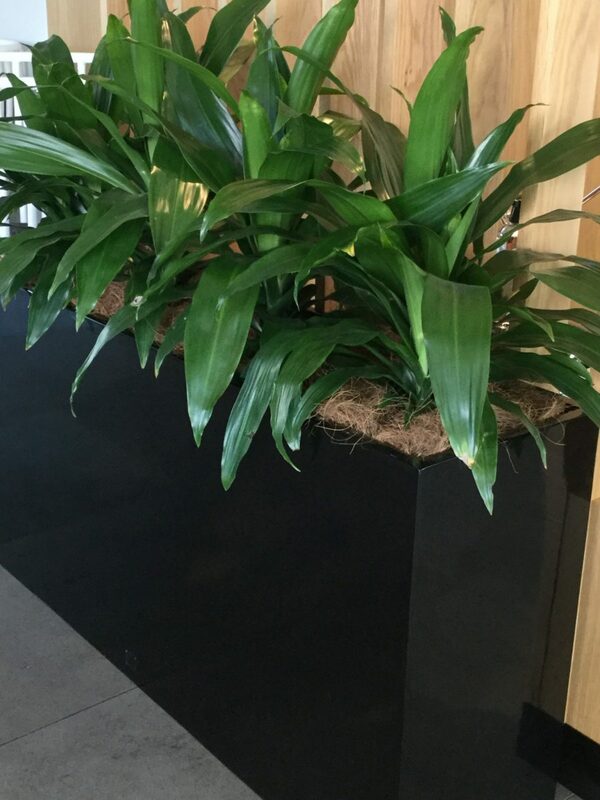 These thin trunks are covered in a coarse, dark brown fibre which contrasts beautifully with the dark green foliage. 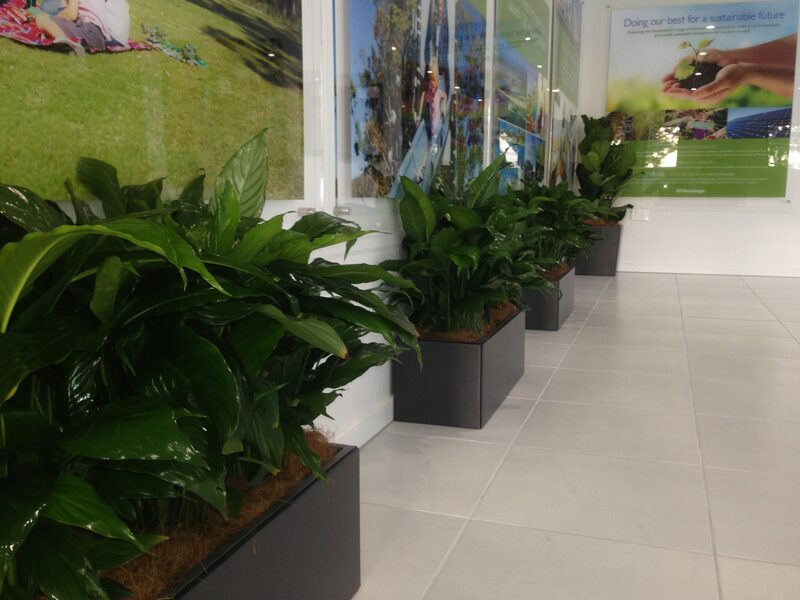 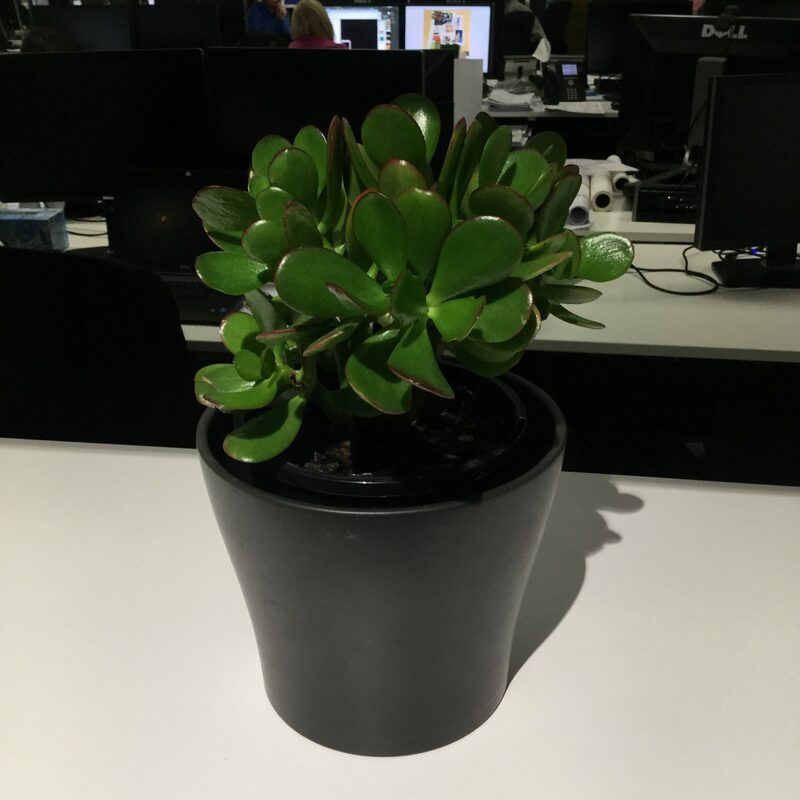 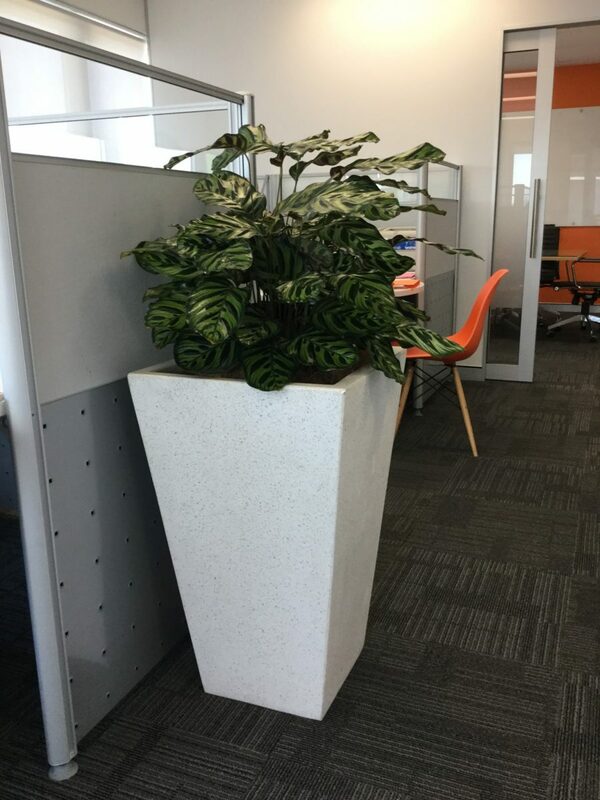 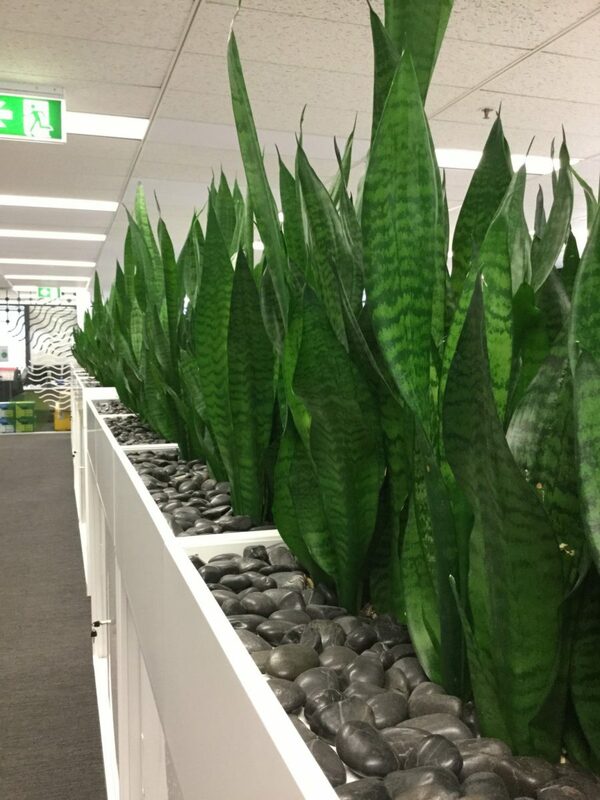 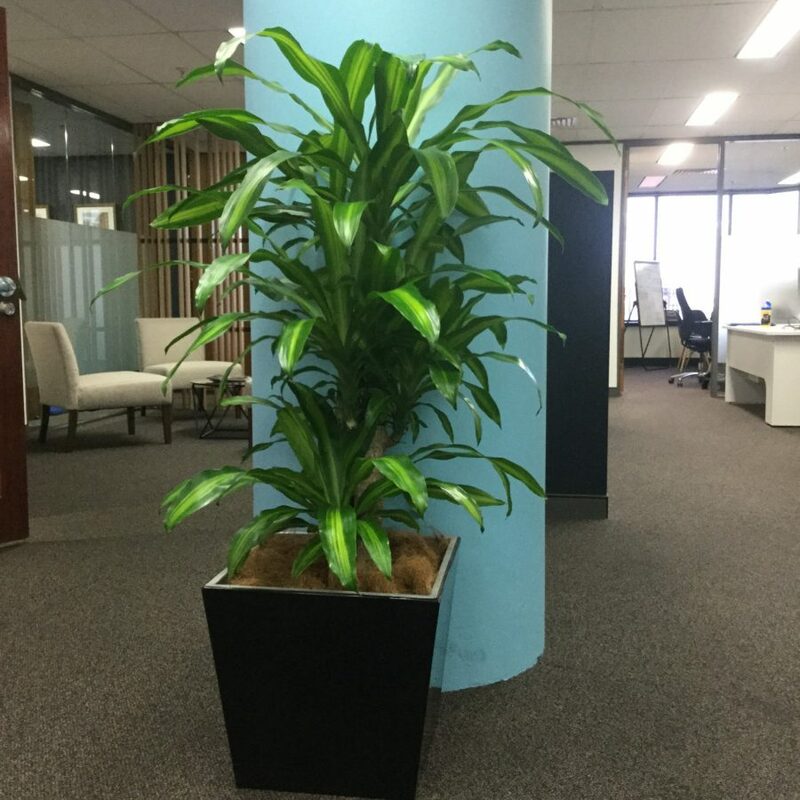 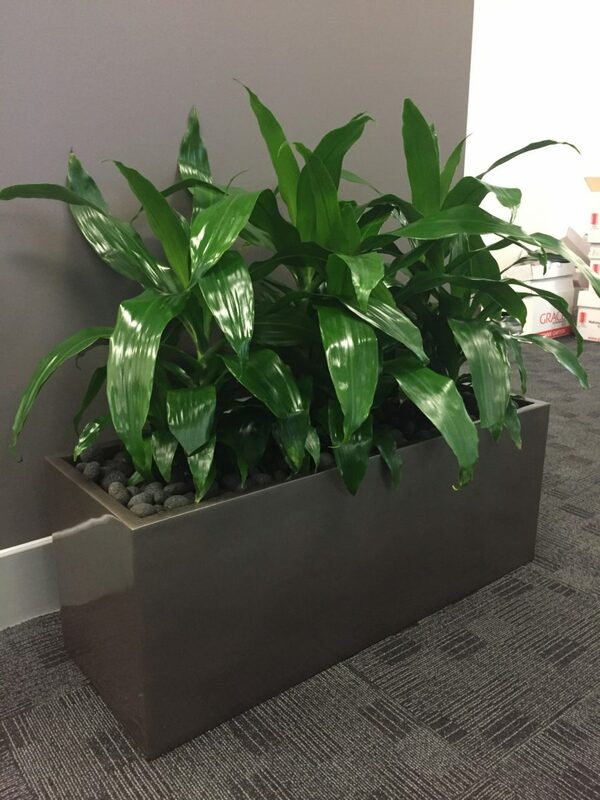 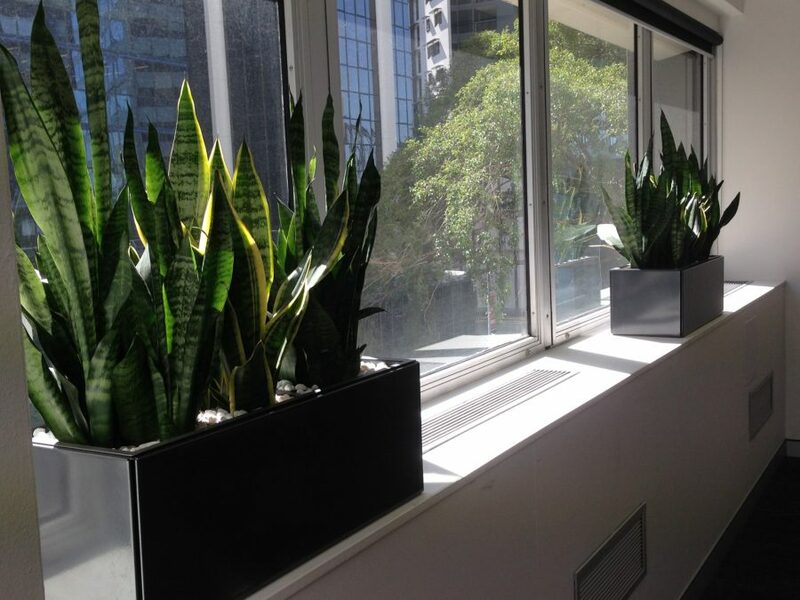 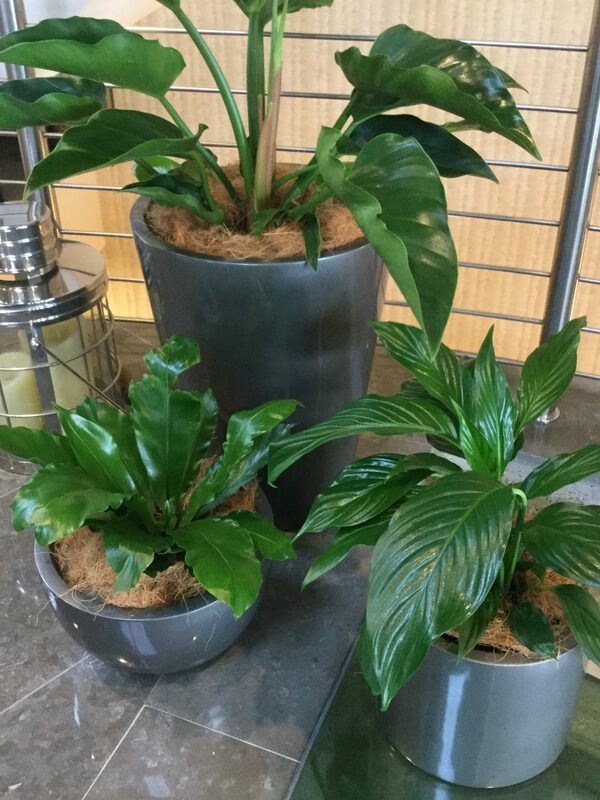 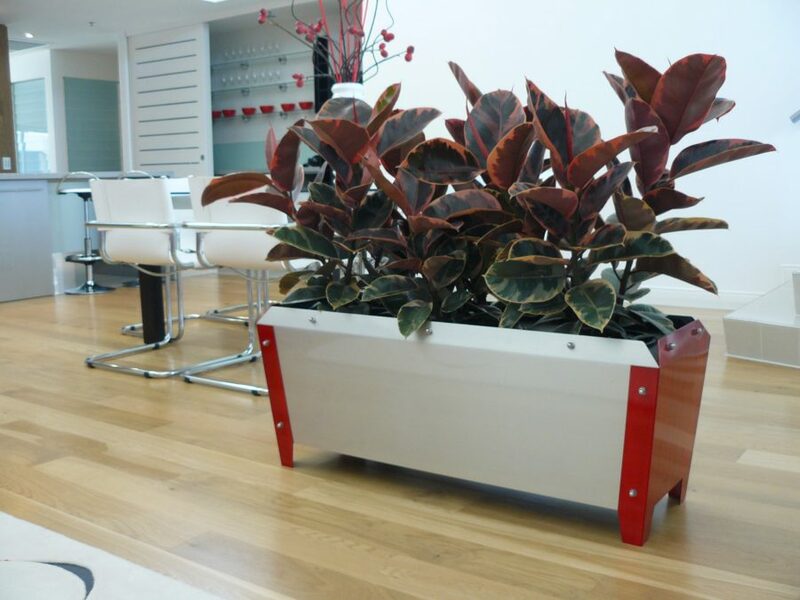 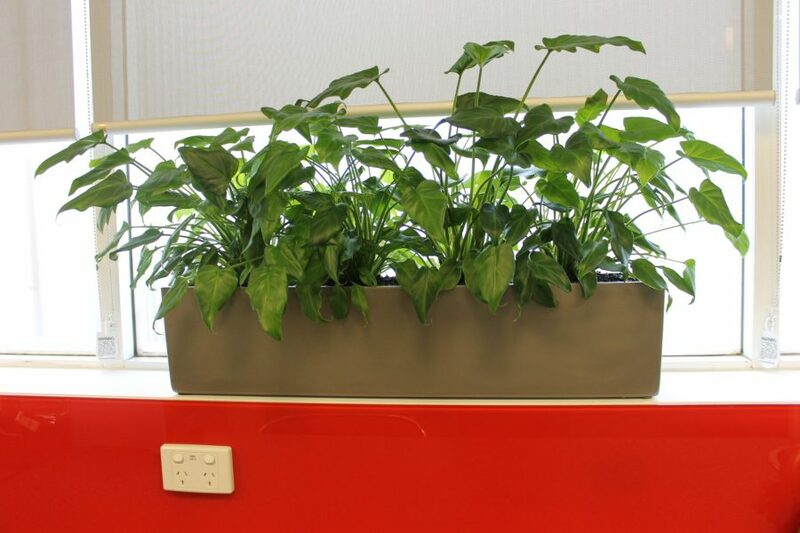 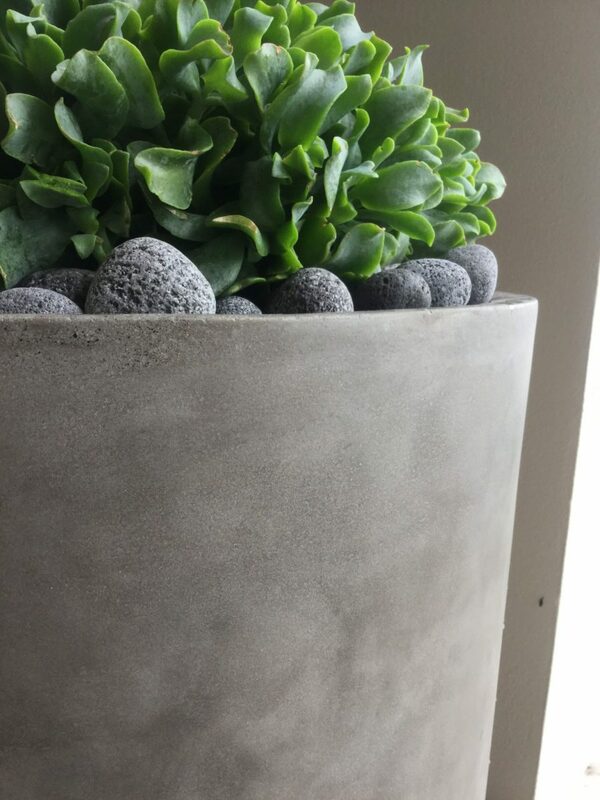 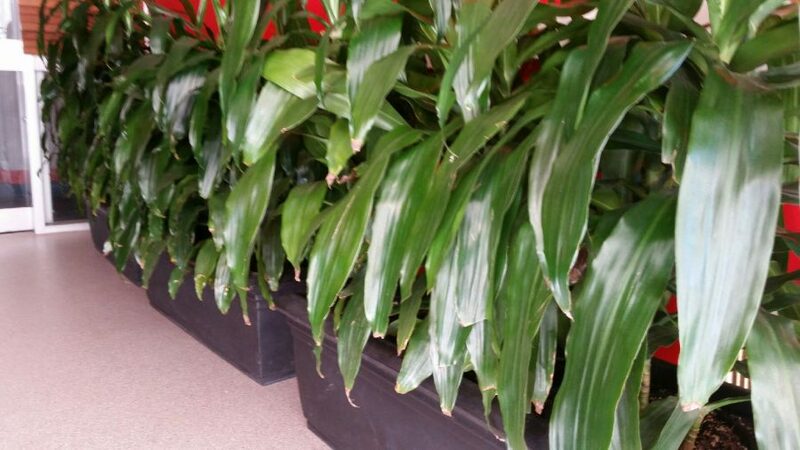 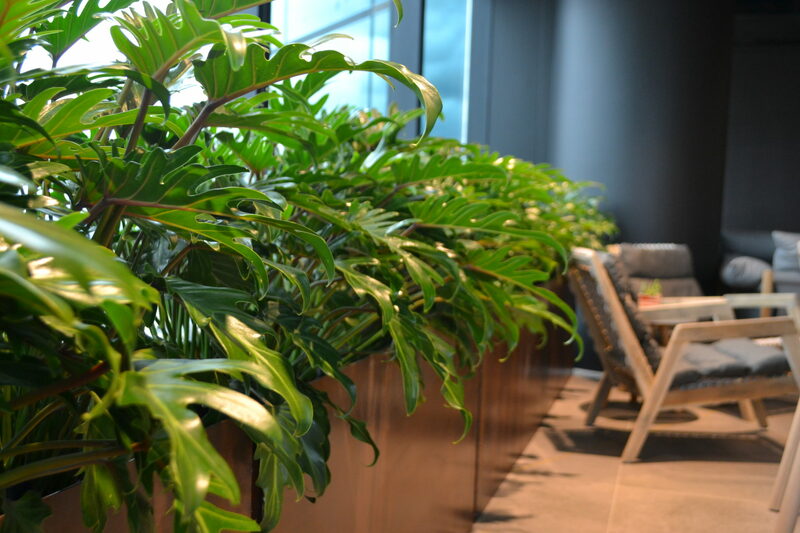 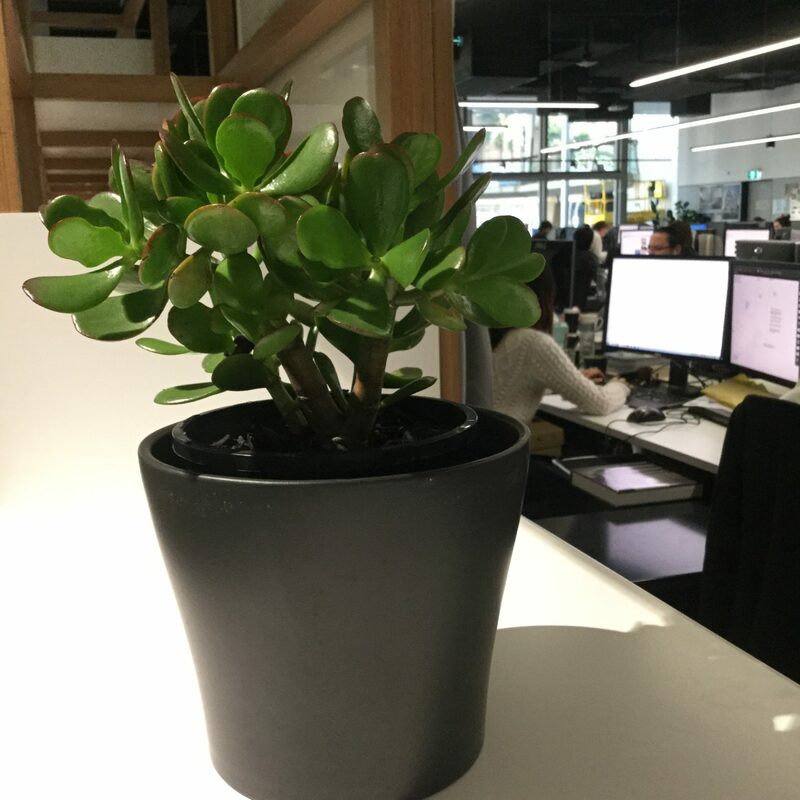 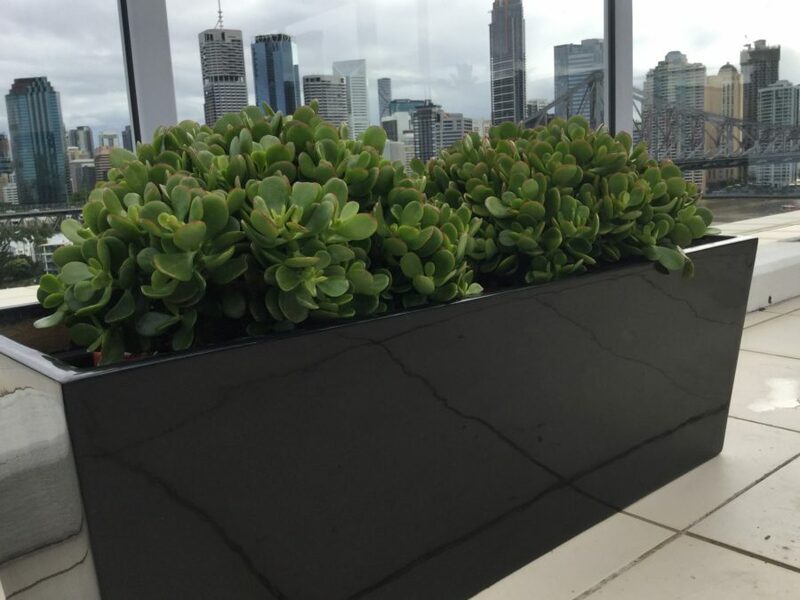 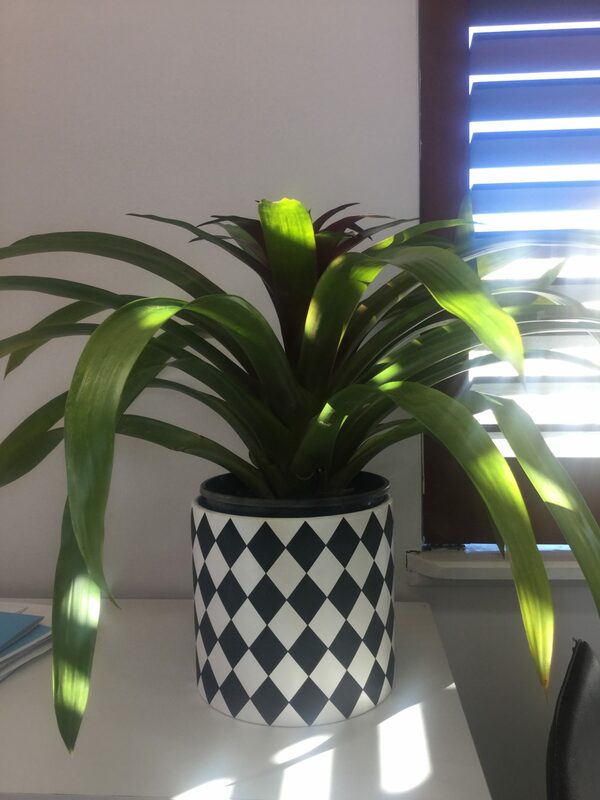 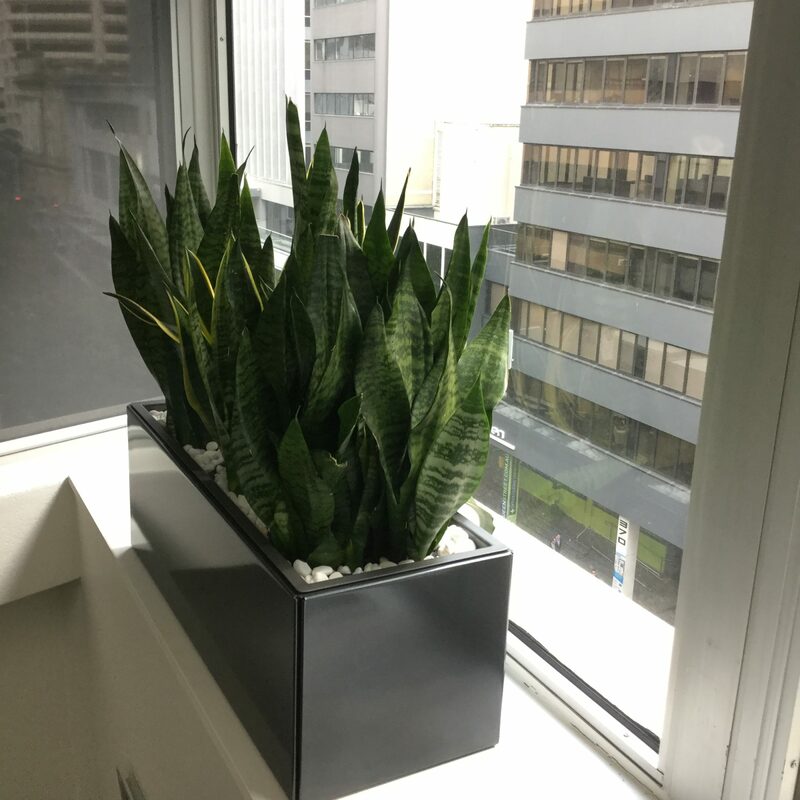 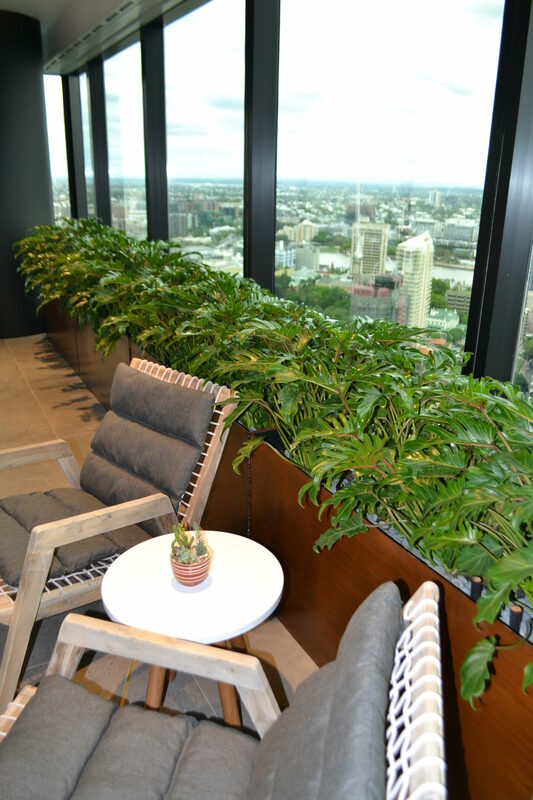 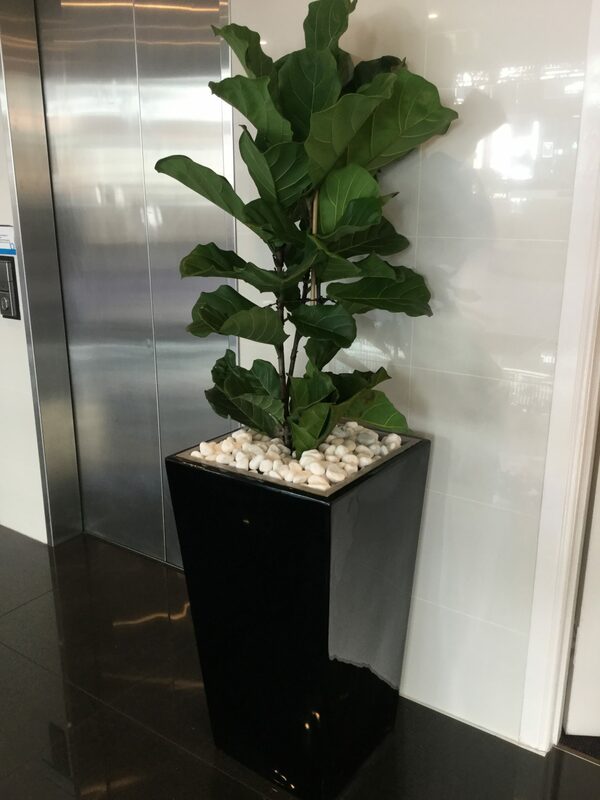 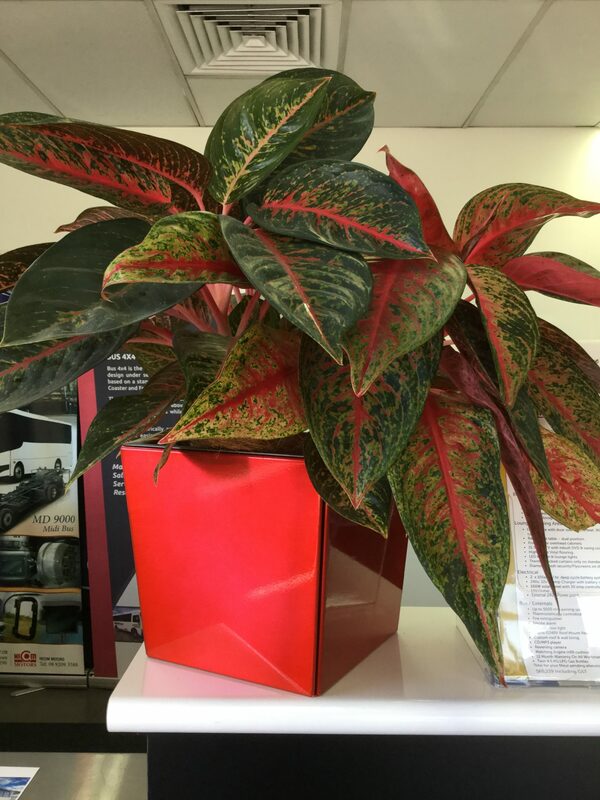 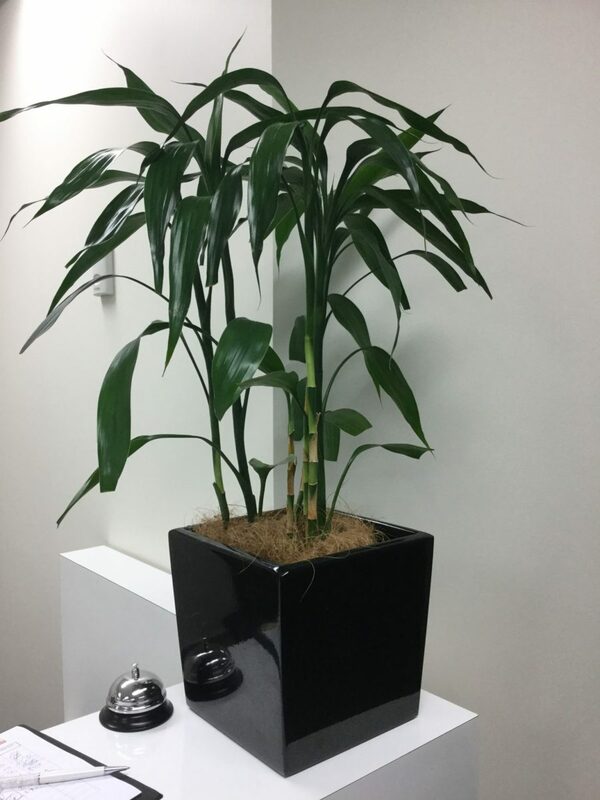 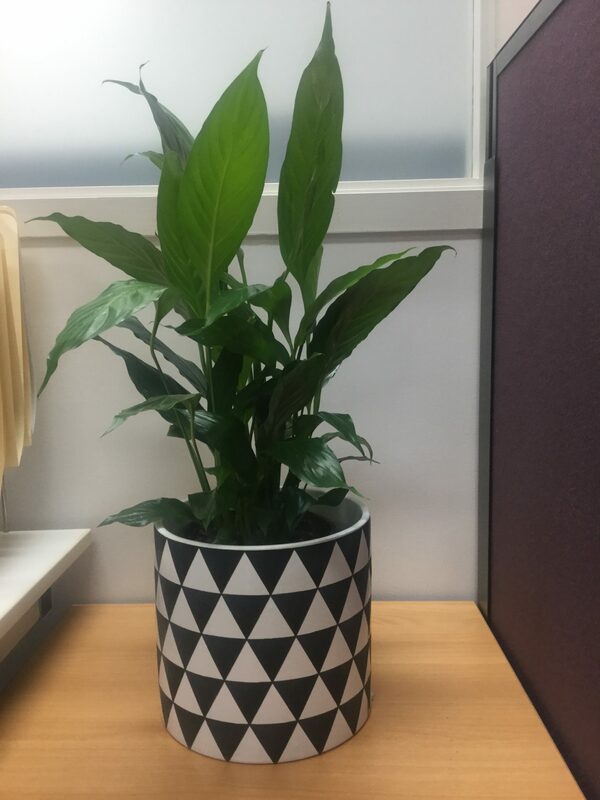 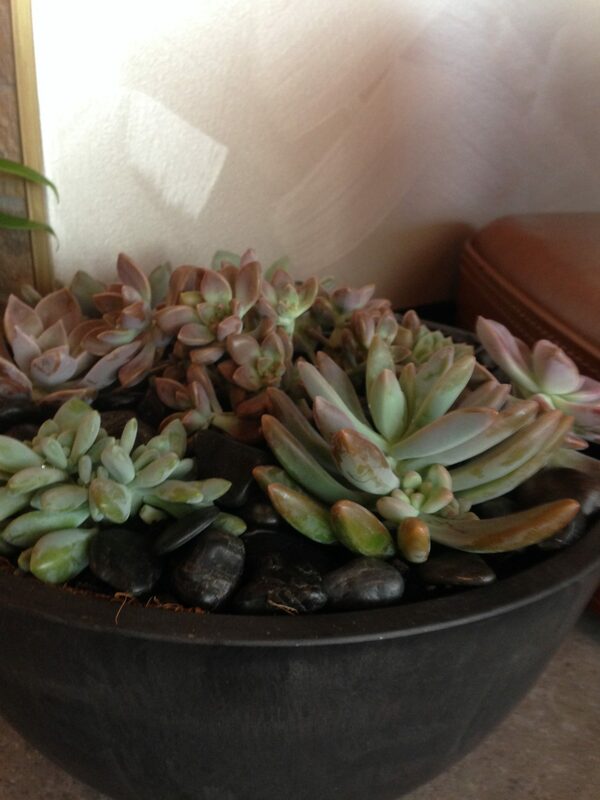 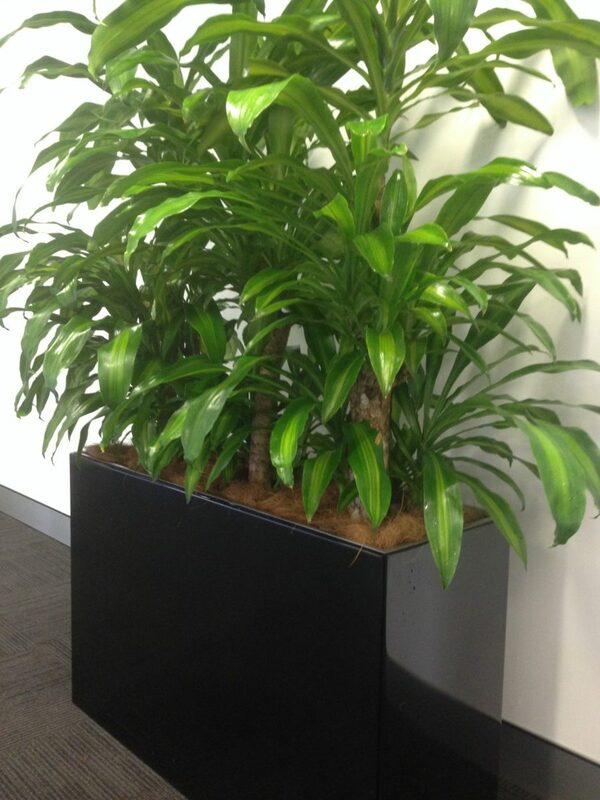 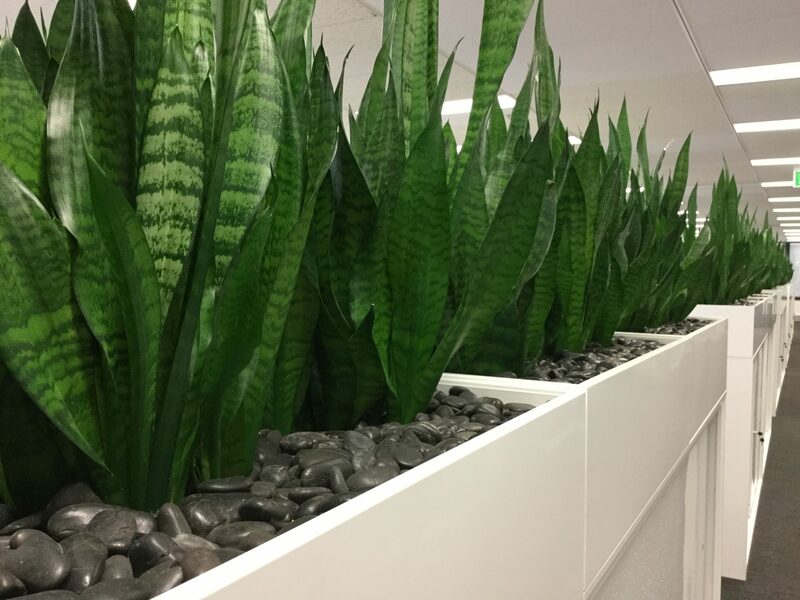 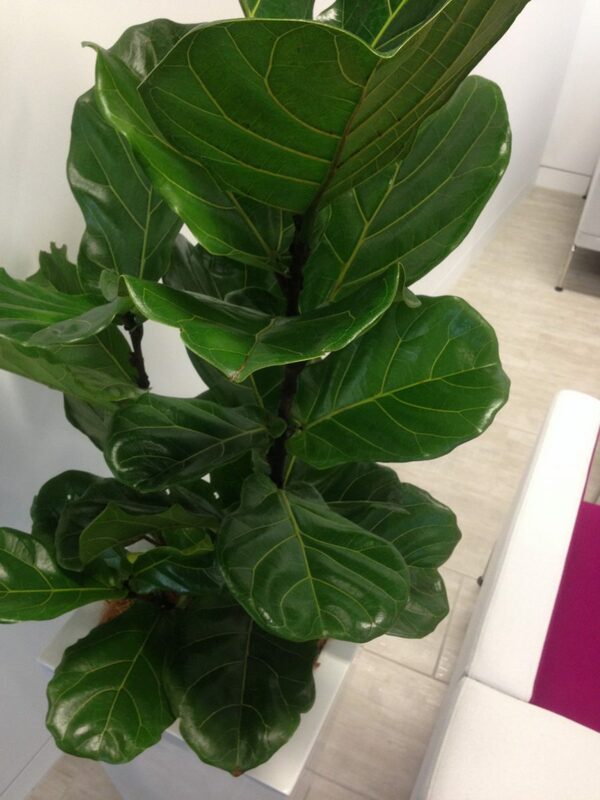 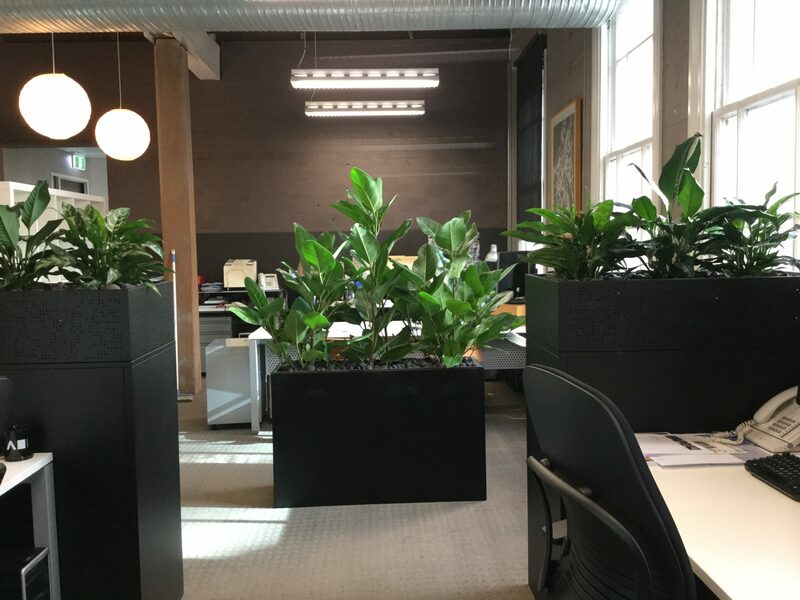 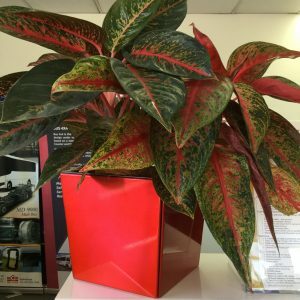 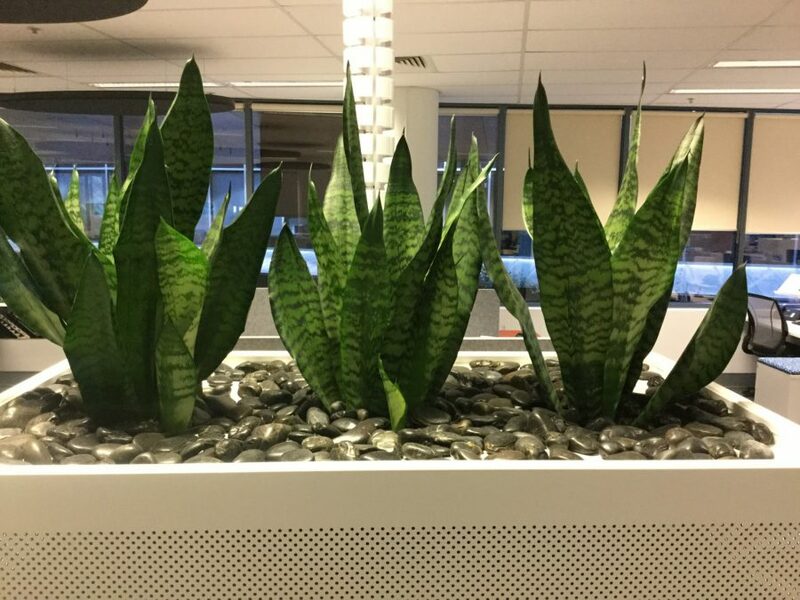 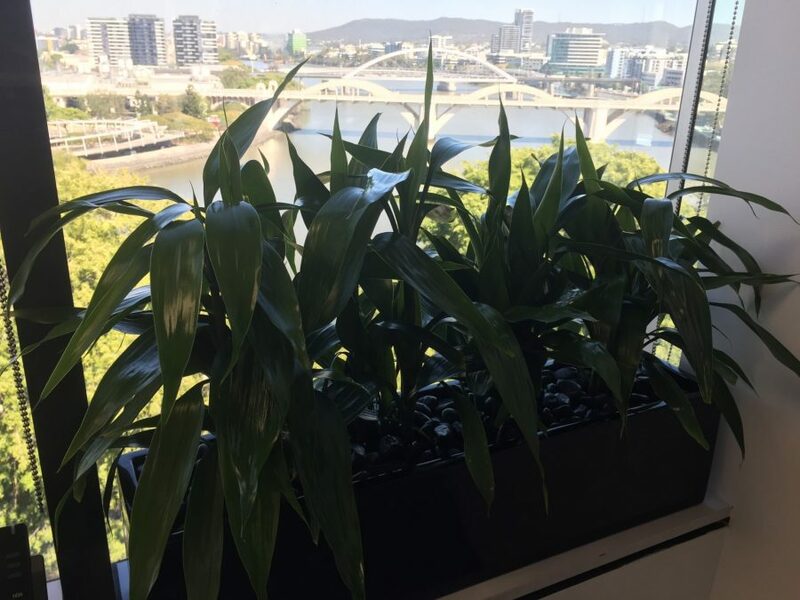 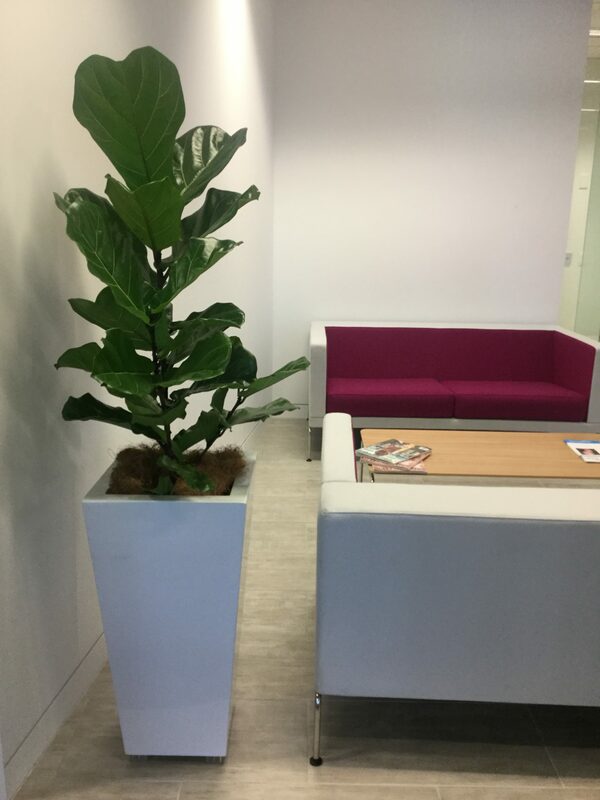 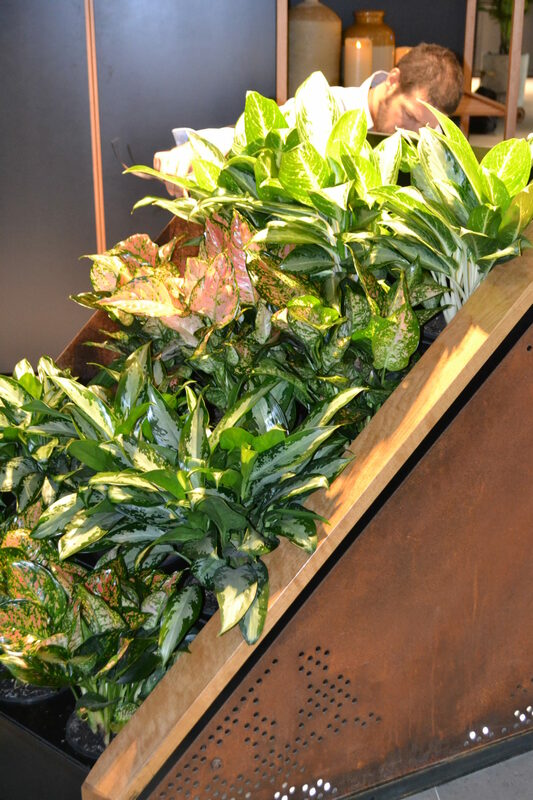 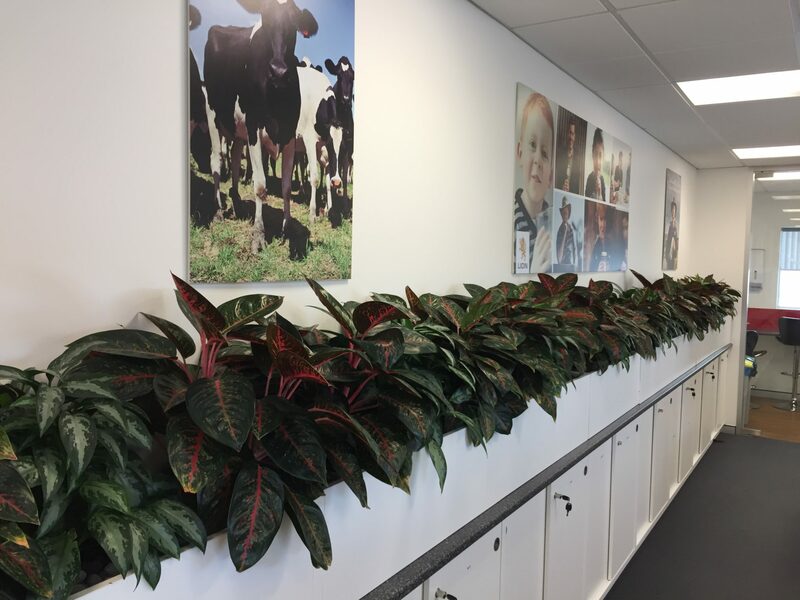 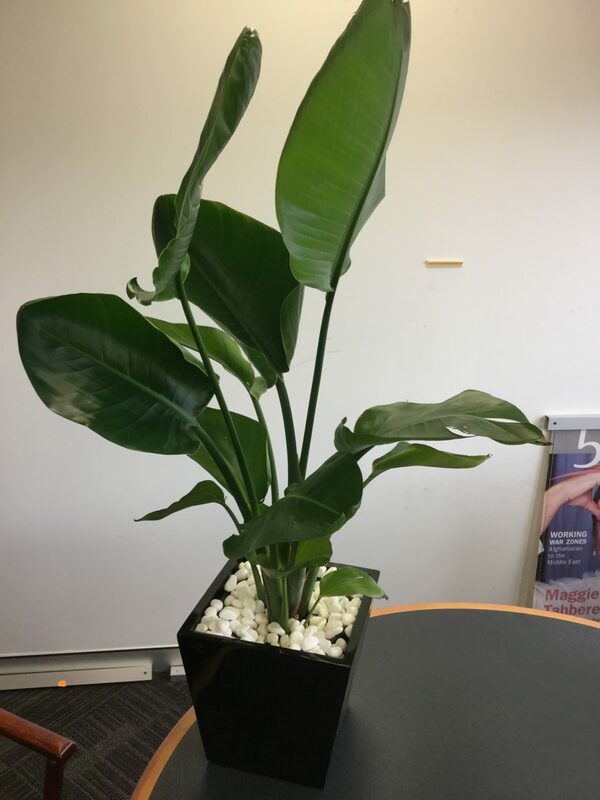 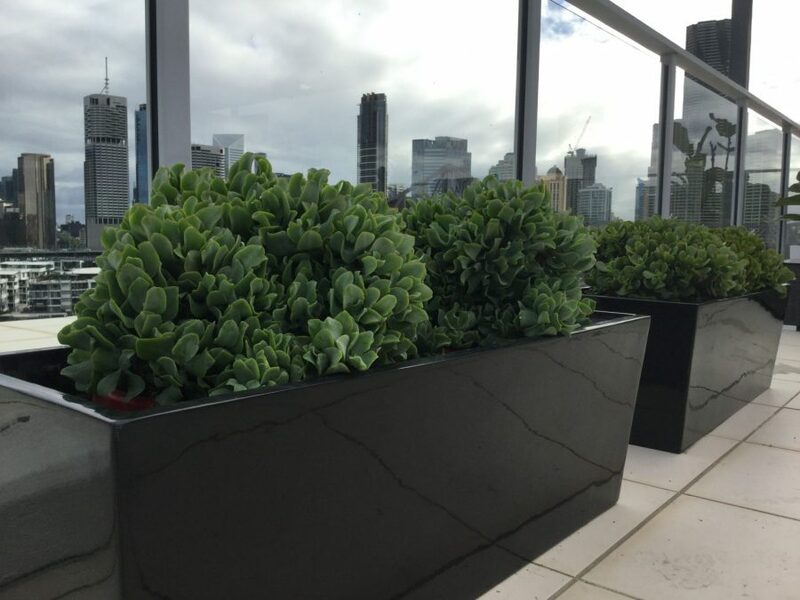 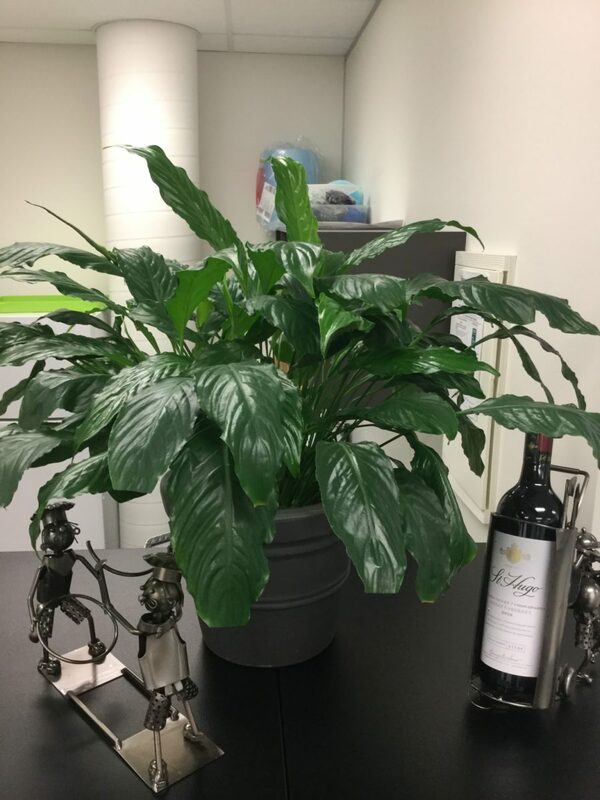 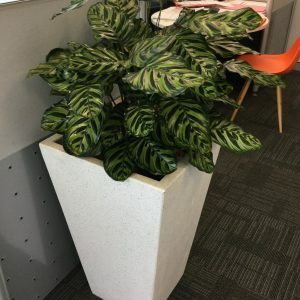 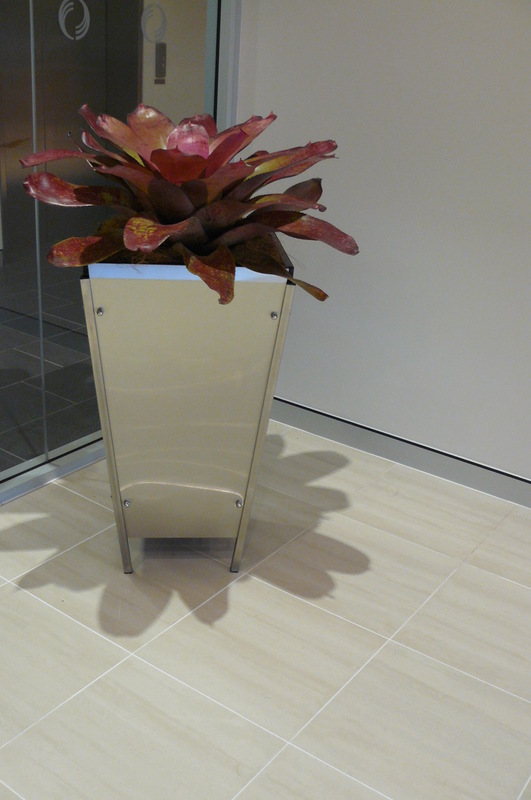 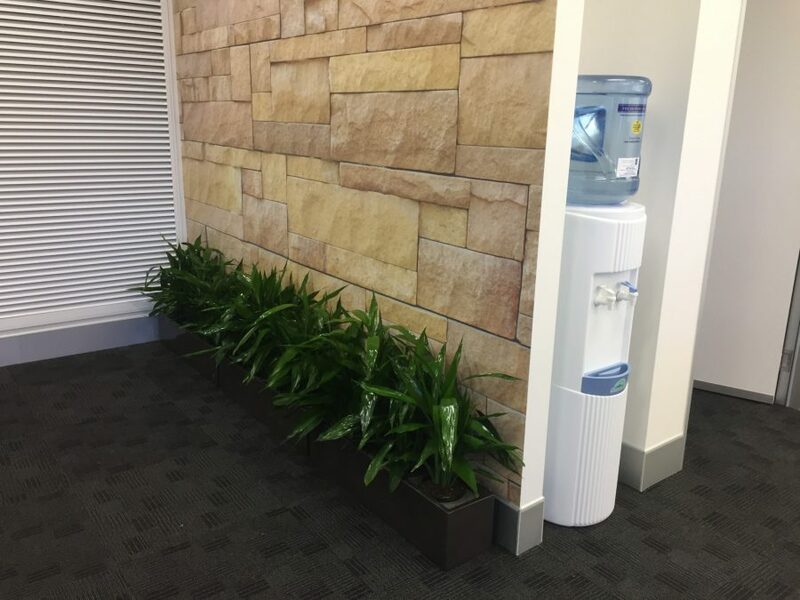 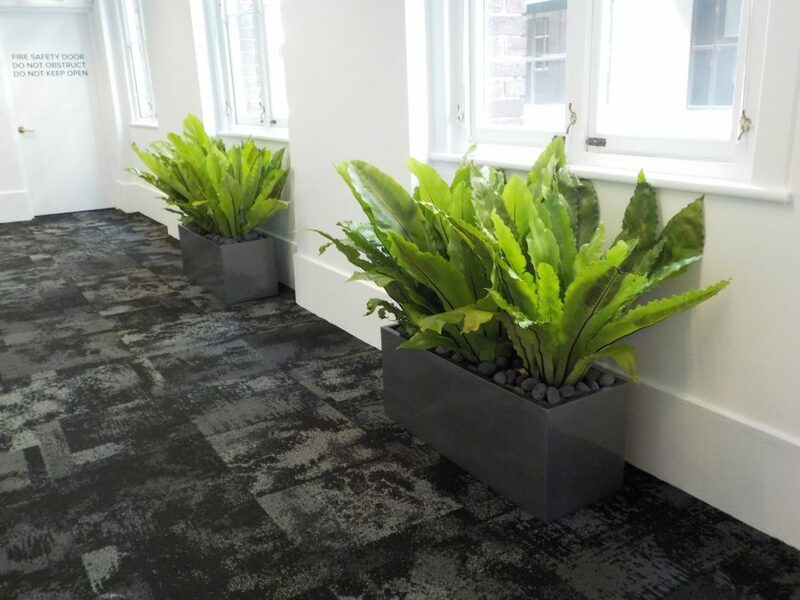 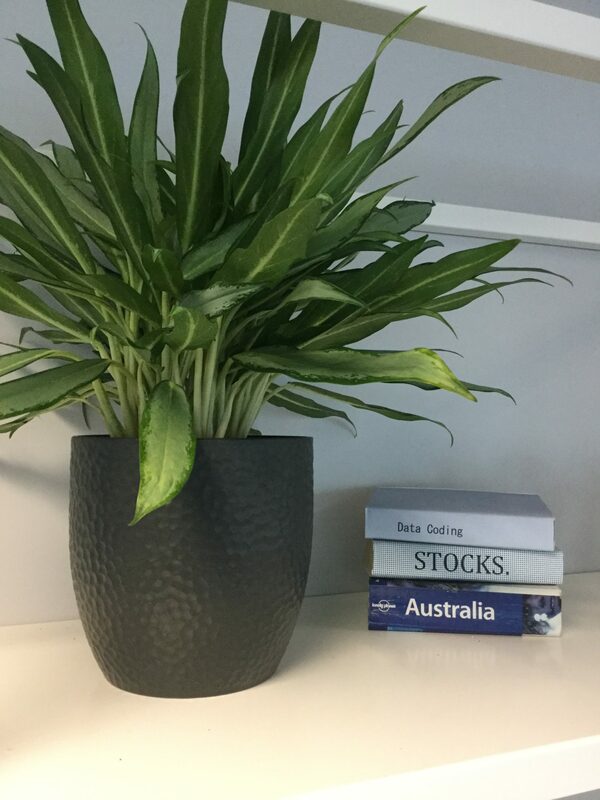 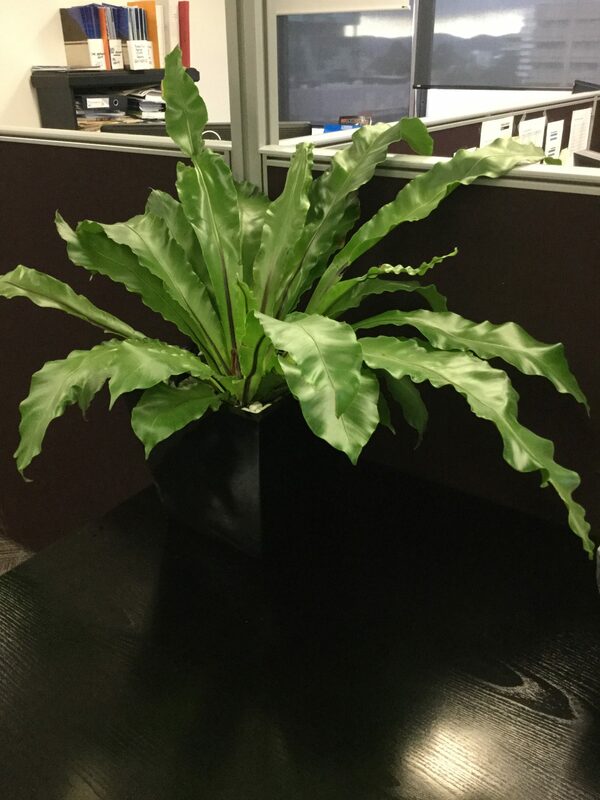 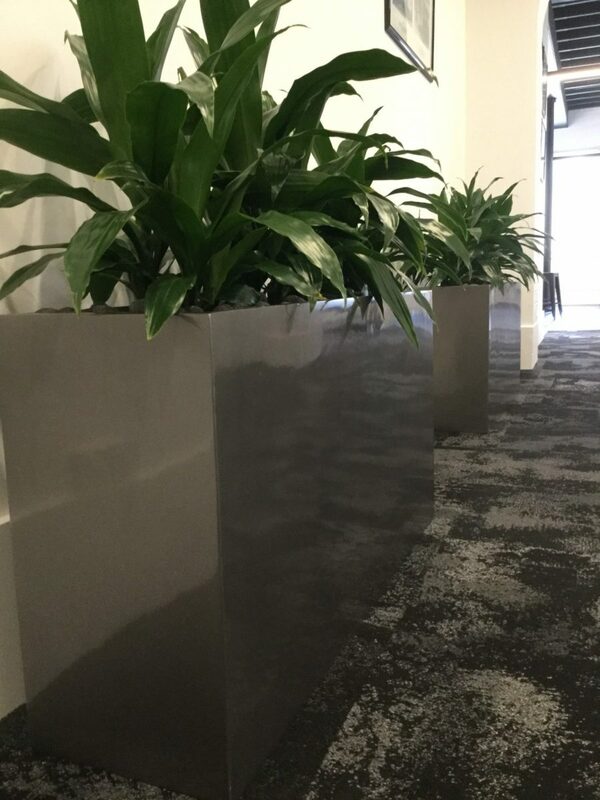 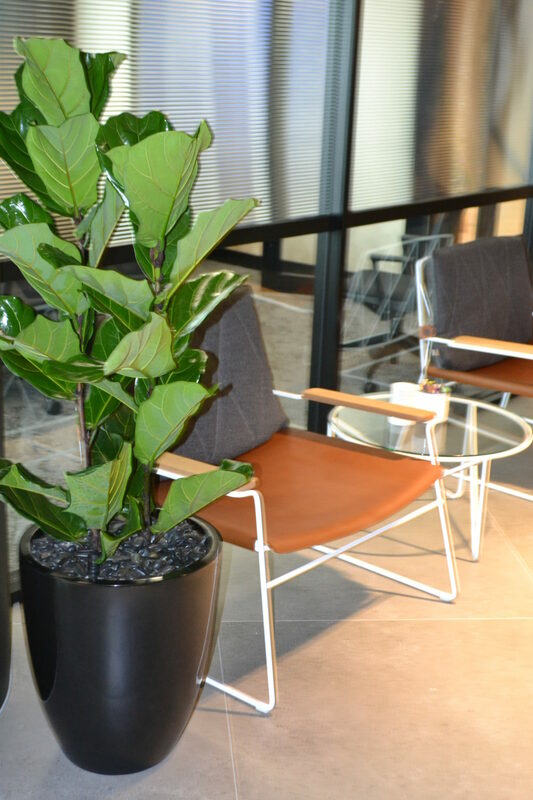 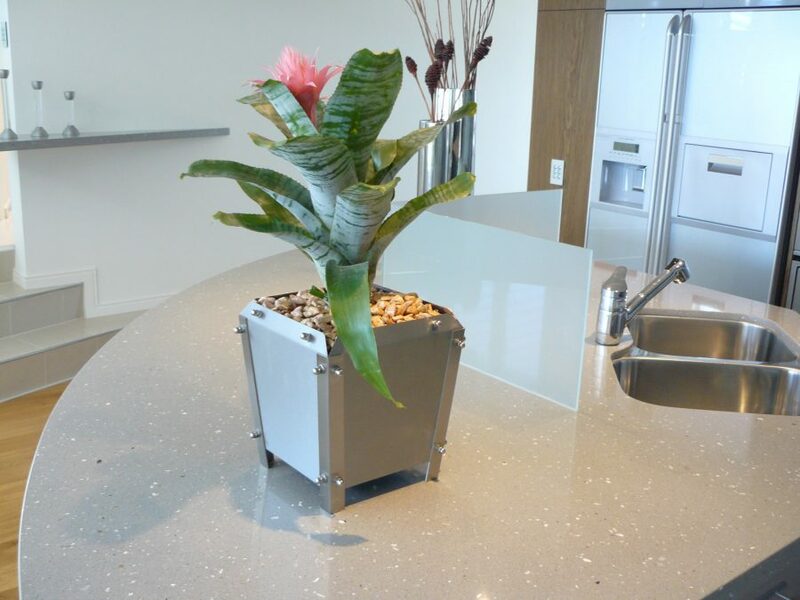 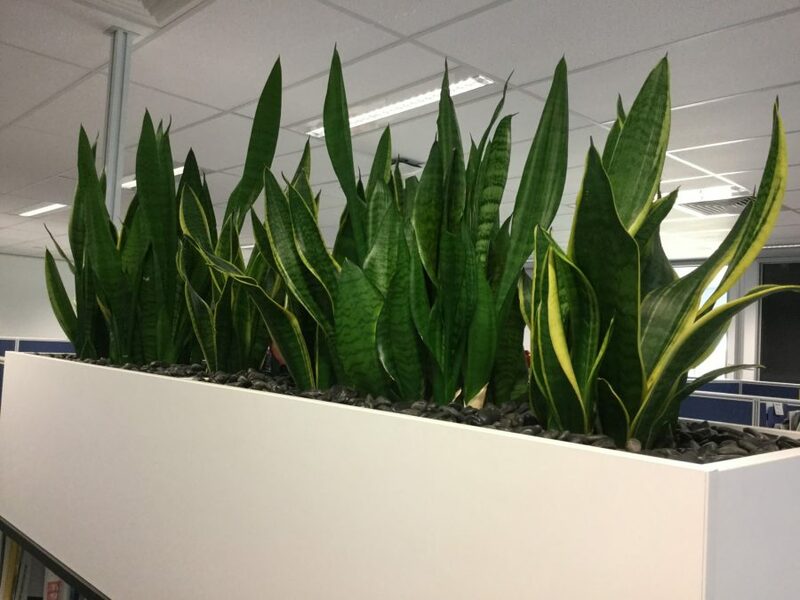 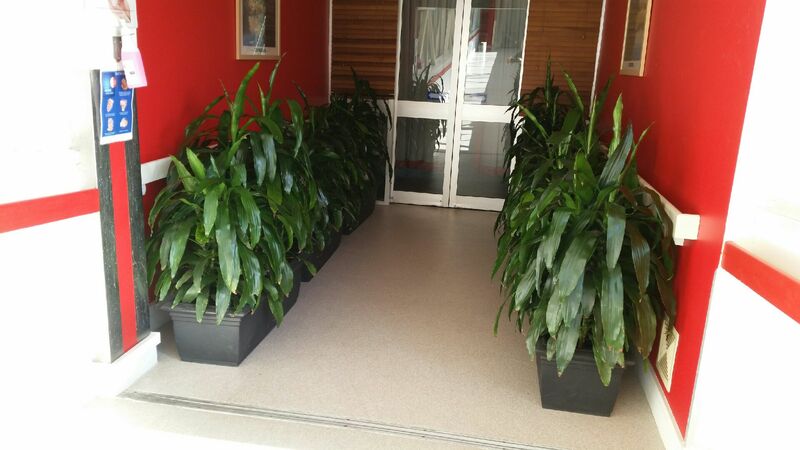 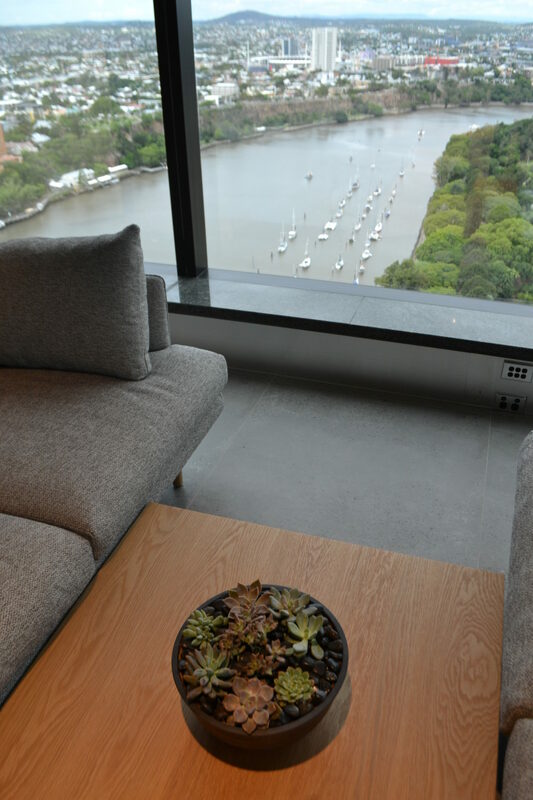 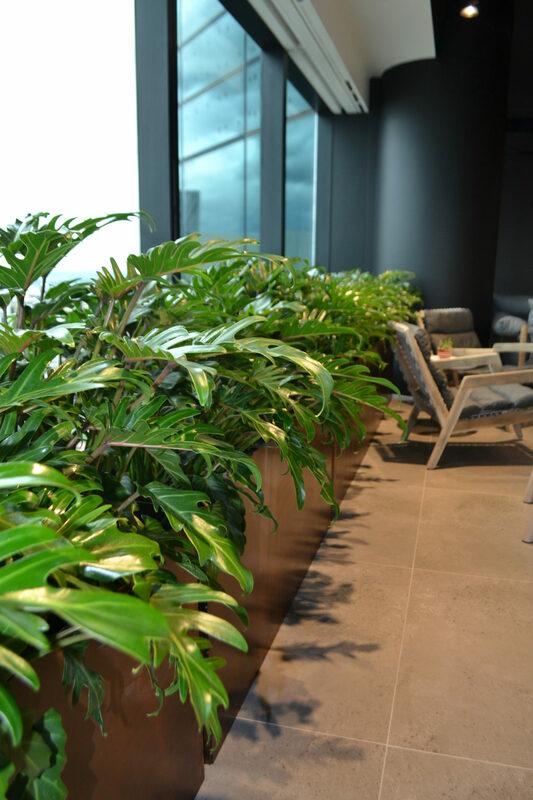 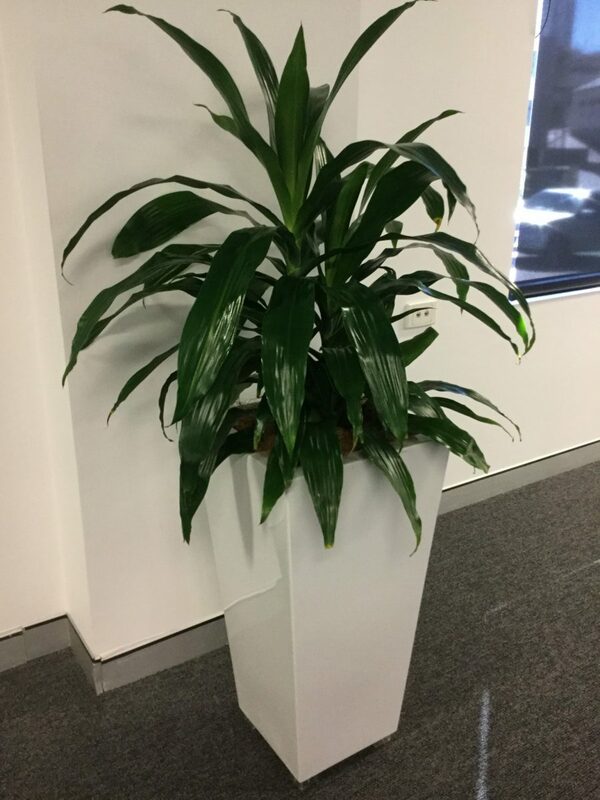 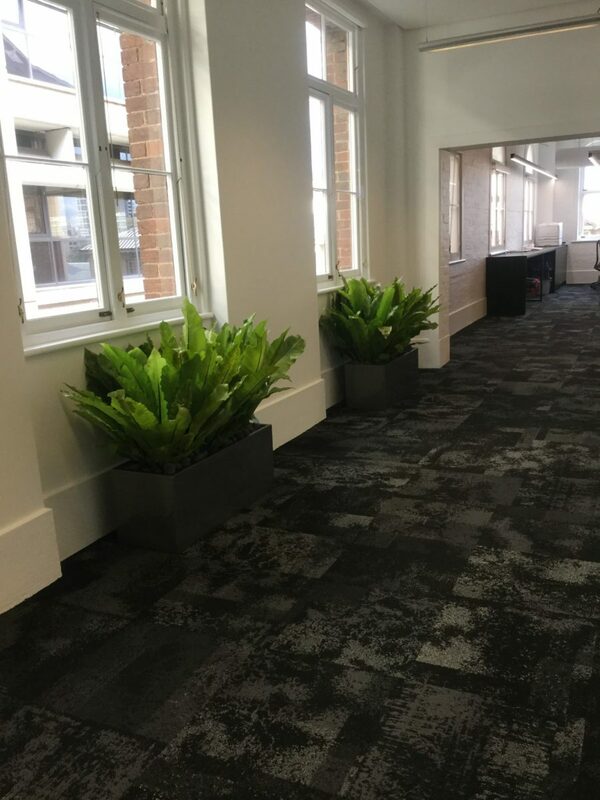 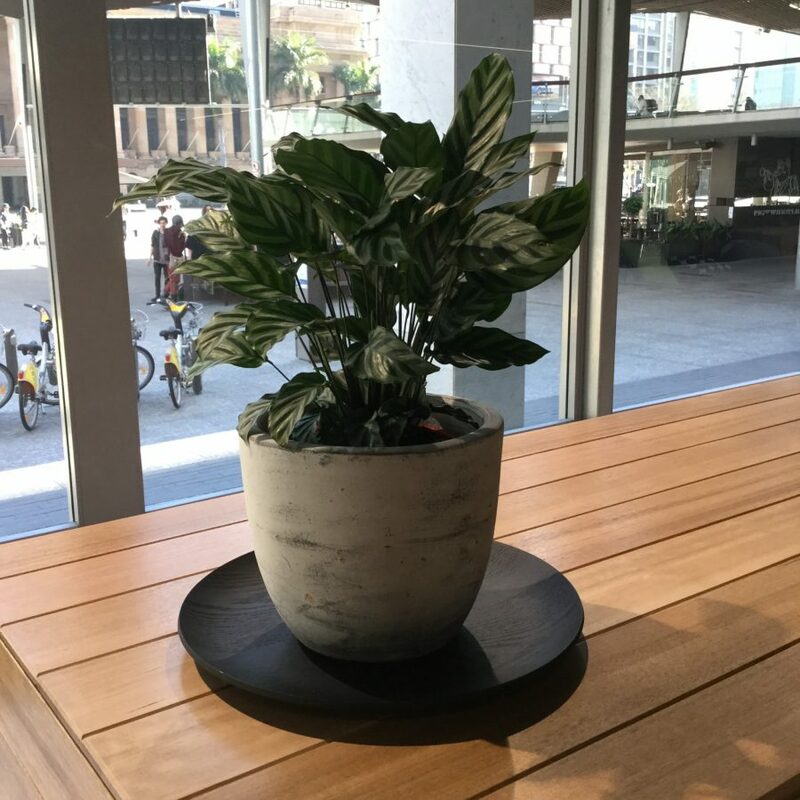 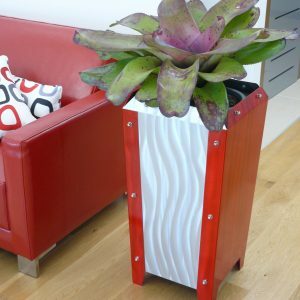 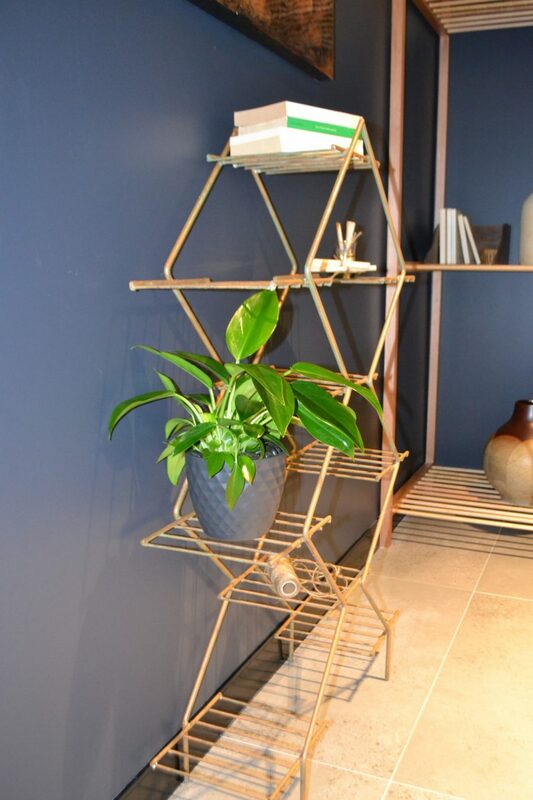 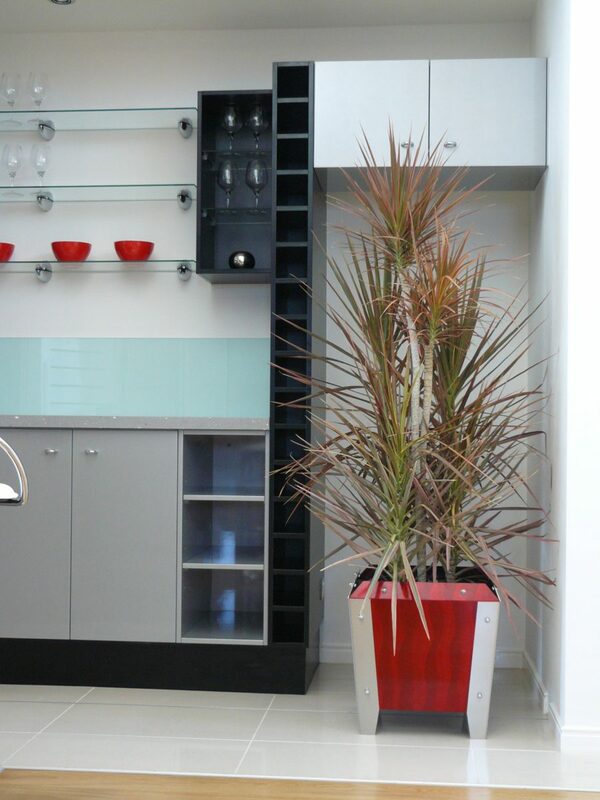 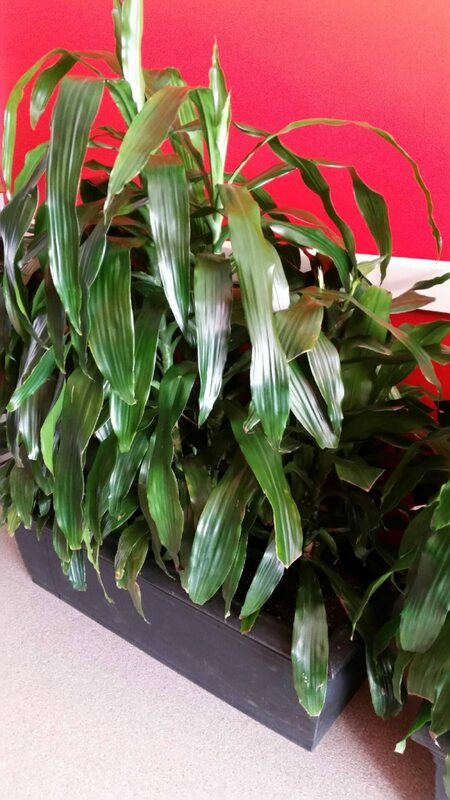 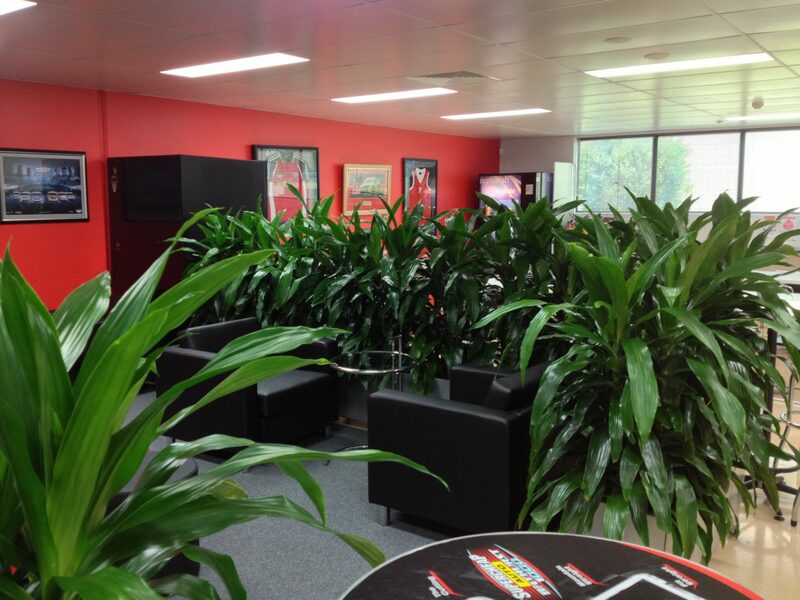 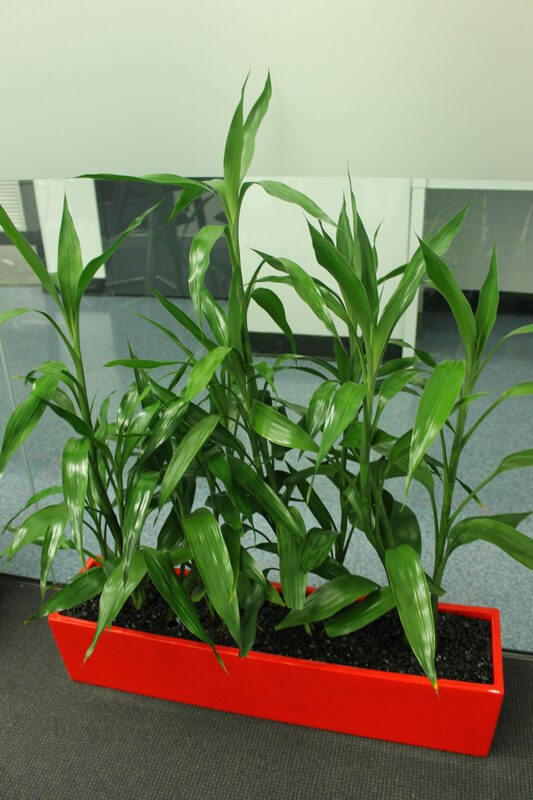 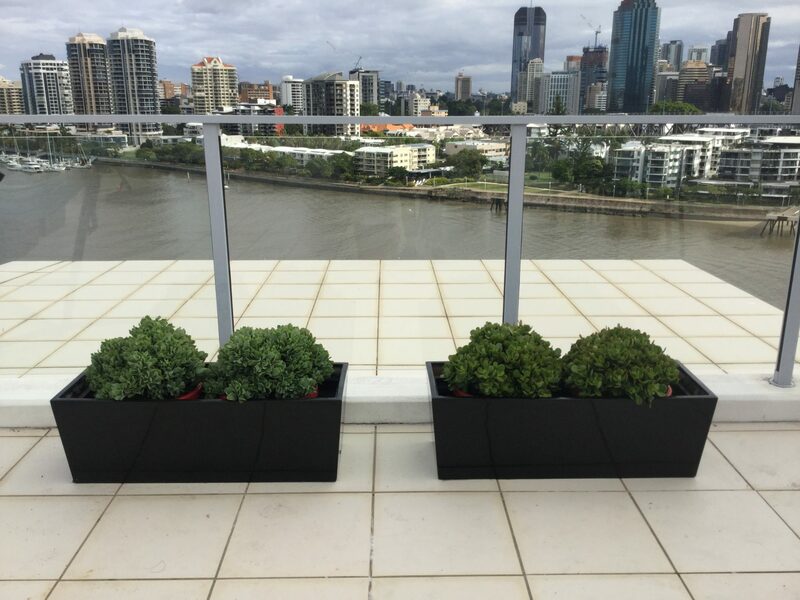 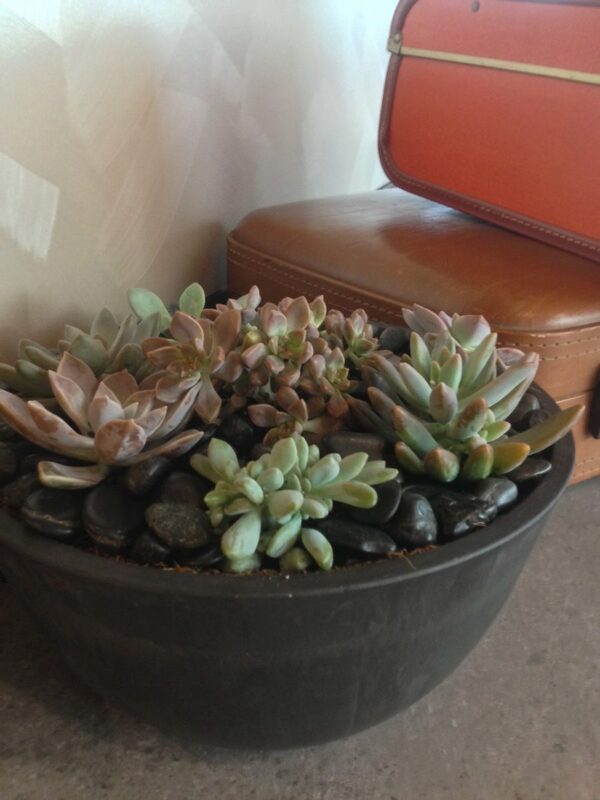 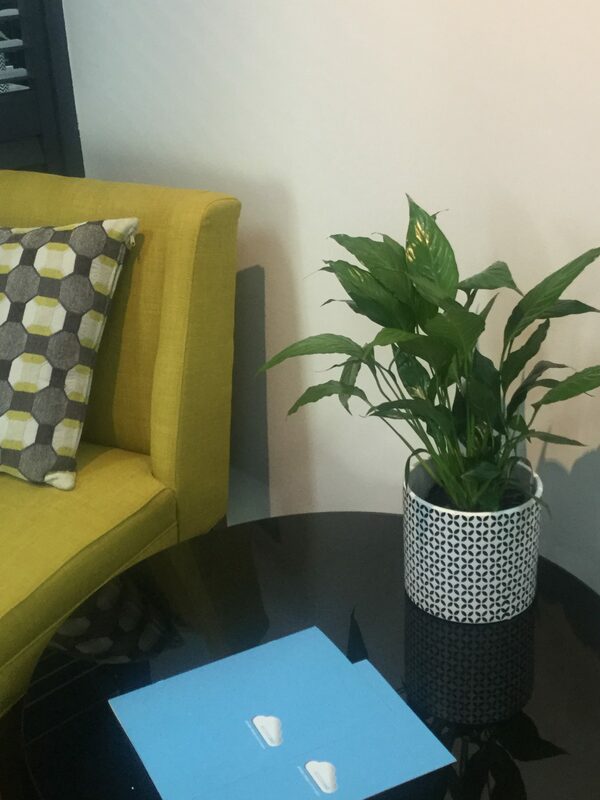 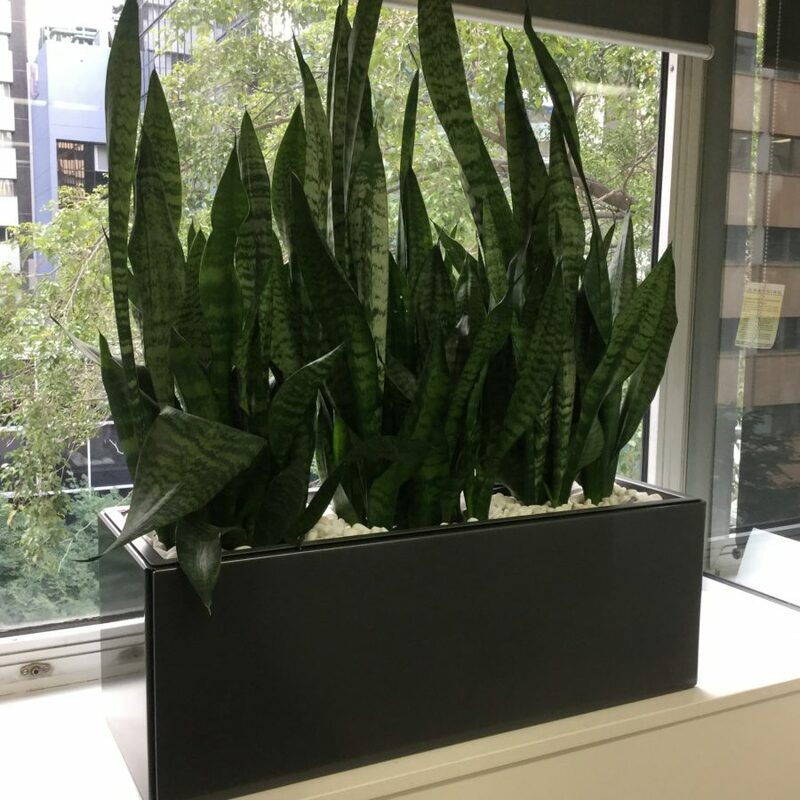 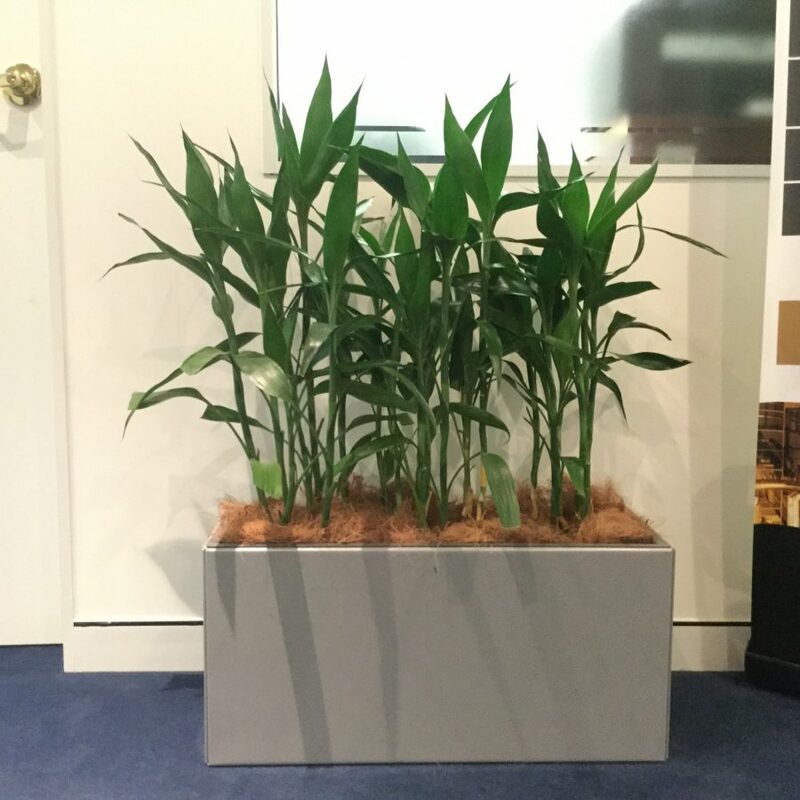 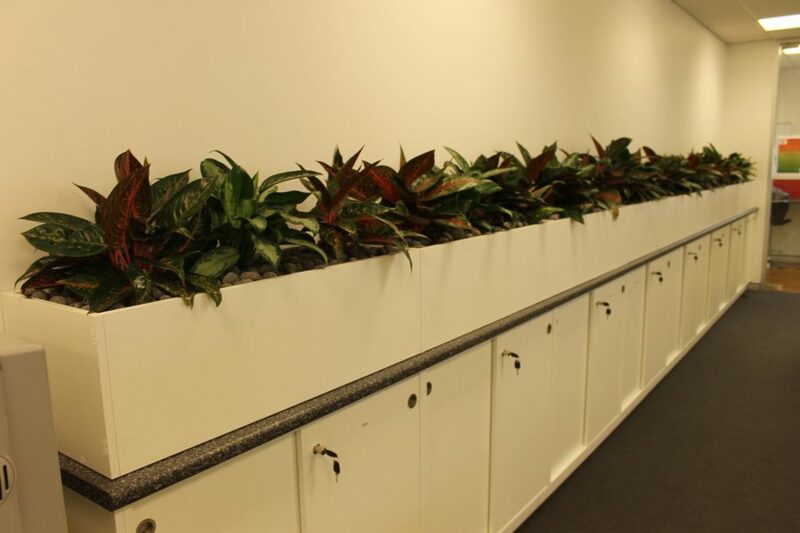 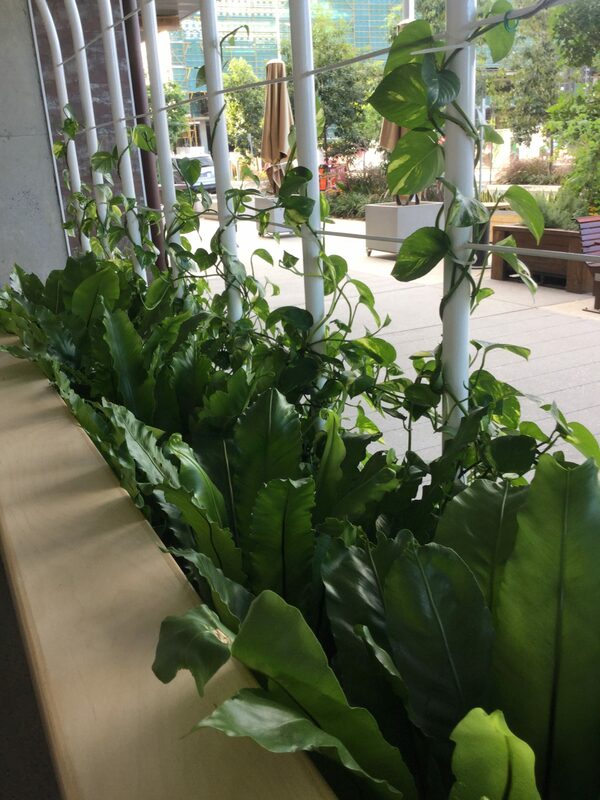 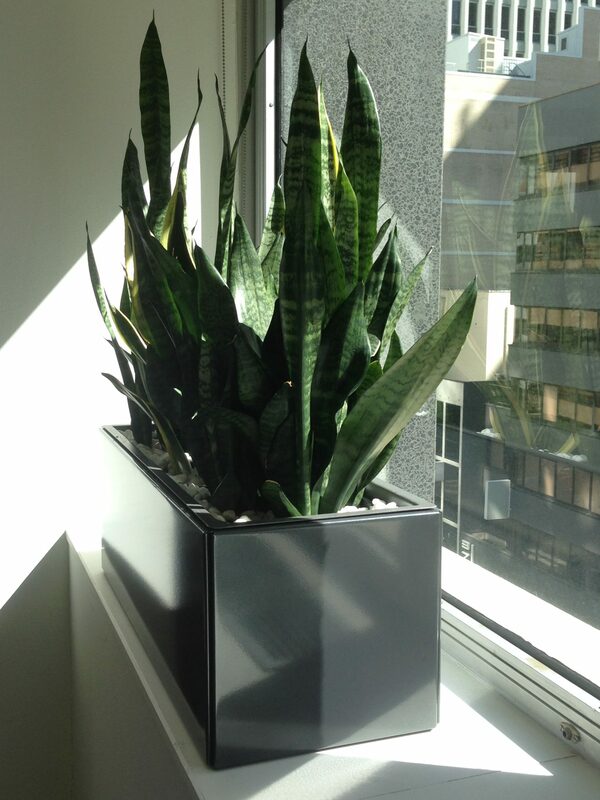 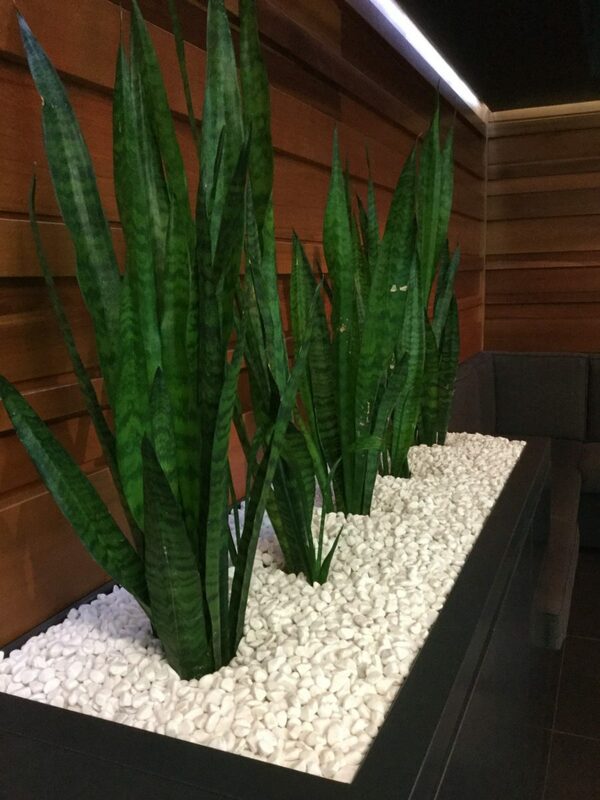 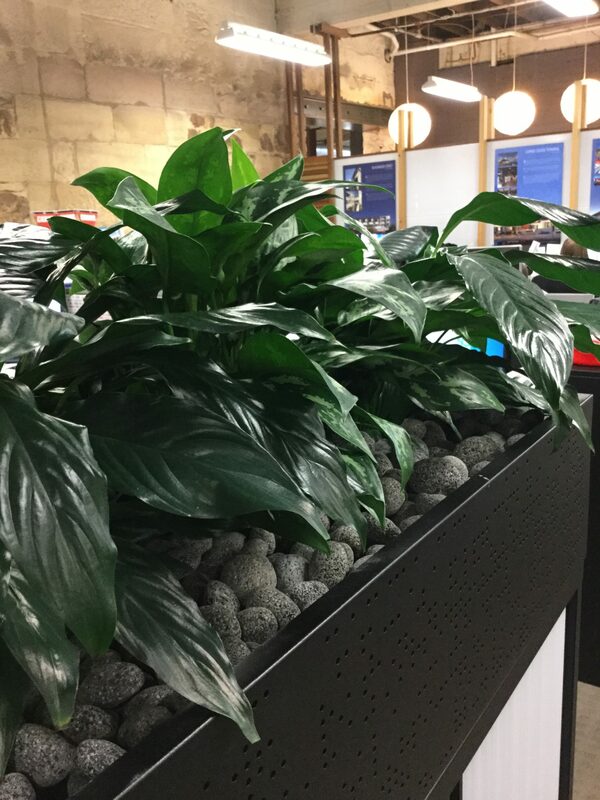 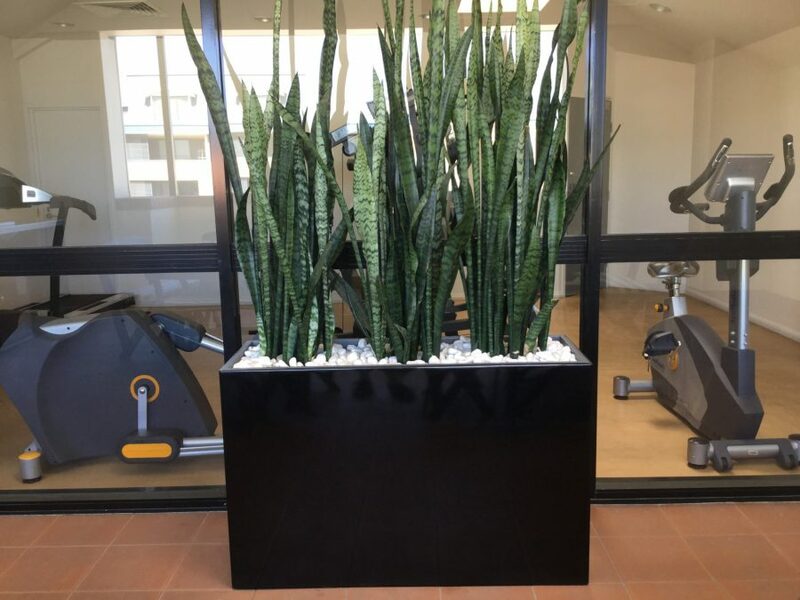 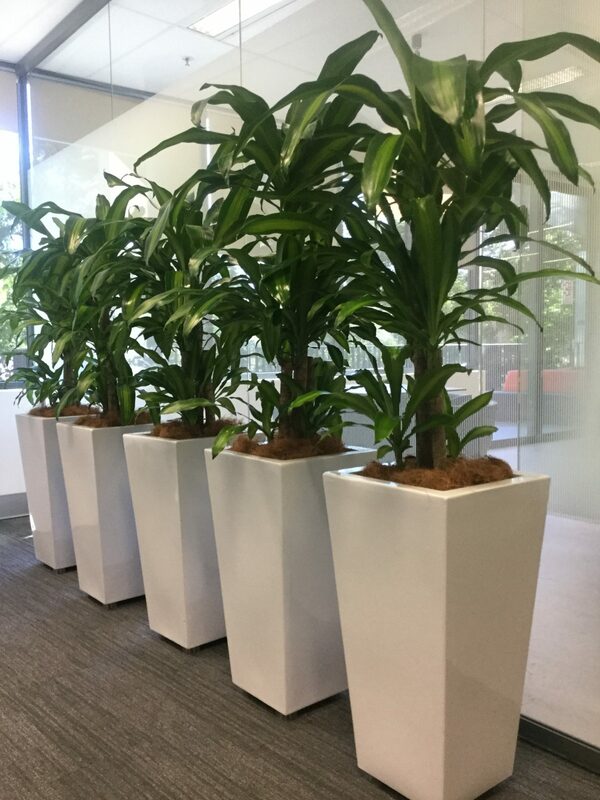 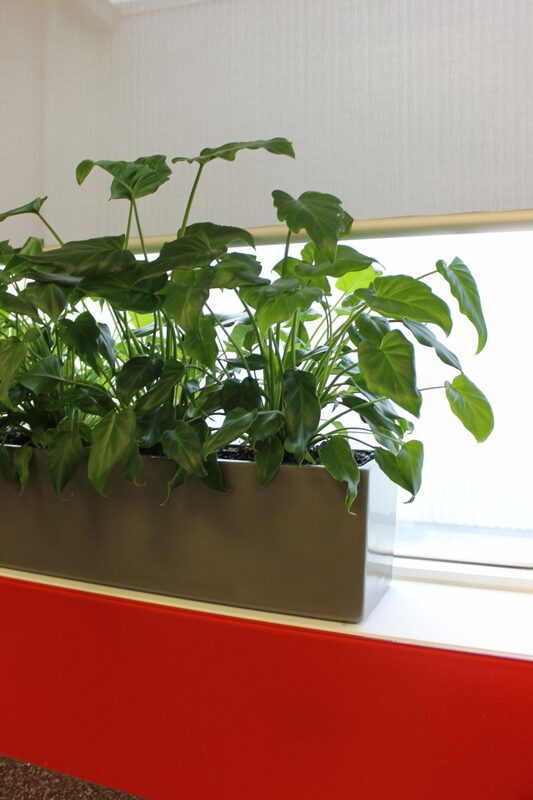 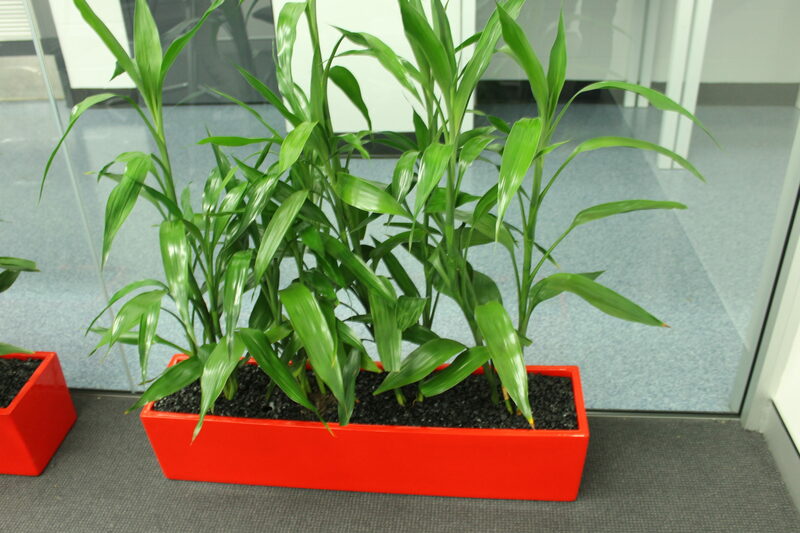 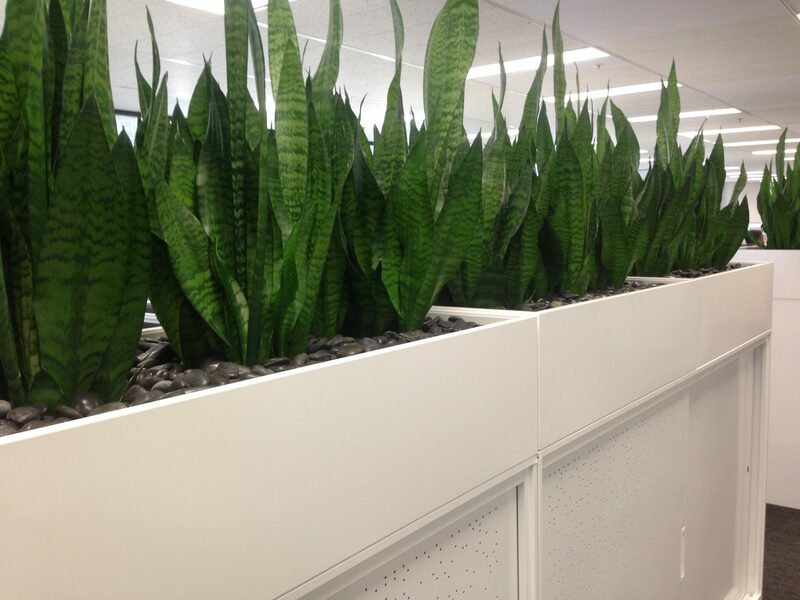 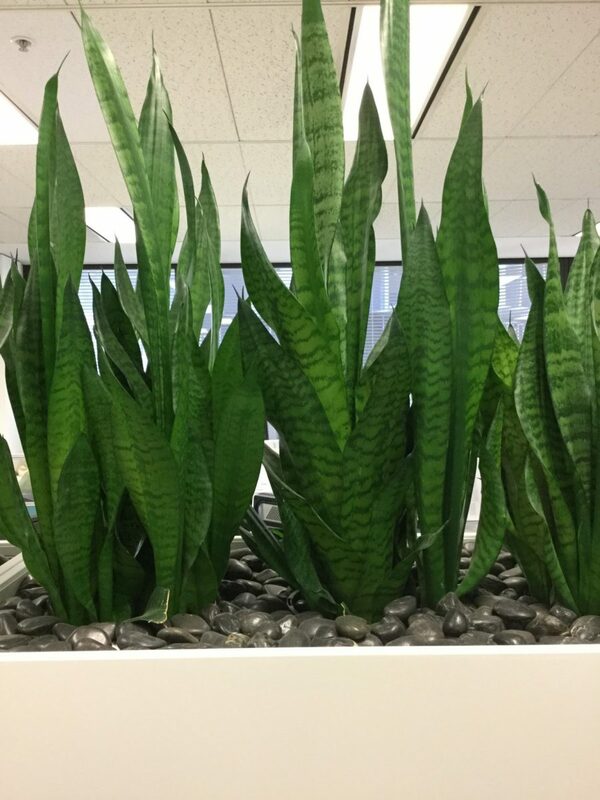 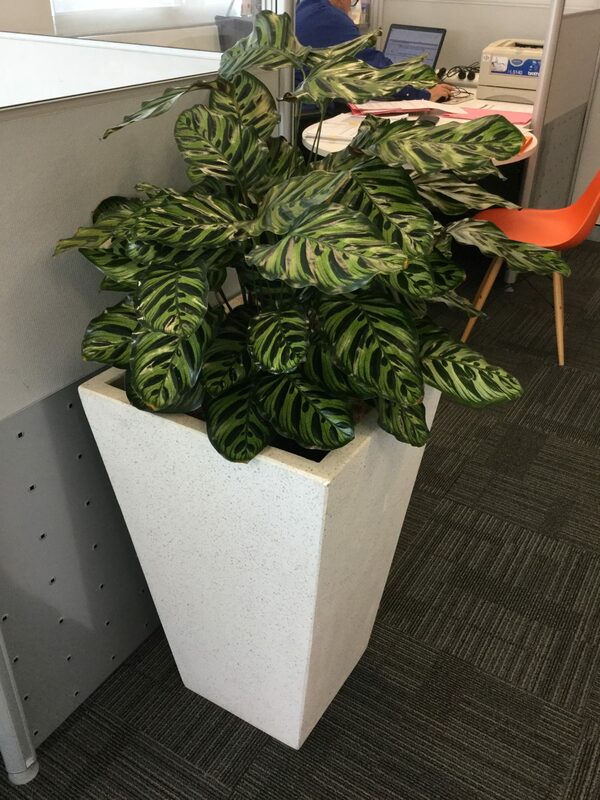 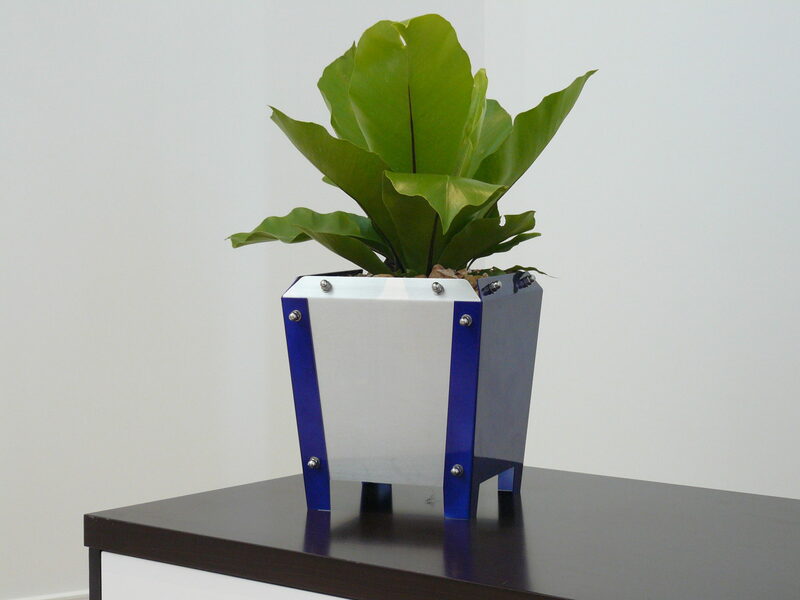 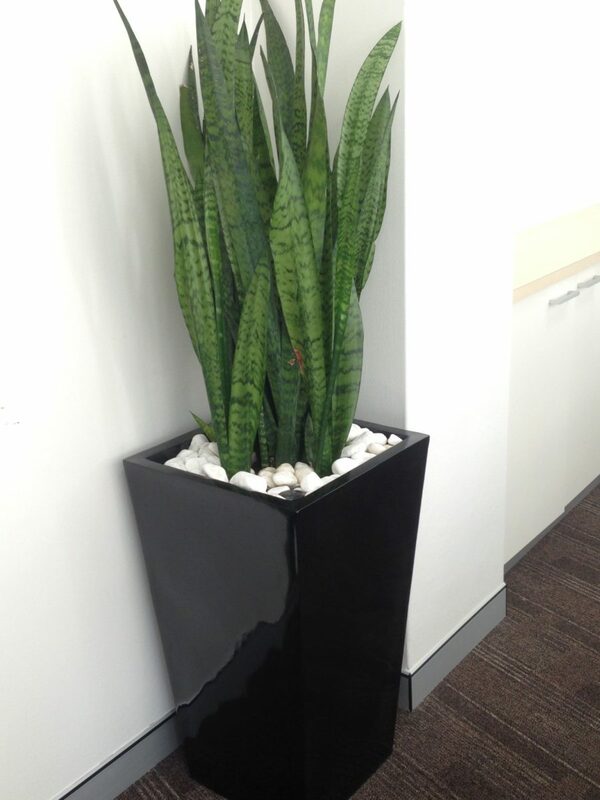 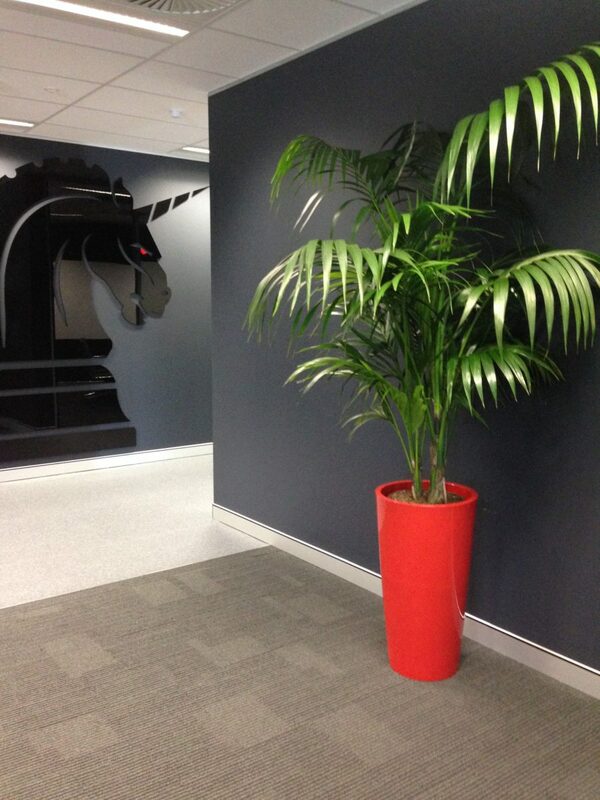 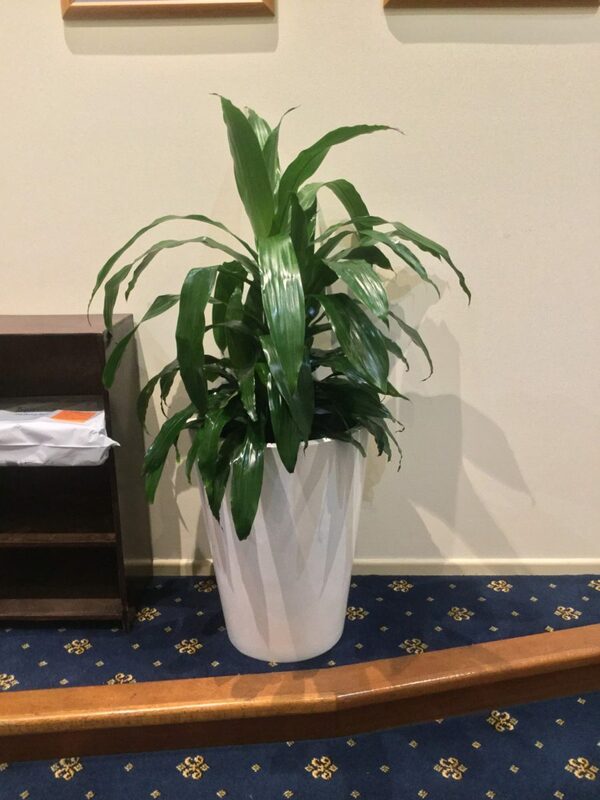 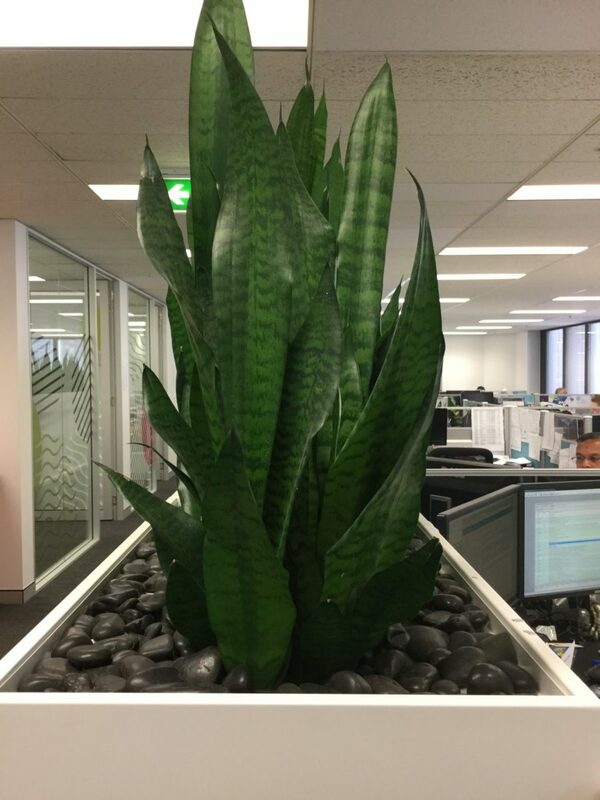 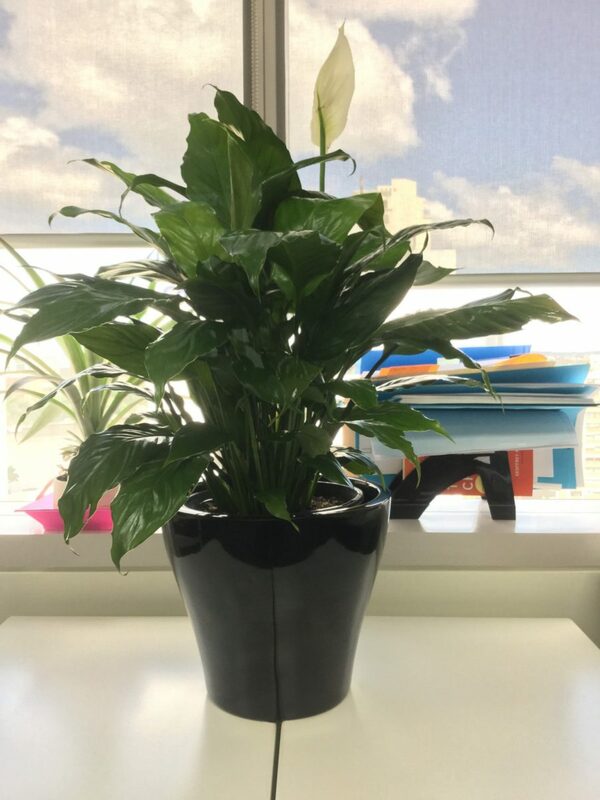 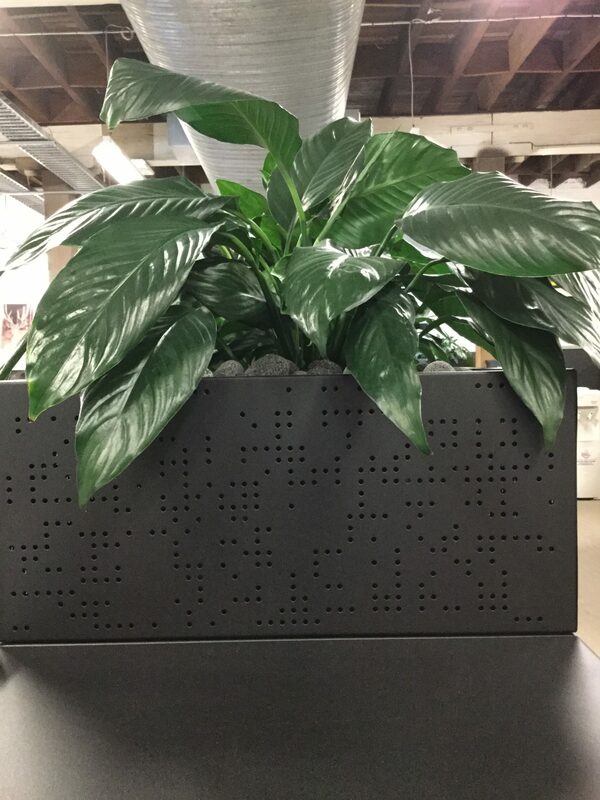 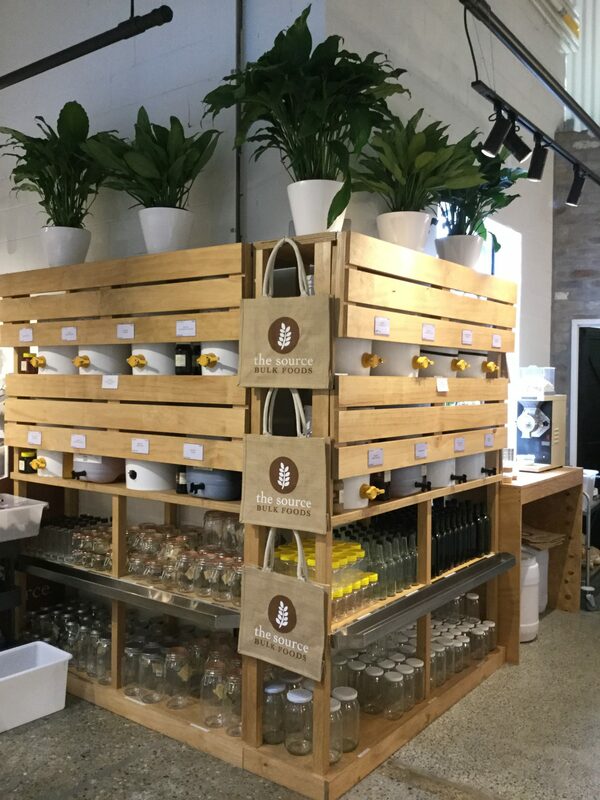 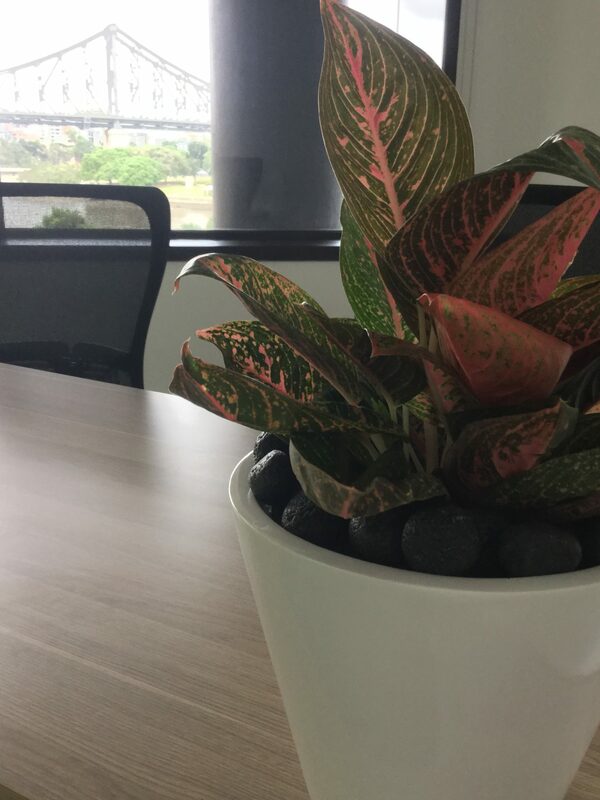 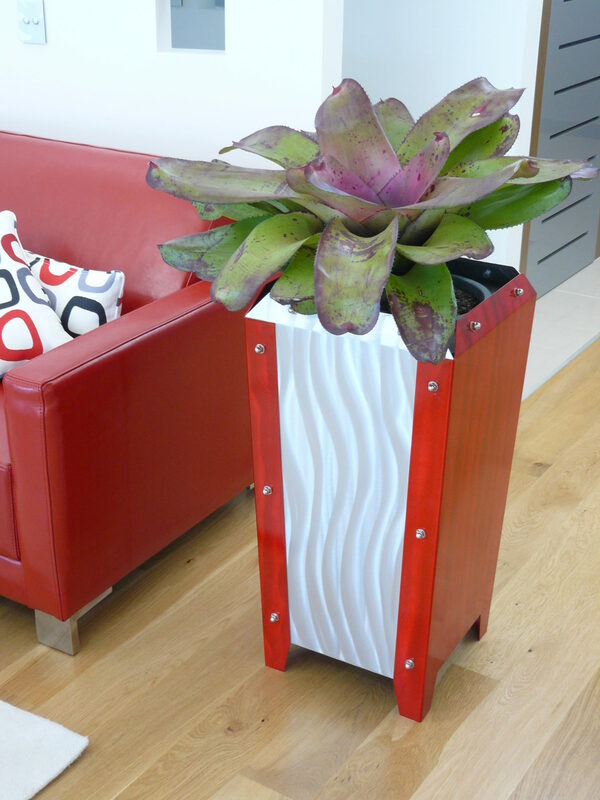 Commonly used as a desktop feature plant in a reception, foyer or beak-out/lunch area. 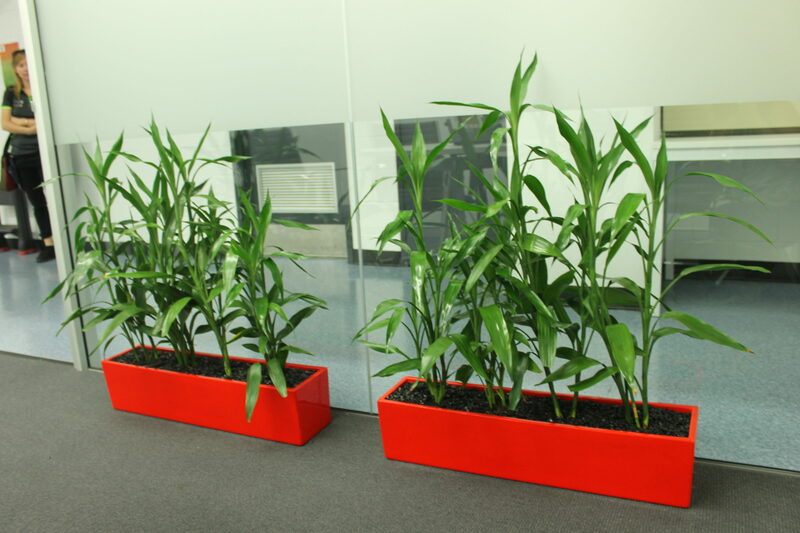 Can also provide a great screen when used in long planter boxes. 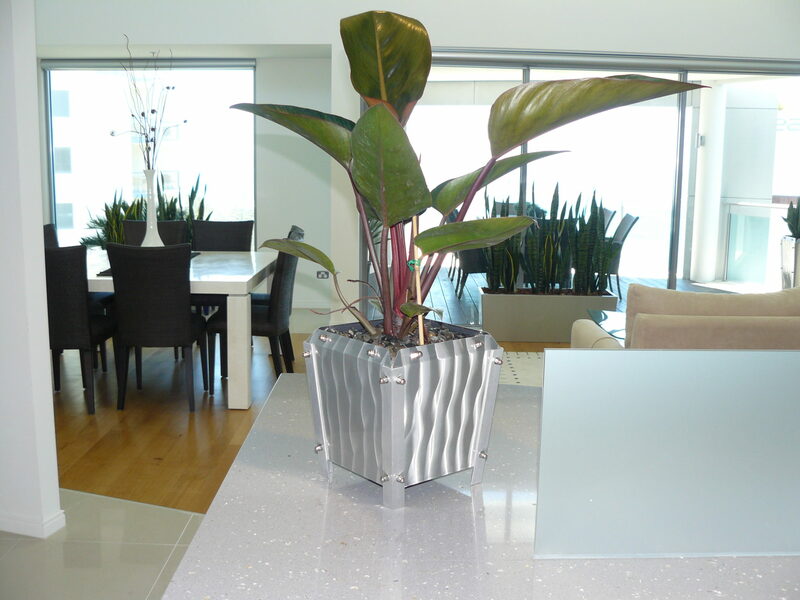 Areas with high amounts of natural light are ideal, but will tolerate medium light areas. 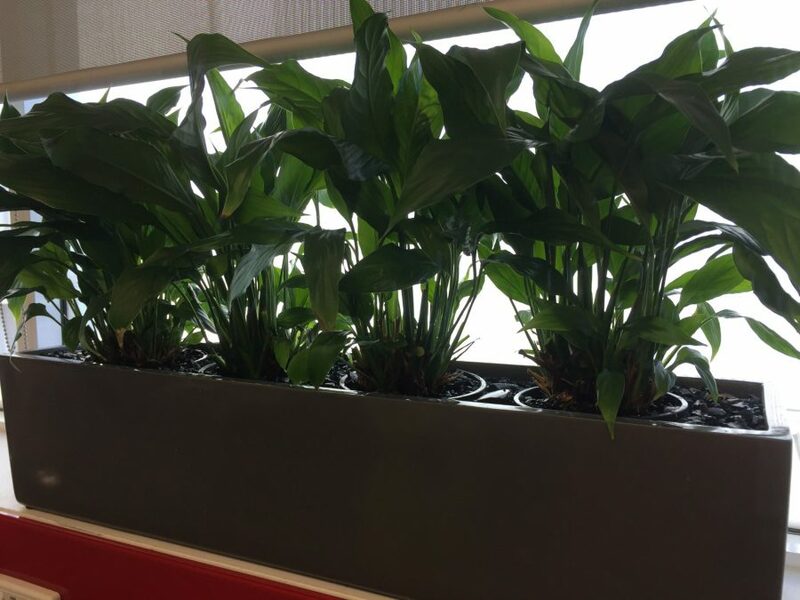 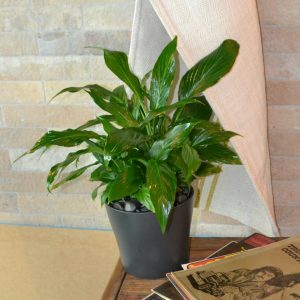 Commonly known as the peace lily or spath, these plants are a wonderful choice for medium light areas. 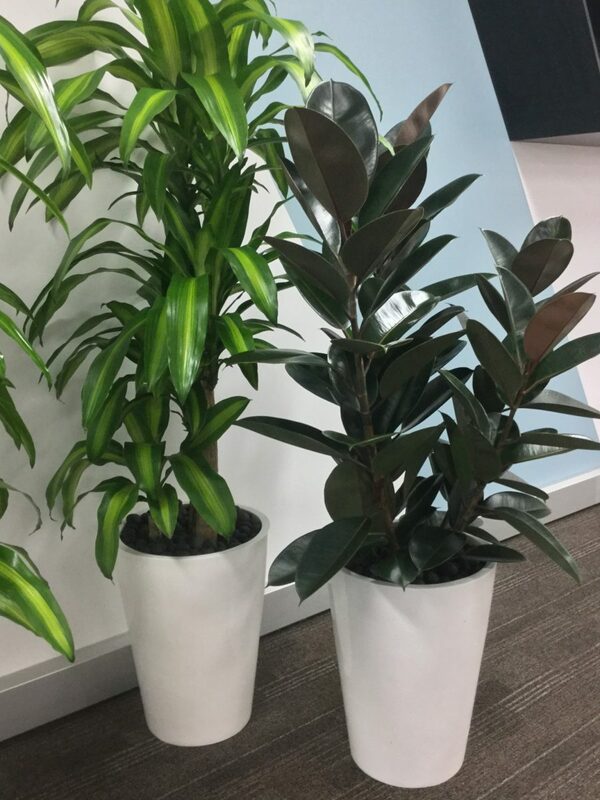 Native to tropical regions of the Americas and south-eastern Asia, they have striking dark-green, oval, glossy leaves that arch away from the plant’s base with white flowers emerging from the leaf stalk. 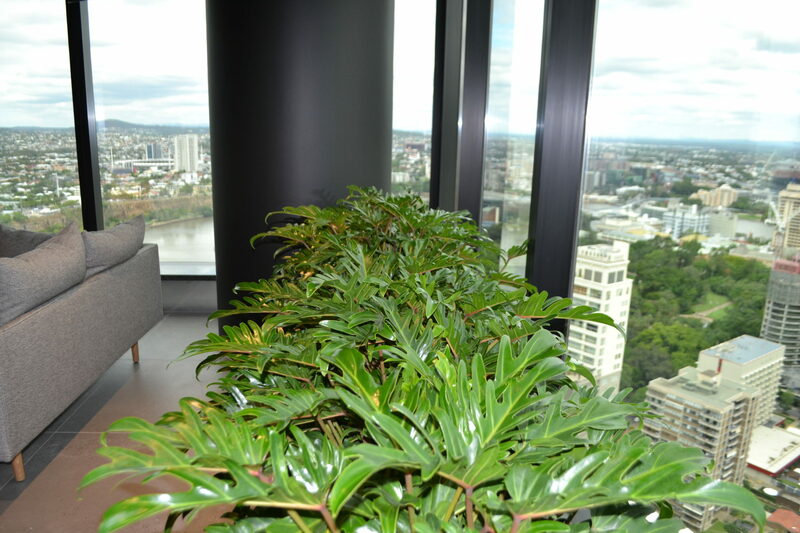 This is still one of the most attractive foliage plants even when not in bloom. 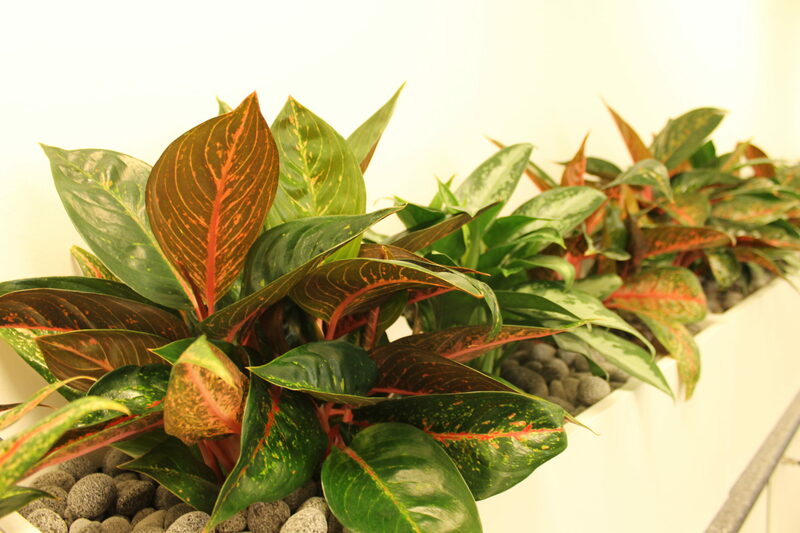 Calatheas are some of the most beautiful and striking tropical foliage plants available. 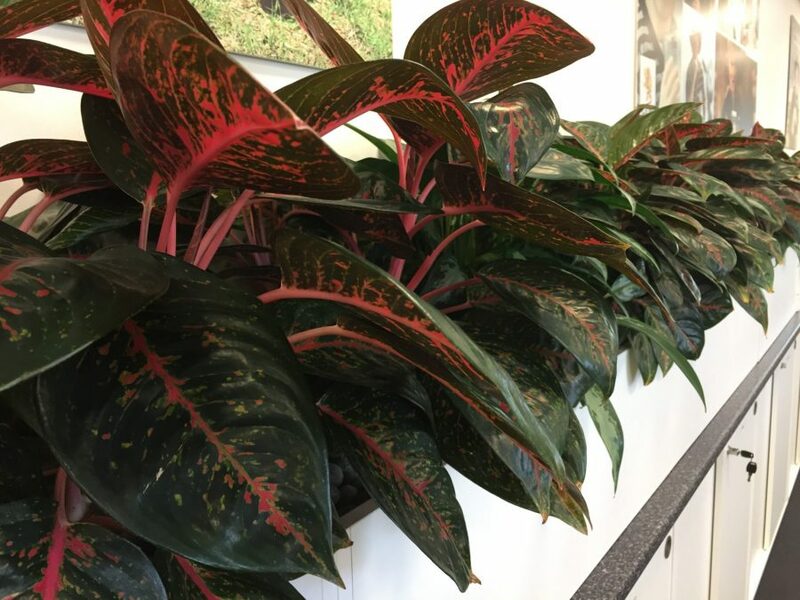 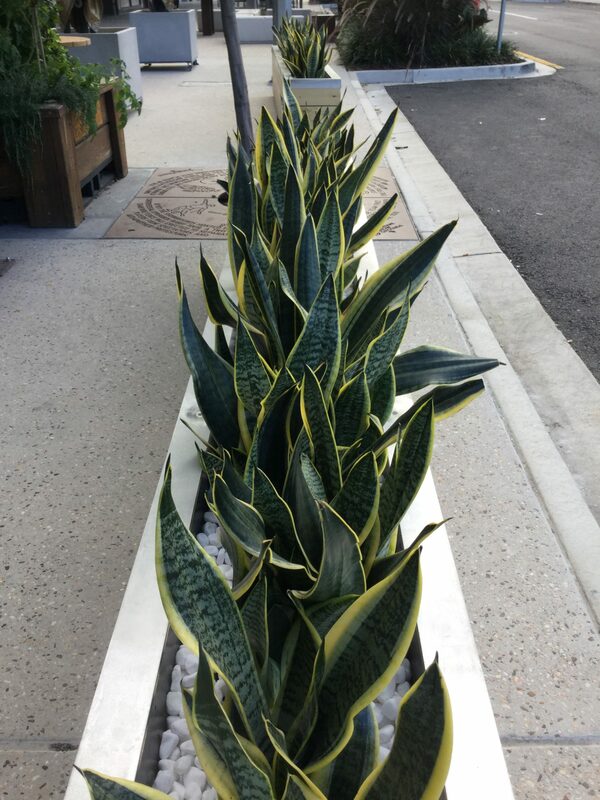 Native to the tropical Americas, these decorative plants generally have boldly marked, oblong shaped leaves that rise up from a central clump on long upright stems. 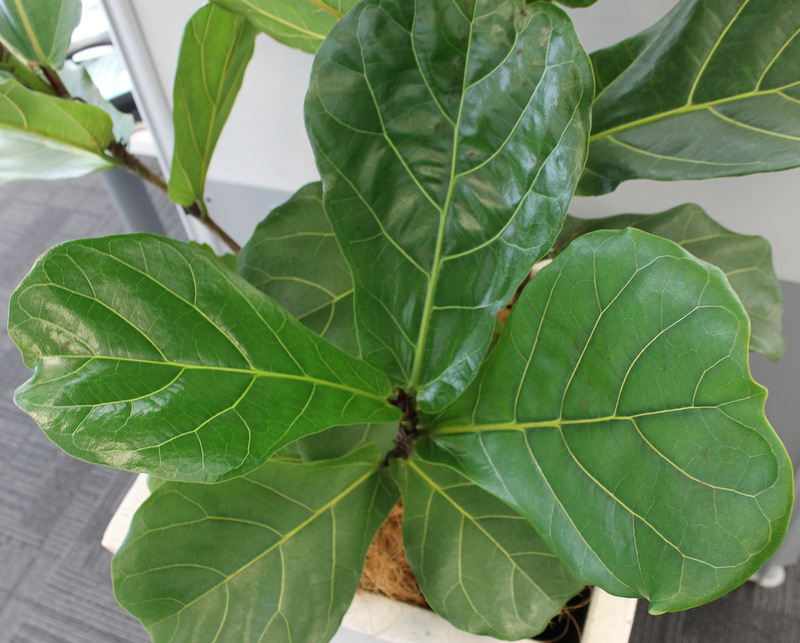 As these leaves mature they can arch out away from the centre, making way for new growth. 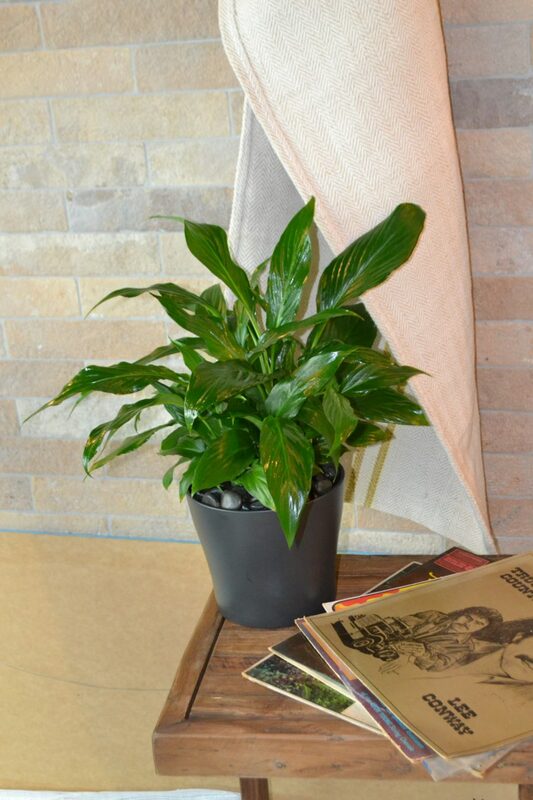 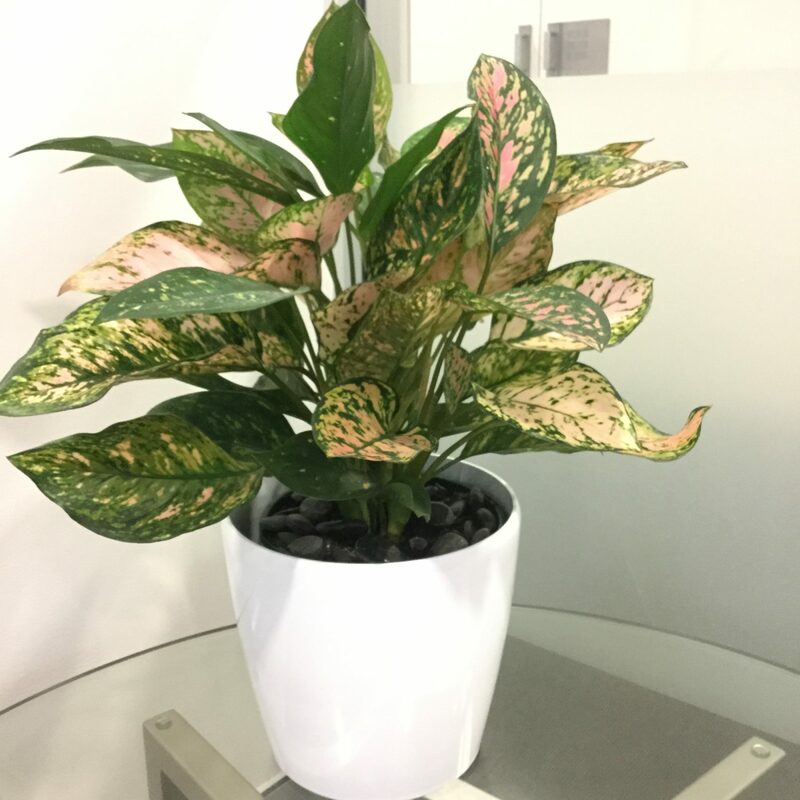 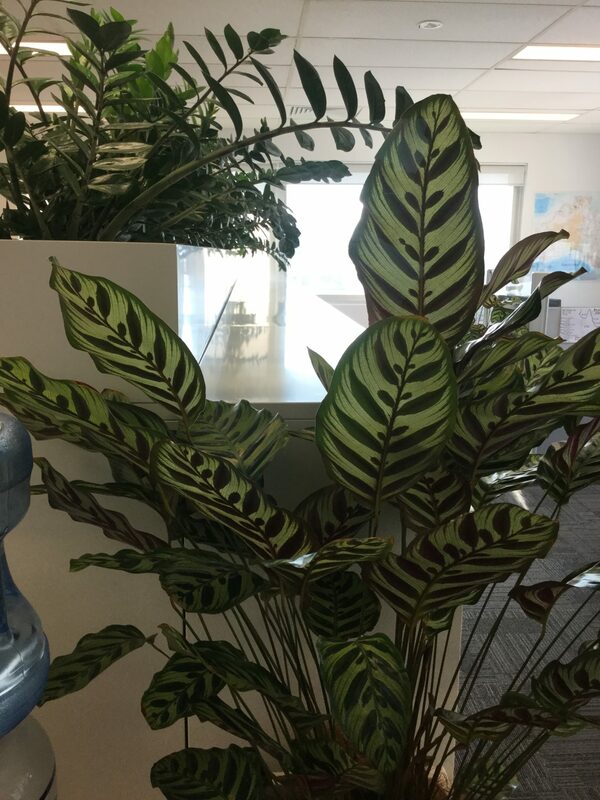 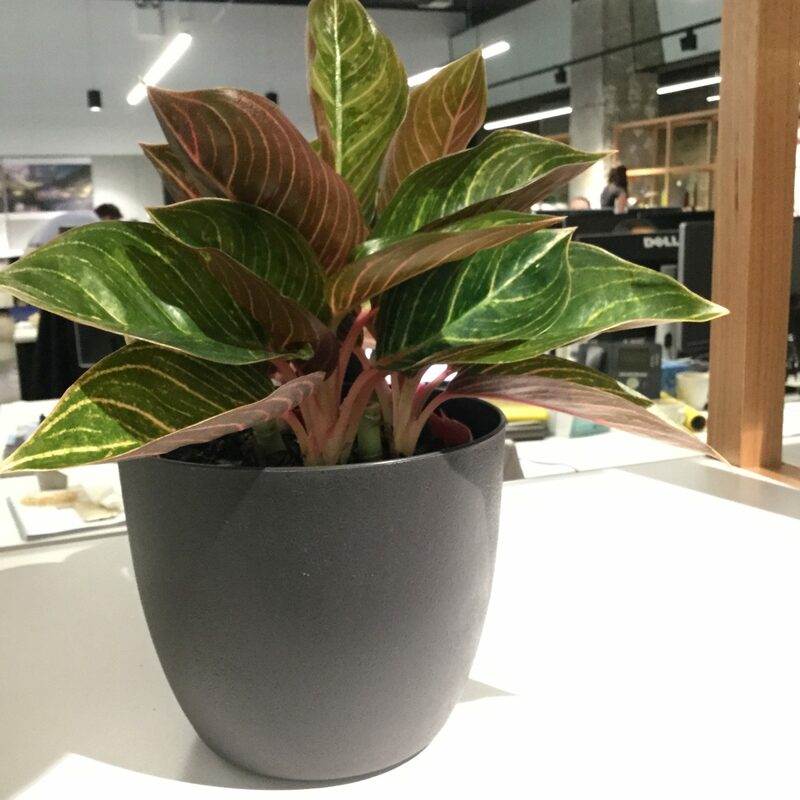 For a Calathea to thrive as a house plant, high humidity, warm temperatures and adequate water is needed. 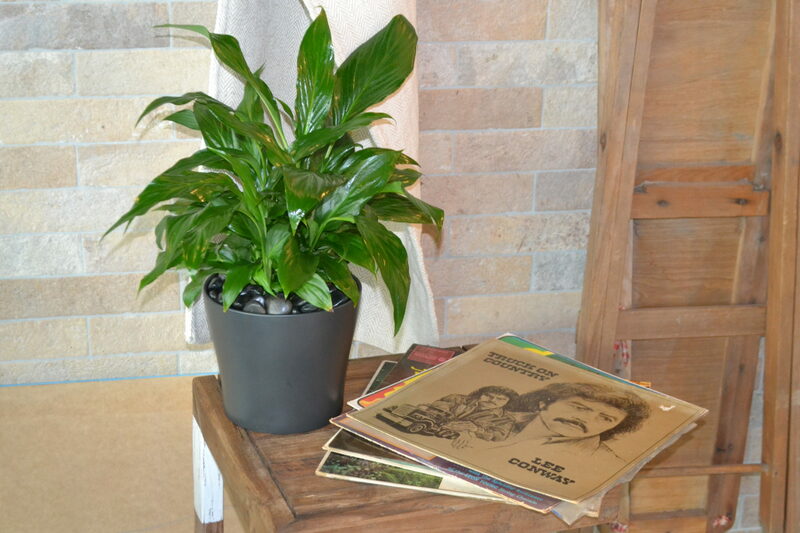 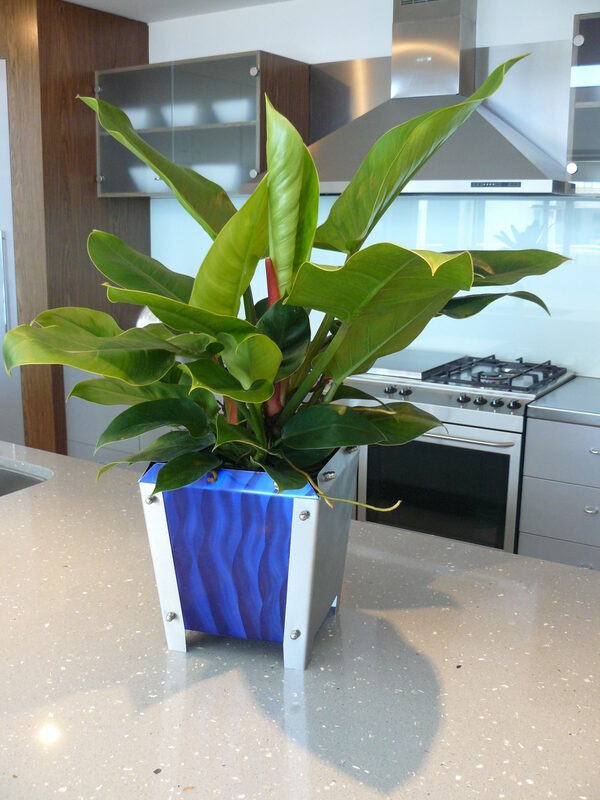 Philodendron’s have some of the most beautiful, glossy foliage of any of the indoor plants. 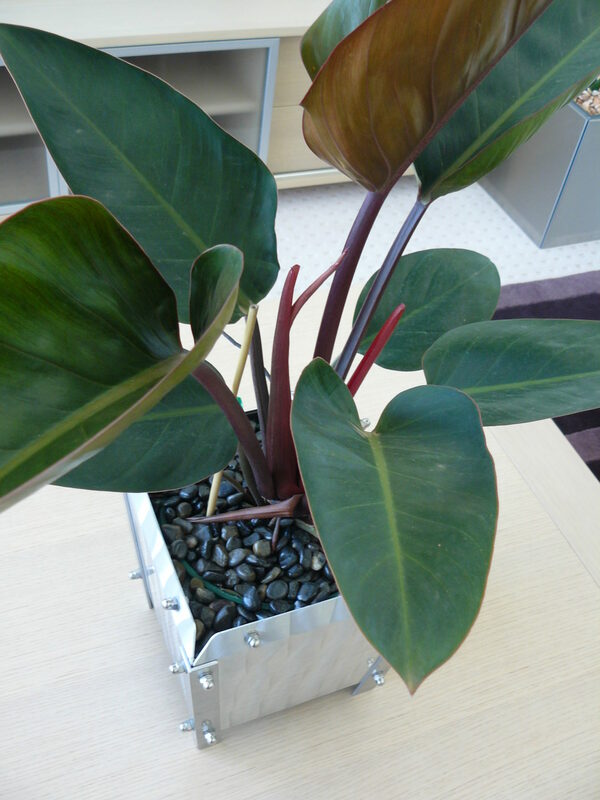 Large, thick, shiny green (and in philodendron Xanadu, heavily lobed) leaves are sturdy with an upright habit. 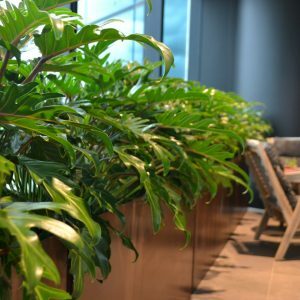 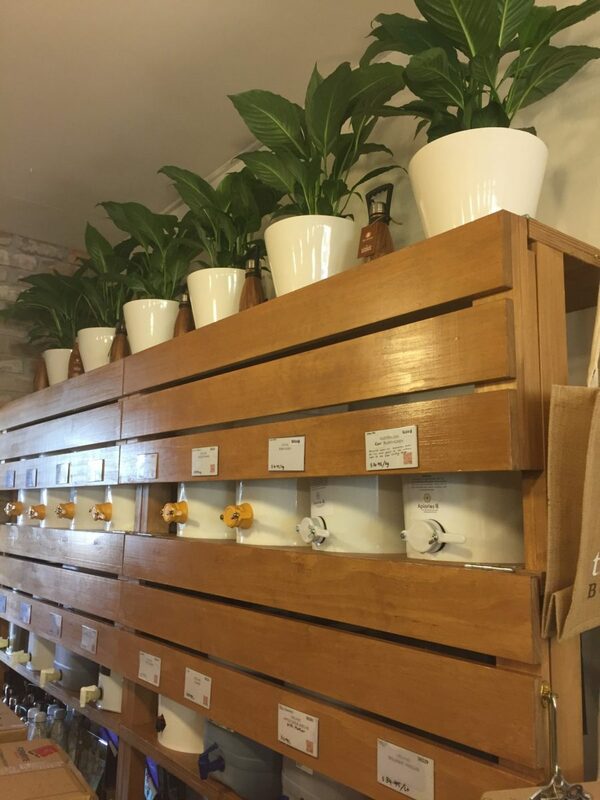 Native to the tropical Americas, these lush looking plants can add a touch of the exotics to any interior setting.